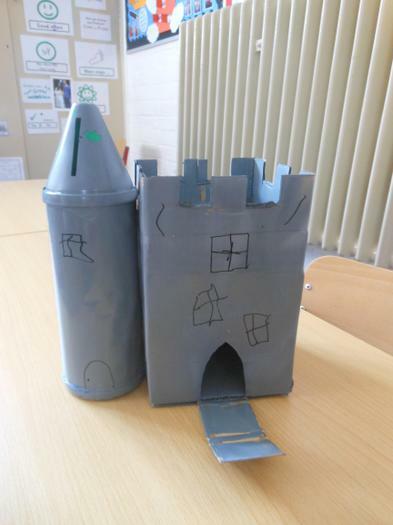 Ever wondered who lived in castles? 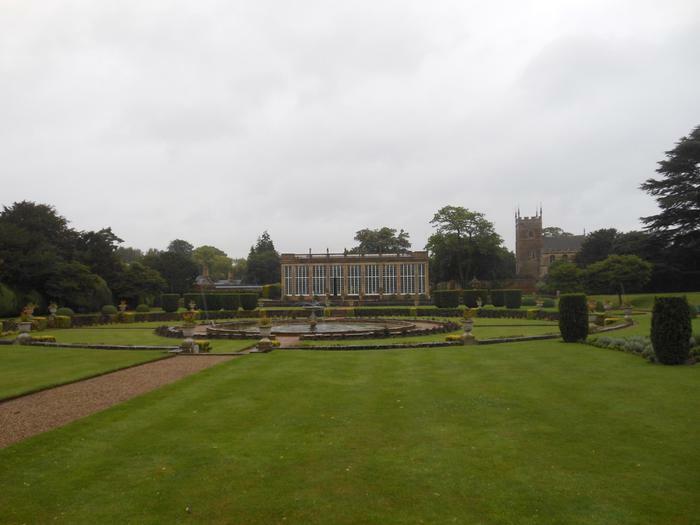 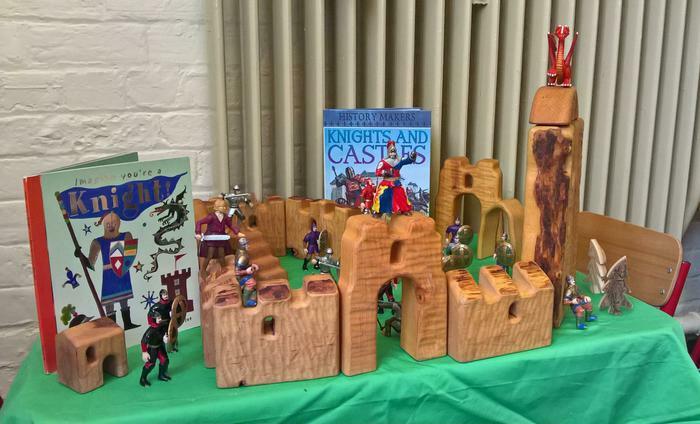 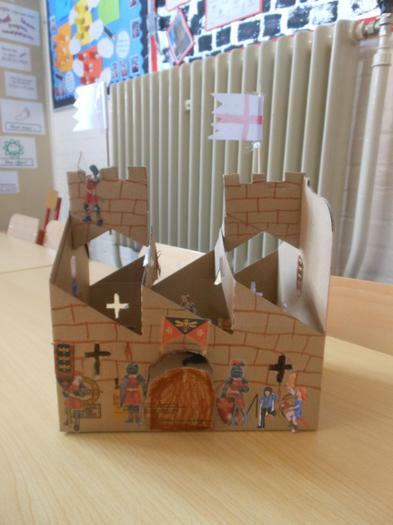 Who built the first castle in England? 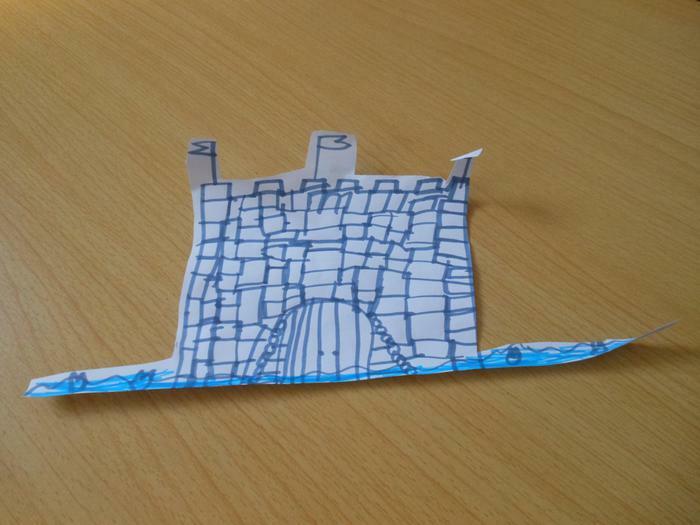 What made castles hard to destroy? 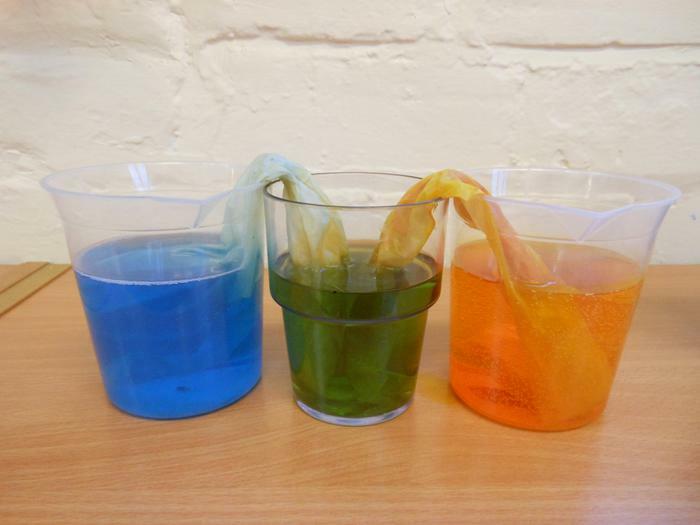 what made them so strong? 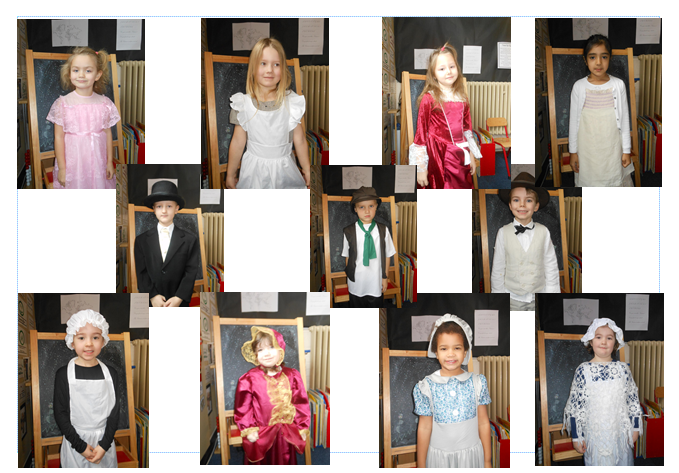 Who was Elizabeth I and Queen Victoria? 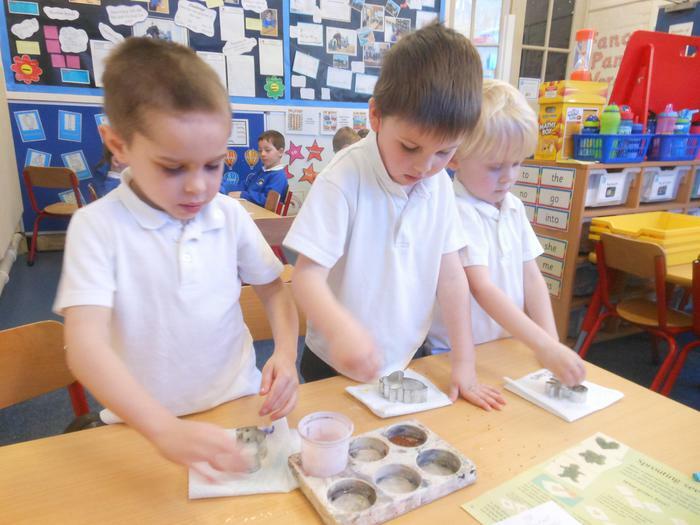 Who is Elizabeth II, Prince Charles, Prince William and Prince George? 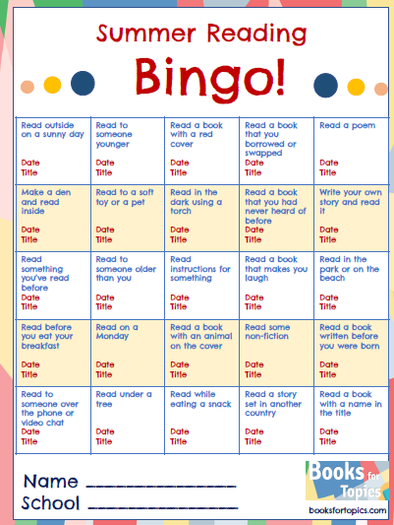 How many of the reading bingo challenges can you complete during the summer holiday? 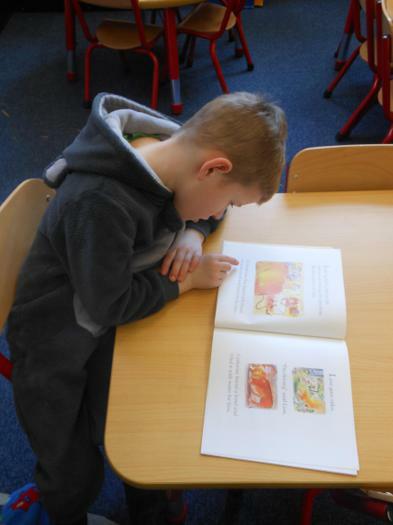 Remember to read books independently, share books with a grown up, brother or sister, a grandparent or friend. 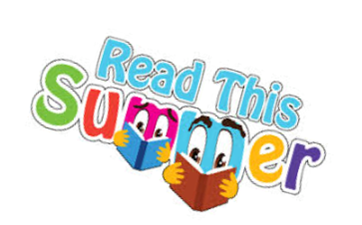 Remember to bring your completed Reading Bingo cards to school in September to receive your house points and certificates. 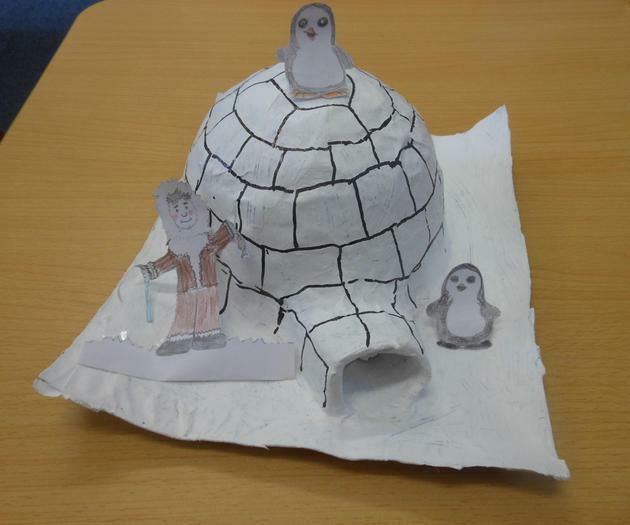 A big thank you and well done to both children who have brought home learning projects to school. 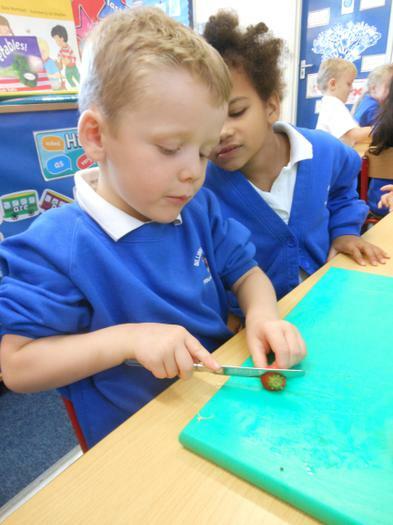 a little help from their grown ups when using sharp scissors or knives to cut some of the fruits. 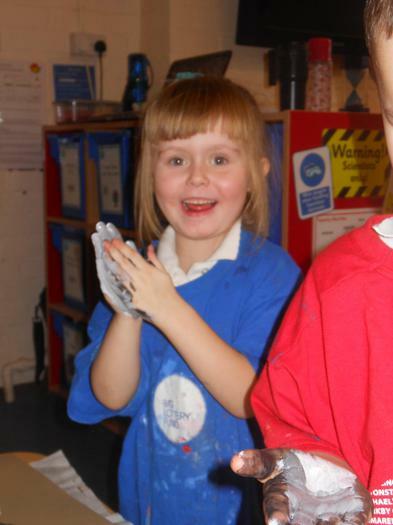 Watch this space for more home learning project photos. 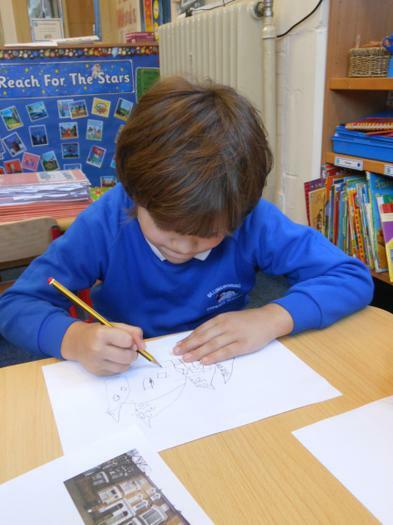 During Arts and International Fortnight, we have been finding out about the country of Tanzania in Africa. 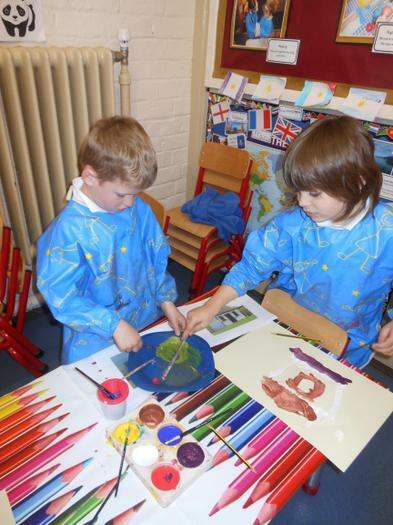 We identified the 7 continents and labelled a map of the world. 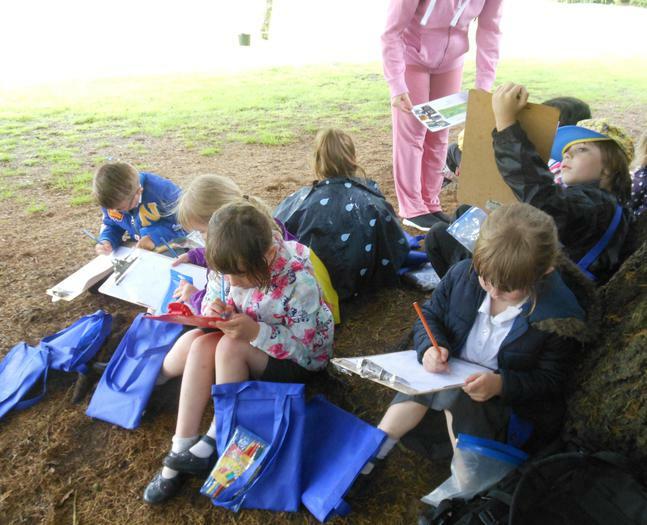 We then used the atlases to find Africa. 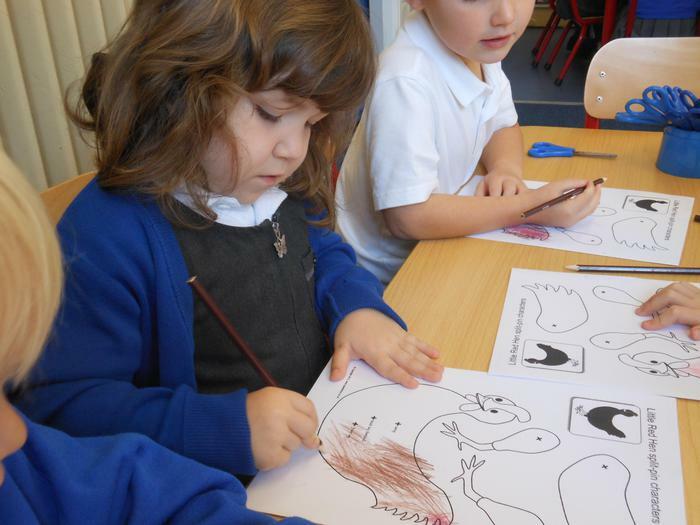 We used the key to identify some of the animals that can be found in Africa. 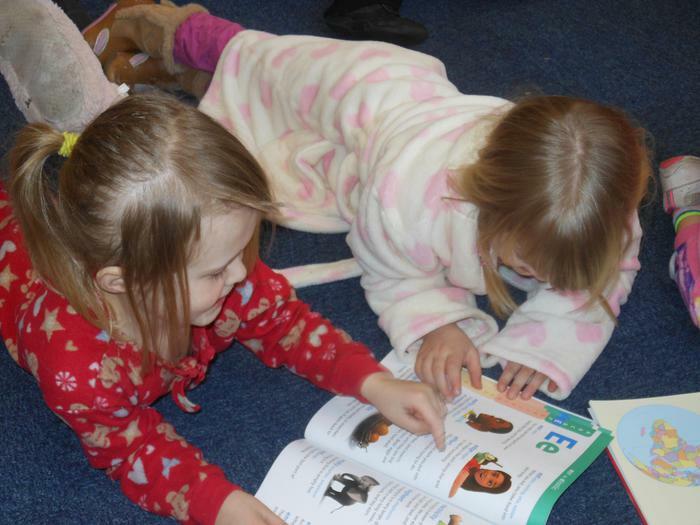 In Literacy, we enjoyed reading 'Why Elephant has a Trunk.' 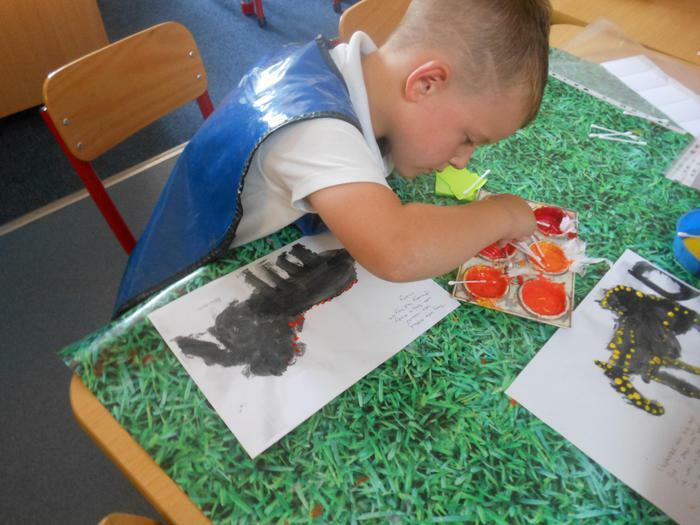 We designed our own colourful elephants and used adjectives in our writing to describe the elephants. 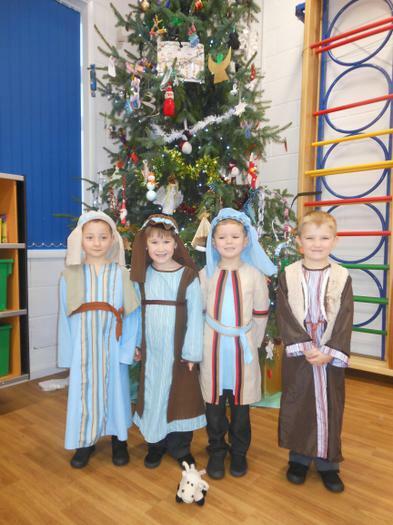 We were very excited to have some special visitors at school on Wednesday. 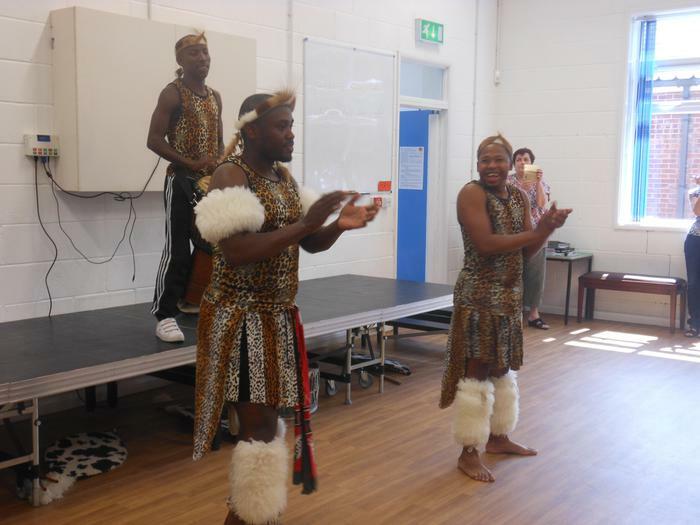 Watching the Zulu men was truly amazing and we really enjoyed our dance workshop. 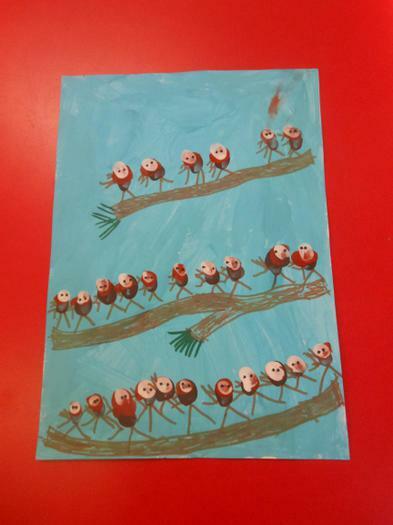 Edward Tingatinga became one of the most famous artists in Africa. 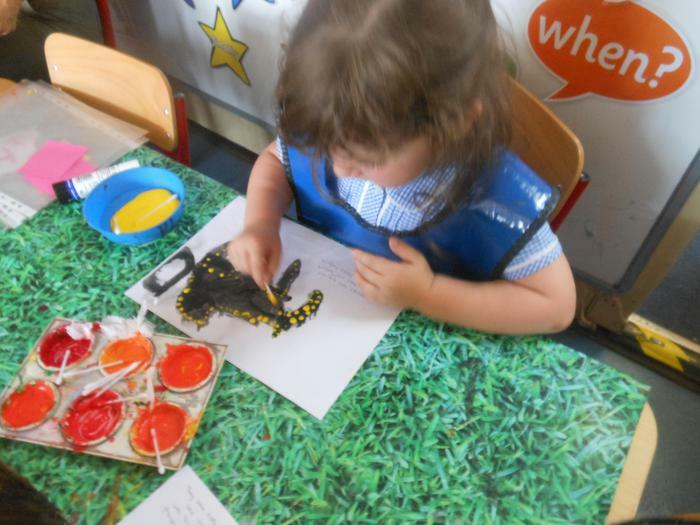 We carefully painted dots onto our silhouette animals. 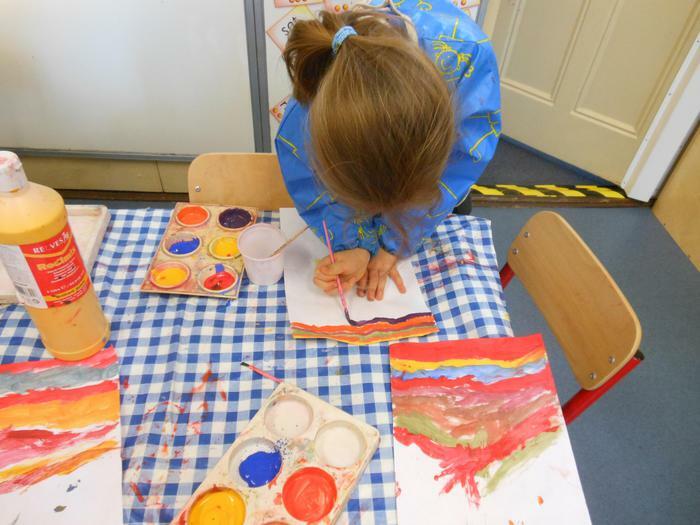 We also explored the colours, shapes and patterns of Africa. 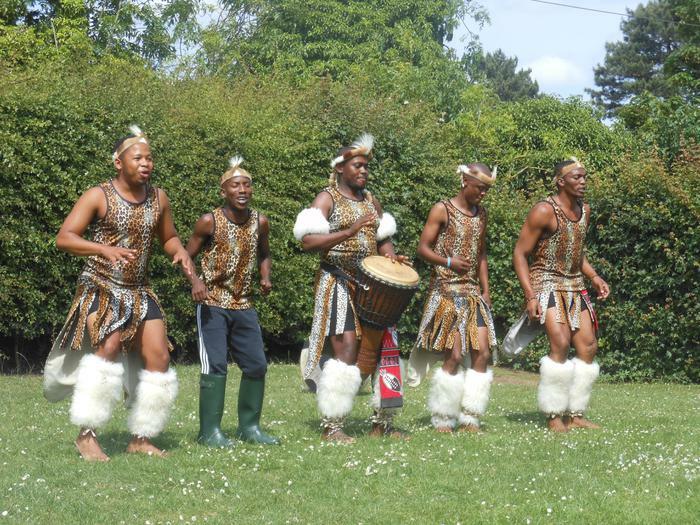 There are many different styles of cloth across the African continent due to the different tribes and groups. 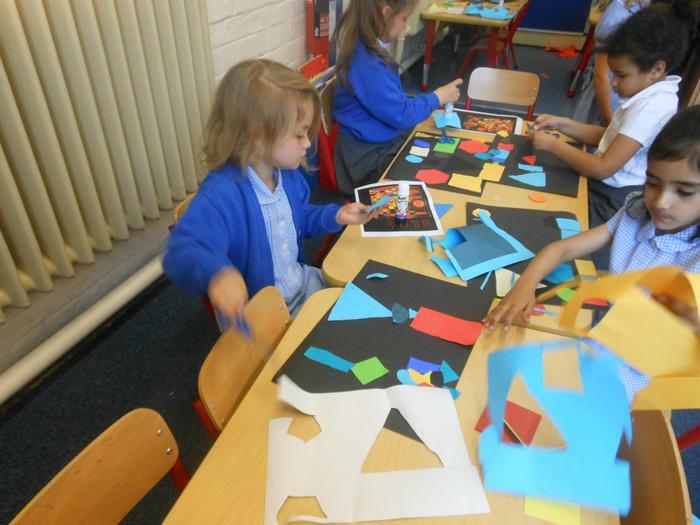 We used a template to cut out patterned shapes of paper and create African collages. 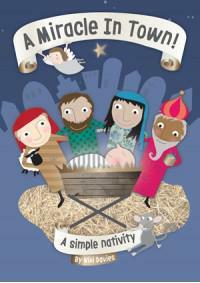 Just one more sleep to go!! 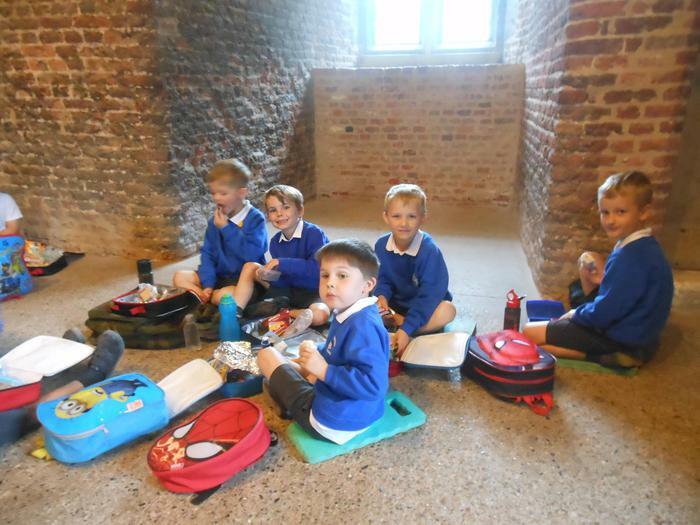 to visiting Tattershall Castle. 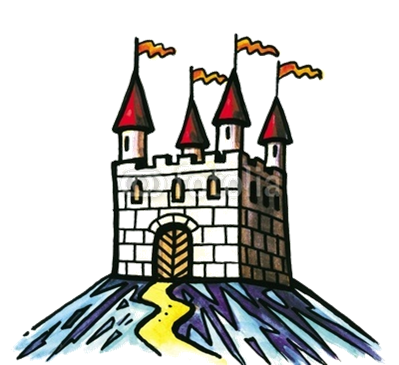 The journey to the castle seemed short as we were looking out of the coach window to see what we could see. 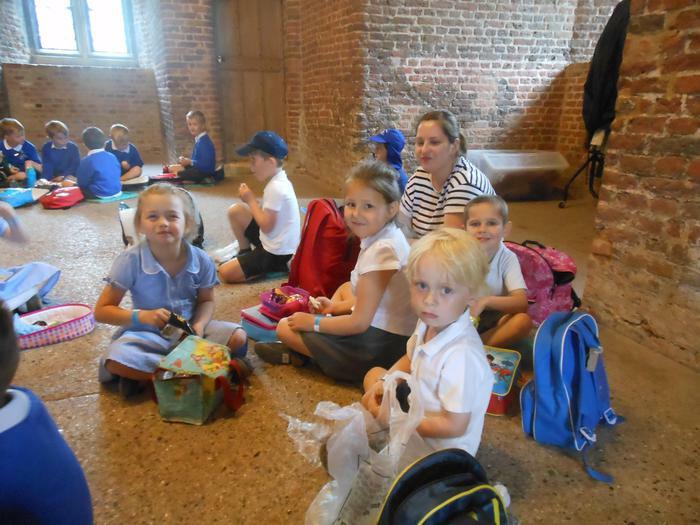 We counted the number of farm animals we could see including sheep, horses, cows and donkeys. 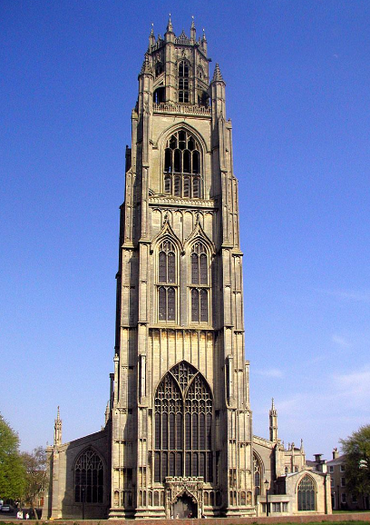 A few moments later we could see something in the distance and wondered if it was Big Ben, however we then realised it was Boston Stump. 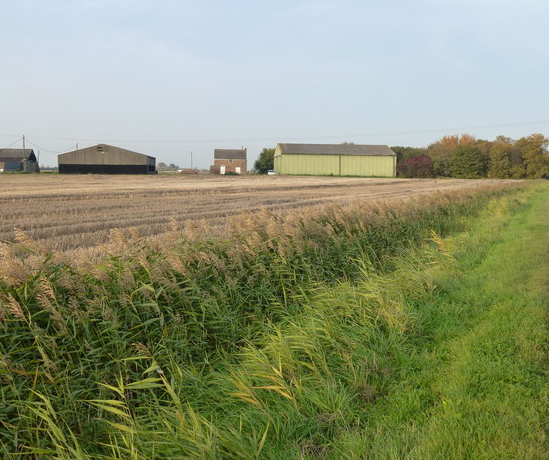 We saw fields full of cauliflowers, corn and saw lots of farm machinery. 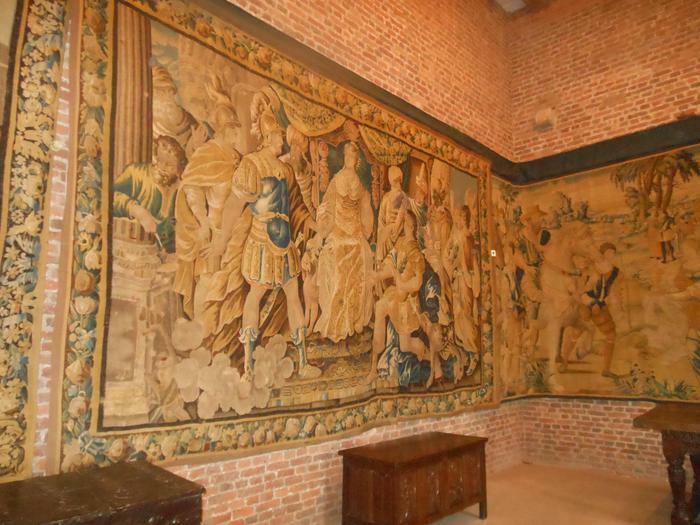 so grand and impressive. 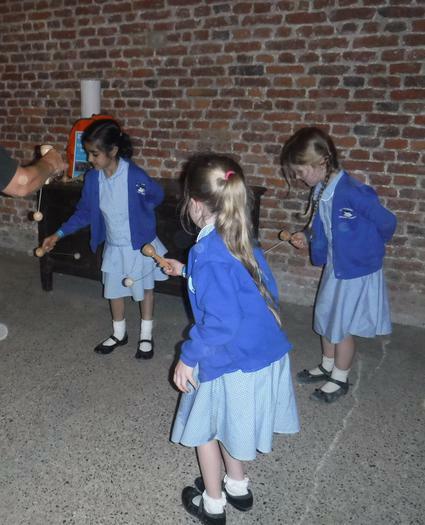 First we went downstairs to explore the rooms with and without light! 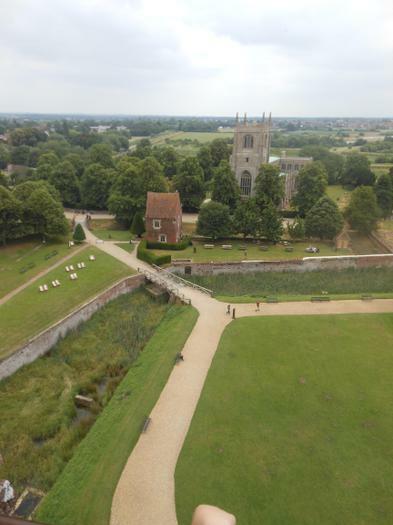 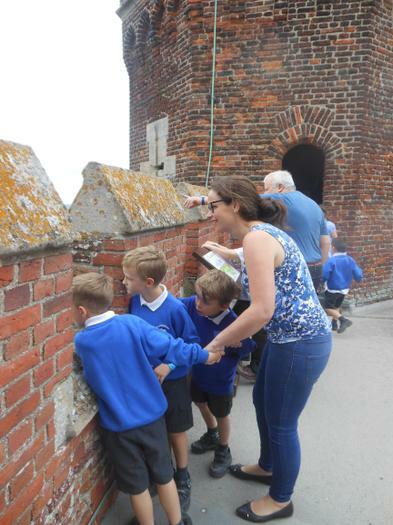 Next we started to climb the 147 stone steps to the top of the castle to see the battlements, the arrow slits and of course enjoy the stunning views. 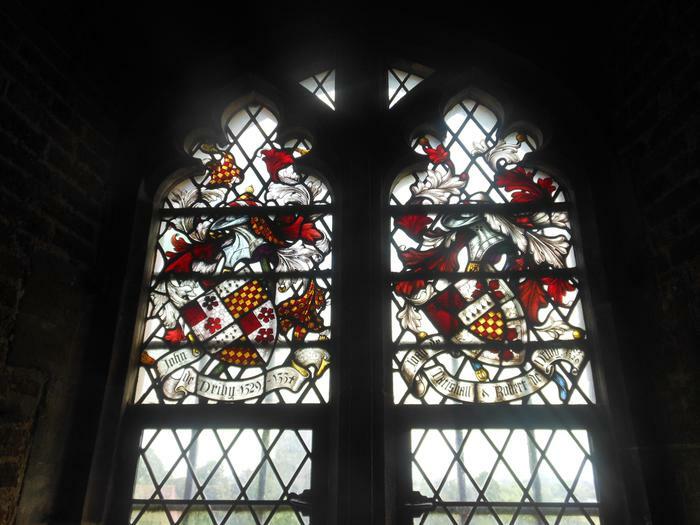 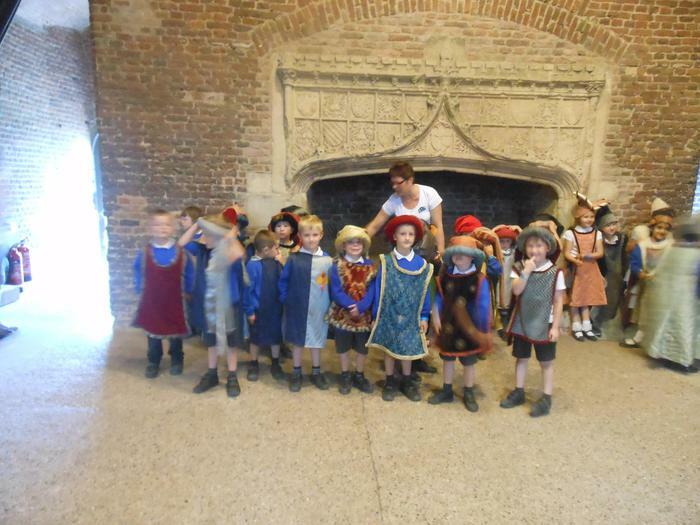 We explored each floor and discovered beautiful stained glass windows and tapestries containing a variety of animals including an elephant! 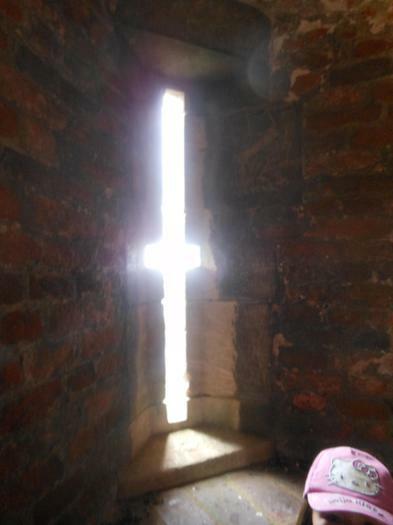 The view from the top of the castle was amazing. 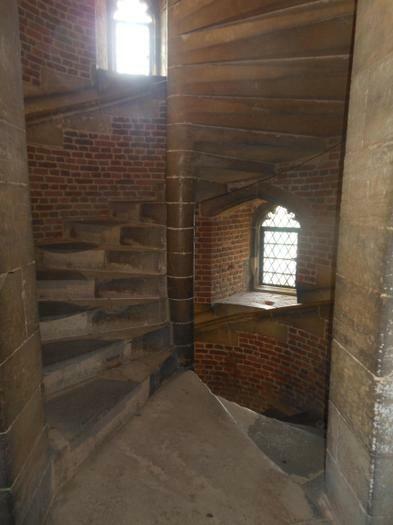 Did anyone spot Lincoln Cathedral in the distance? 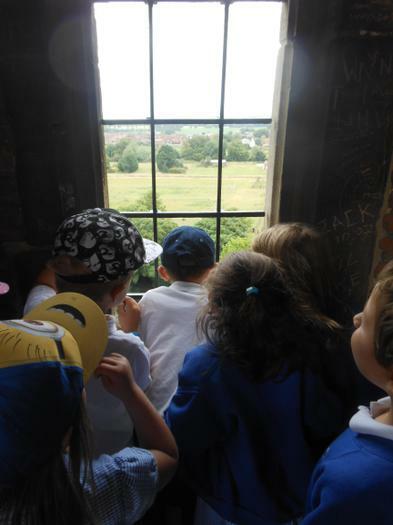 We found arrow slits and carefully peered round the battlements. 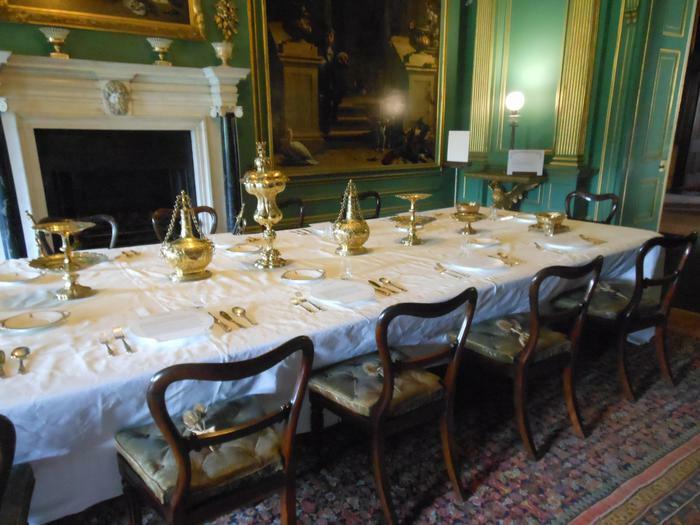 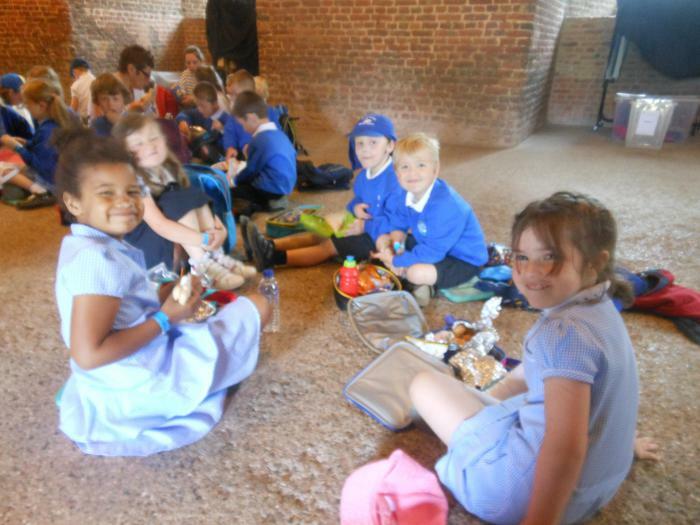 We were certainly ready for our lunch today having walked so many steps to the top. 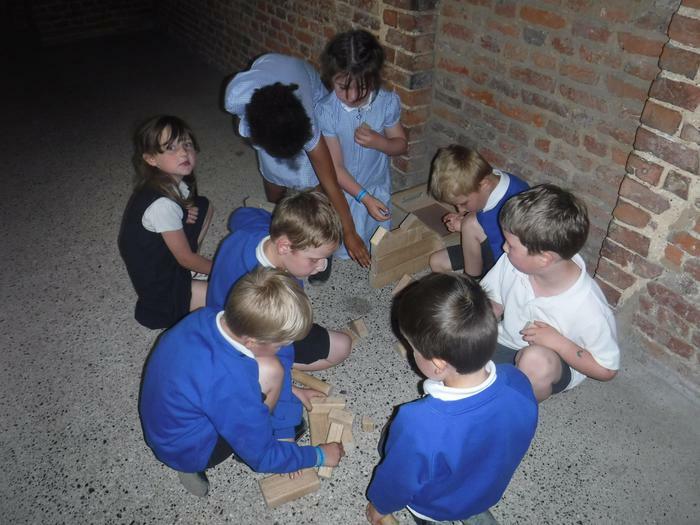 In the afternoon, we played some games in small groups. 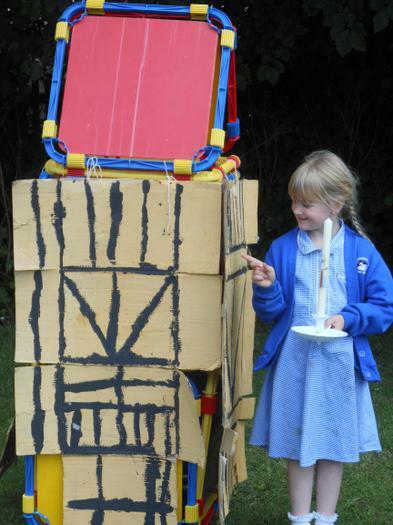 All of the toys and games were made from wood and none of them needed batteries or electricity to work. 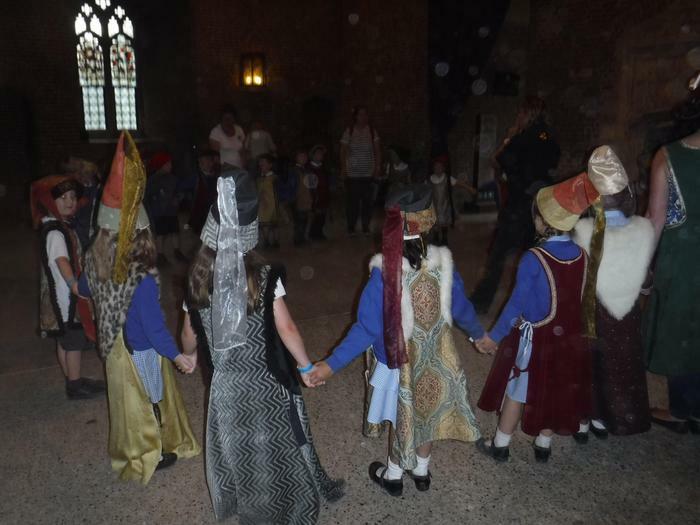 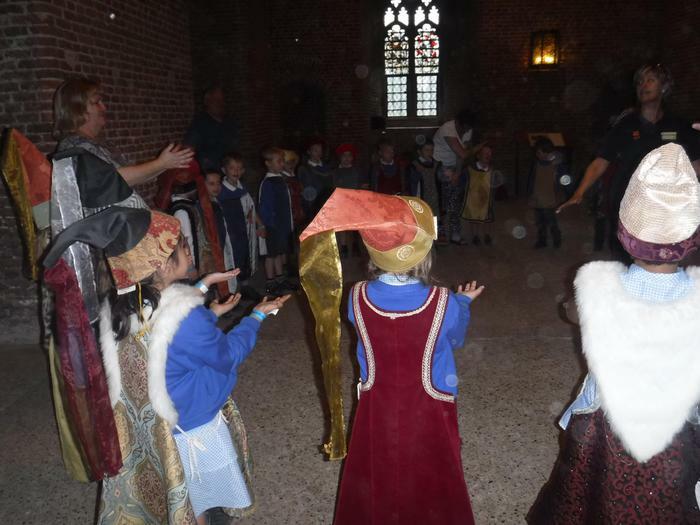 After playing with the toys, we all dressed in Medieval clothes and learnt two special dances for Lord and Lady Cromwell. 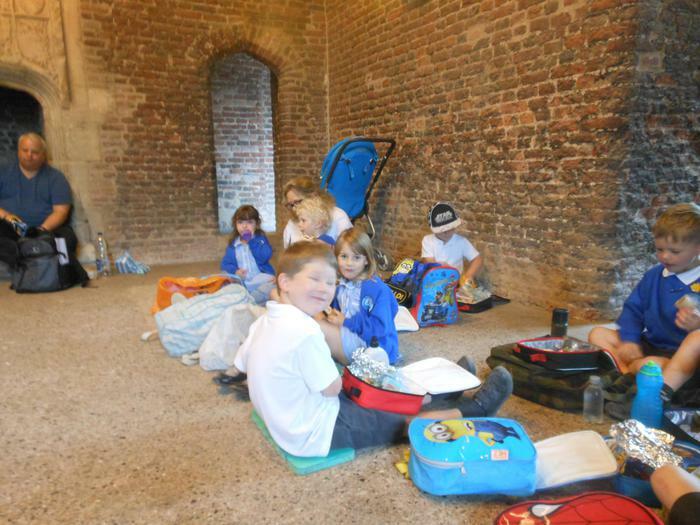 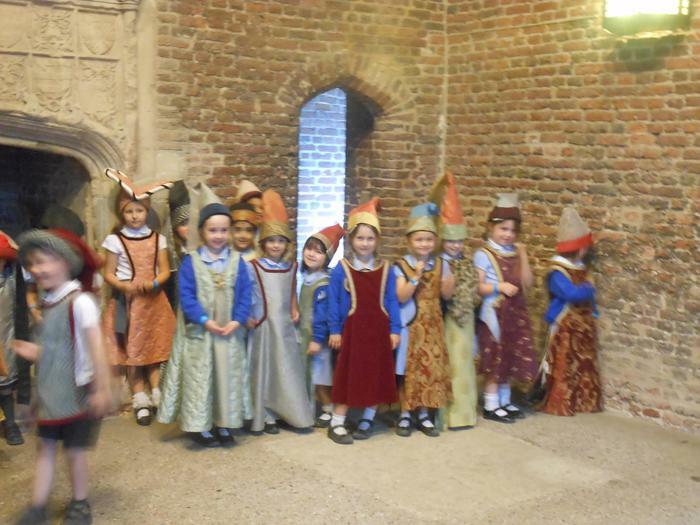 What an amazing day we have all had at Tattershall Castle. 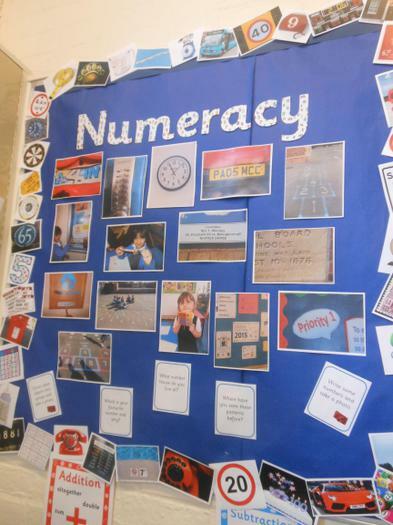 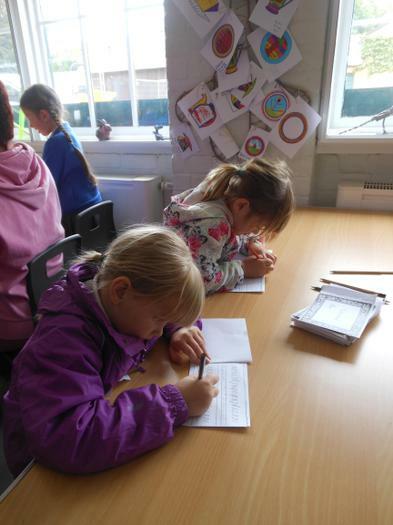 We have learnt lots of new information whilst consolidating what we had already learnt in school. 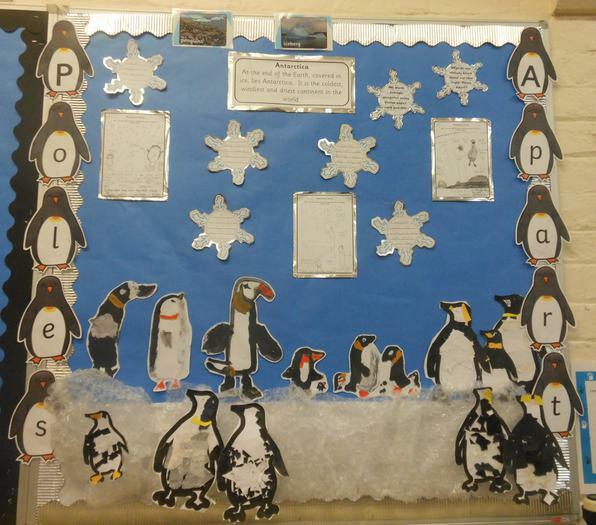 This term we will 'travel' to the Arctic and Antarctica finding out about the animals that live there and how the animals adapt to their habitats to survive. 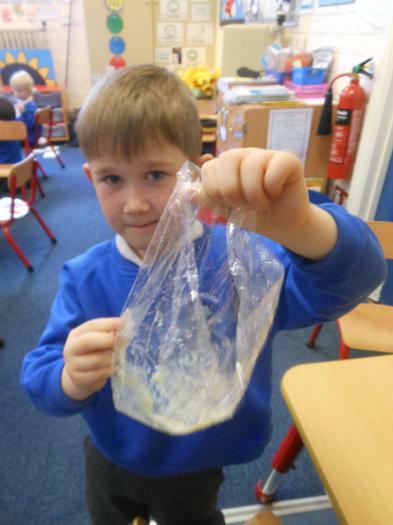 Ever wondered which is the quickest method to extract objects from frozen materials? 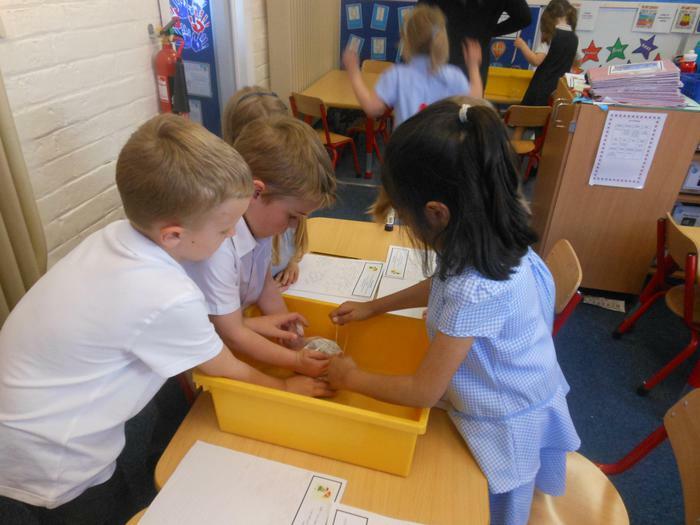 We will investigate icebergs and conduct experiments too. 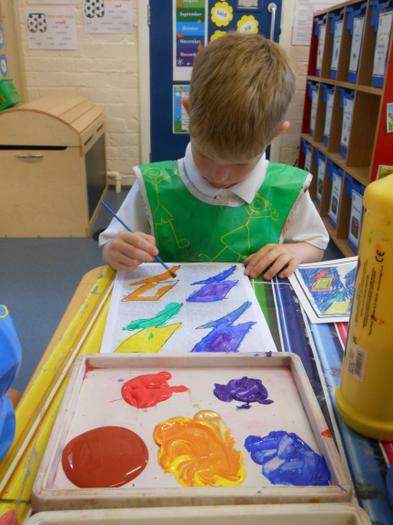 Aurora Borealis to inspire our creative work. 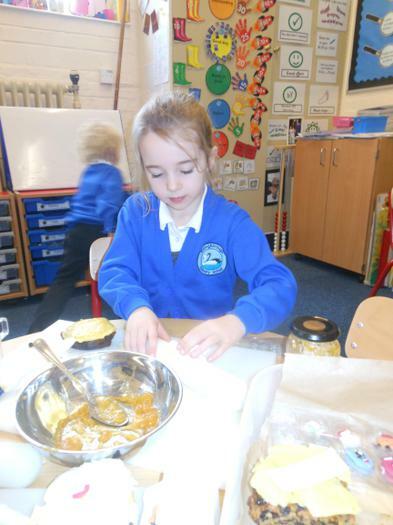 After listening to the Easter story we made Easter cards and followed the instructions to make Simnel Muffins. 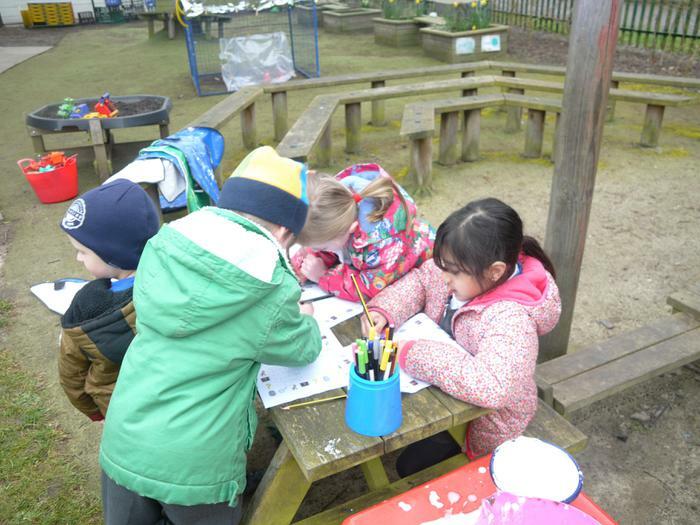 During Science Week, we enjoyed planting cress and sunflower seeds, exploring signs of Spring to create Spring collages. 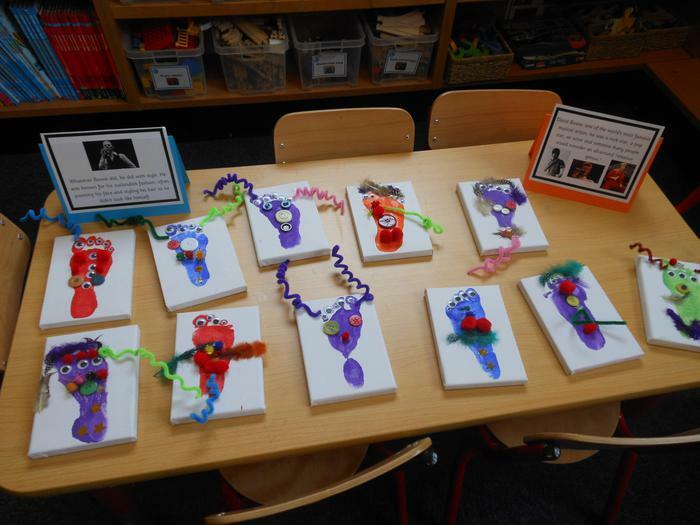 We also talked about internal and external body parts, our 5 senses and the smells, tastes, sights, objects we feel and sounds that we like and dislike. 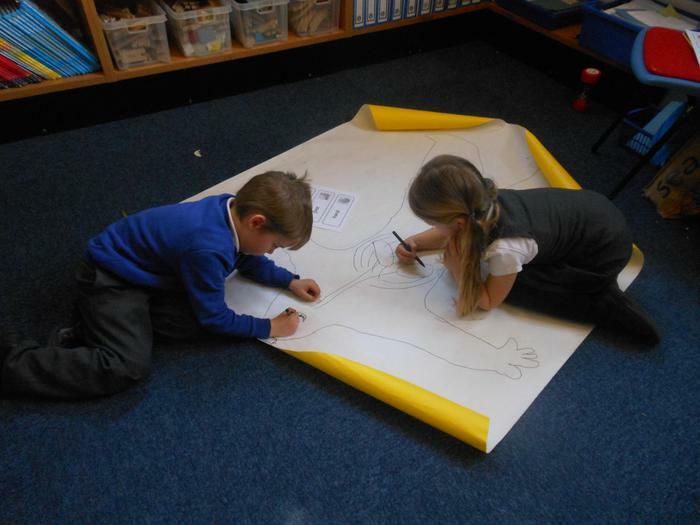 The Y1 children worked in small groups to draw a life side child, then they labelled the external and some internal body parts. 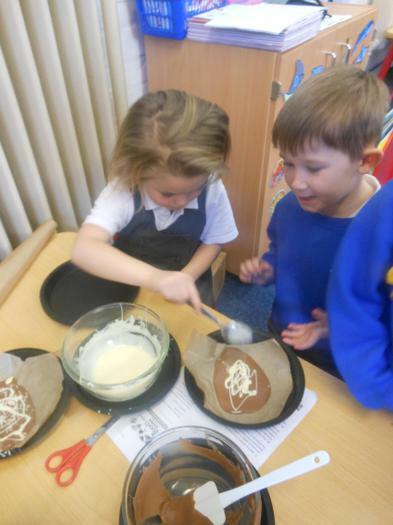 We also explored how chocolate changes when placed in a warm place and then how it changes once more when placed in a cold place. 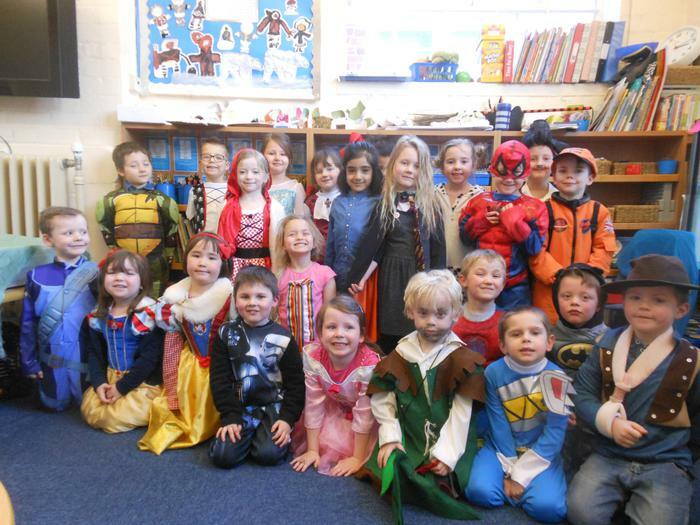 Wow look at our amazing book character costumes. 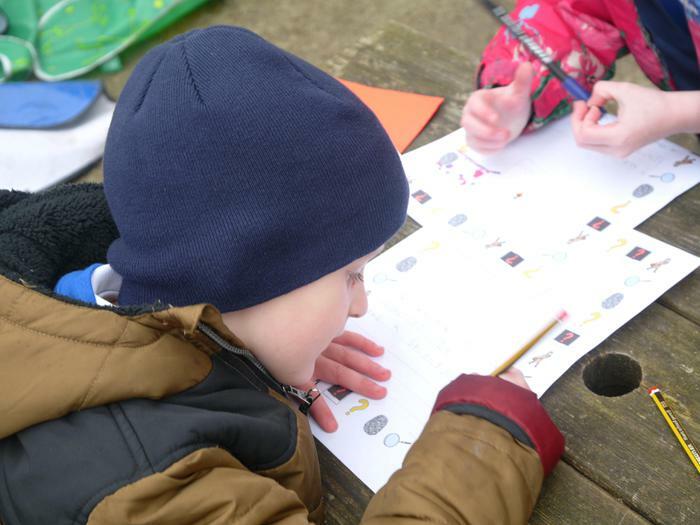 We enjoyed sharing our favourite books together, making special book marks, entering a competition and the Y1 children enjoyed working together on a World Book Day Hunt. 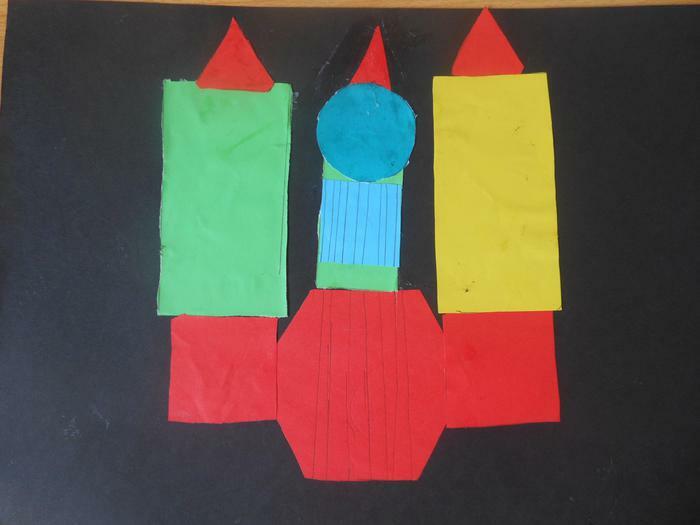 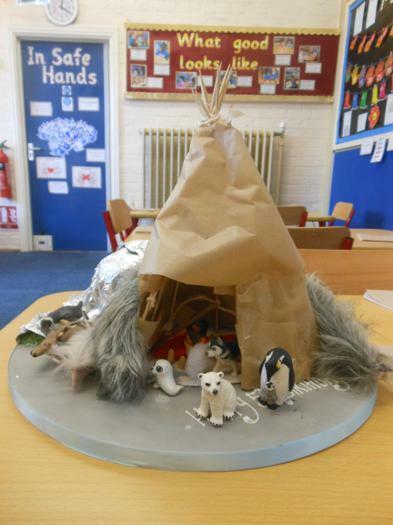 As we find out more about 'Poles Apart', the children were given their Home Learning Project for February half term. 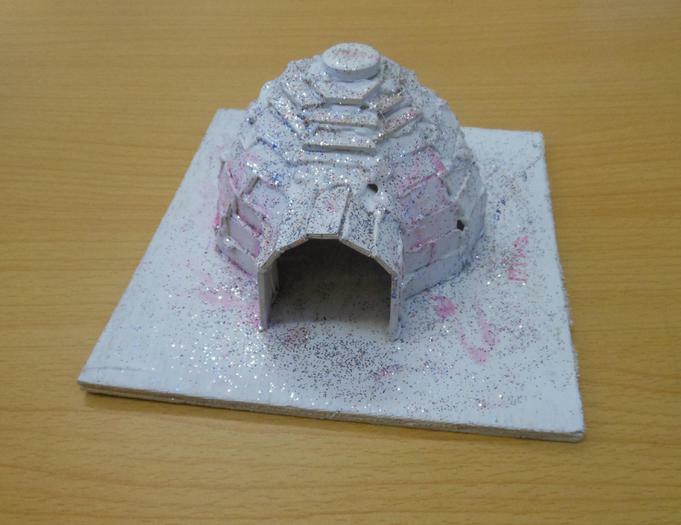 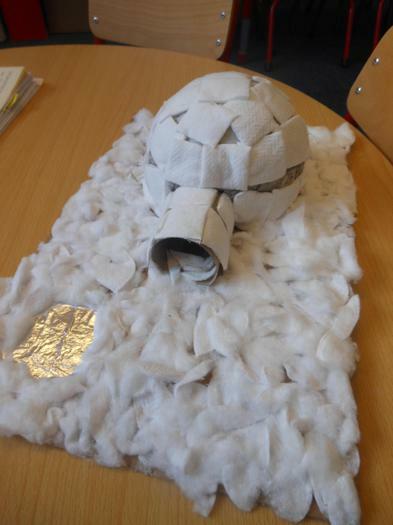 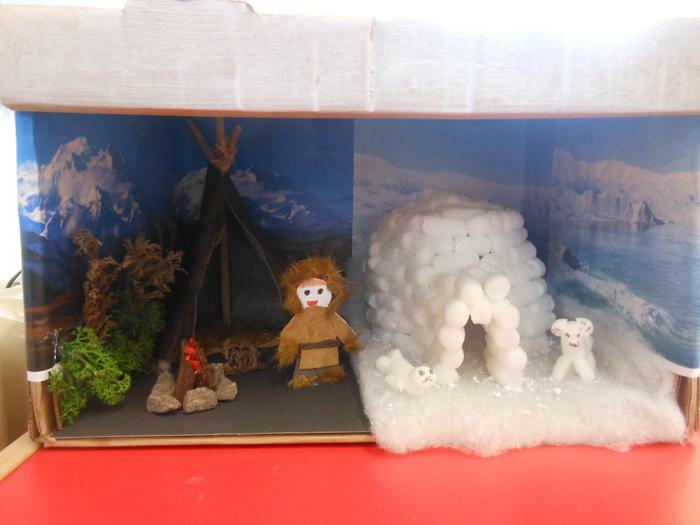 Design and make a model of an igloo, Inuit house or tent. 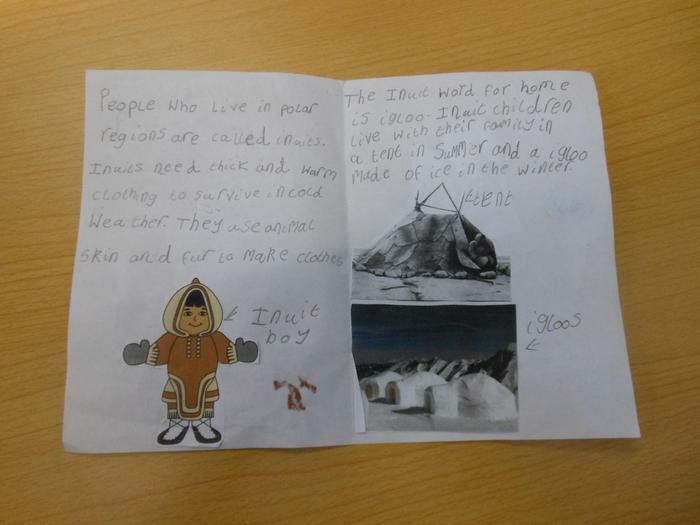 Research the ways in which children live in Polar regions - how it is different to the way we live? 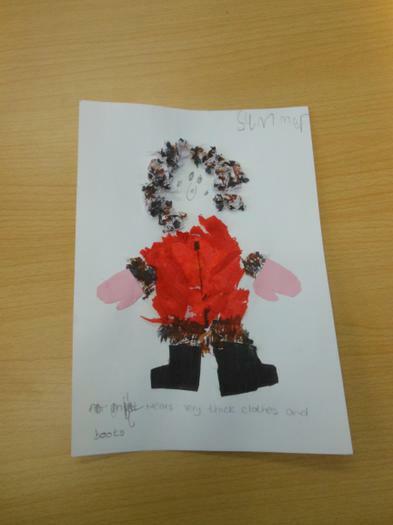 Draw a picture of make a collage of a person who lives in a Polar region. 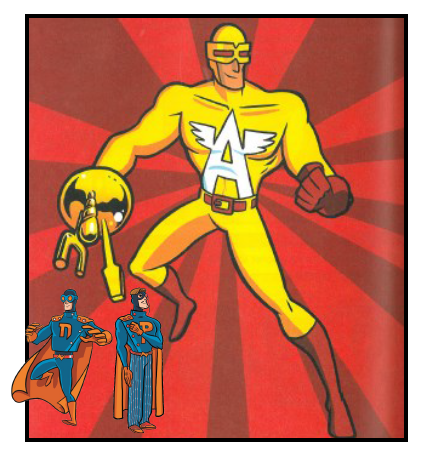 What do they wear? 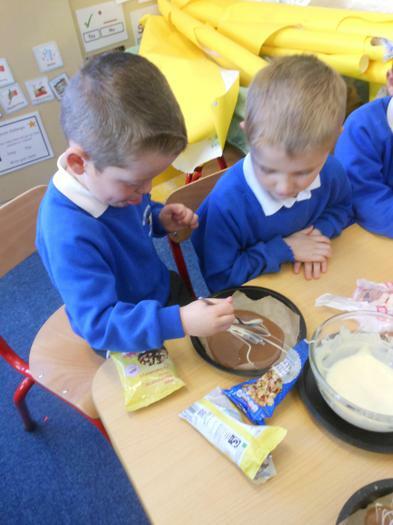 What will they need? 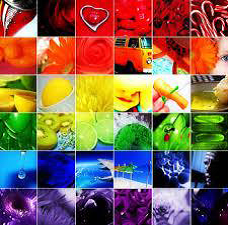 Colours are all around us. 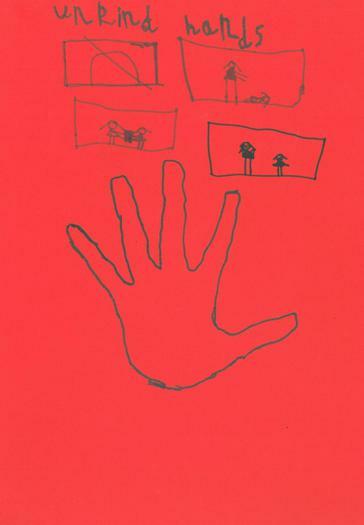 In the sky, on the land, in the sea and in our homes. 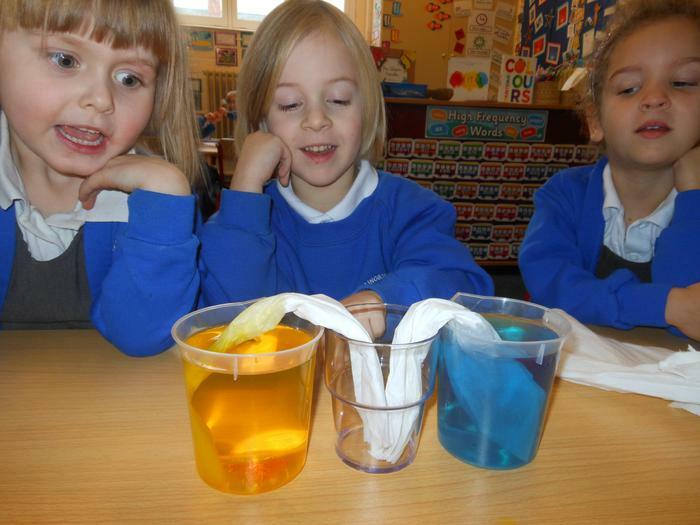 We see colours when it is light. 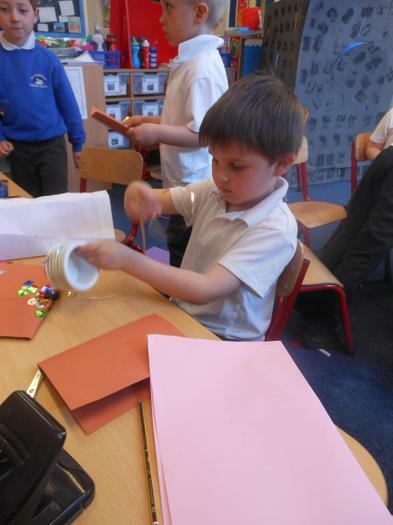 the sun or a light shines on an object which allows us to see its colour. 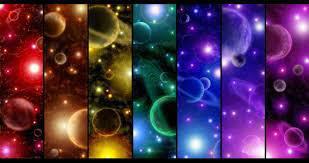 Different colours sometimes make us feel different emotions. 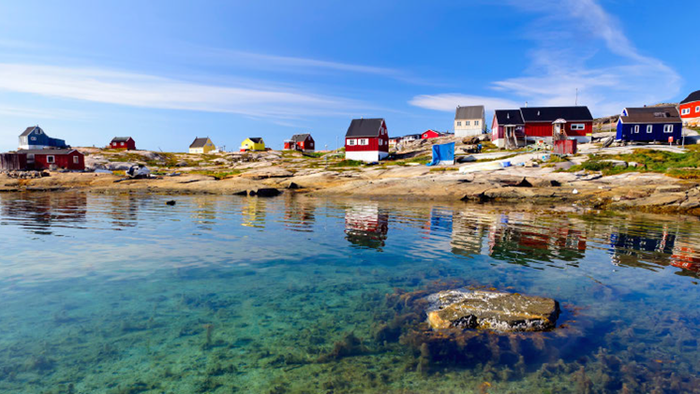 The Arctic landscape looks different in winter and summer, the colours sometimes make us feel different emotions. 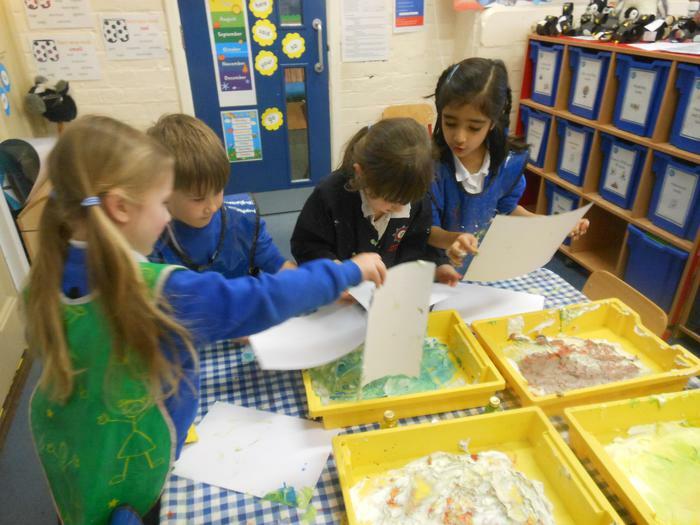 We made patterned paper using shaving foam and different coloured food colourings. 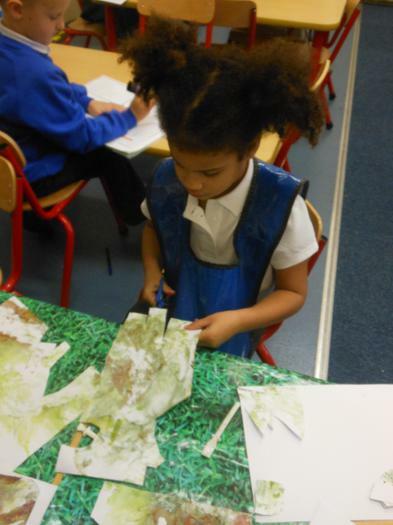 We then used the patterned paper to cut shapes for the ocean, mountains and sky. 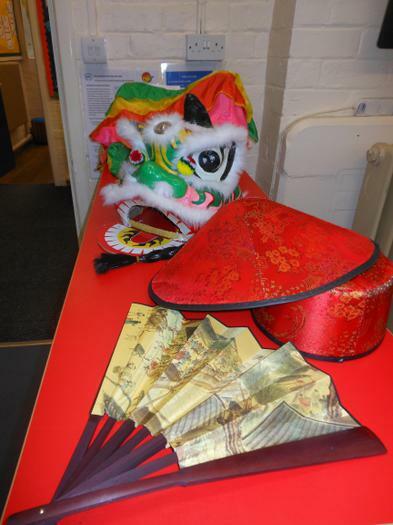 On Friday, we enjoyed learning about the Chinese New Year. 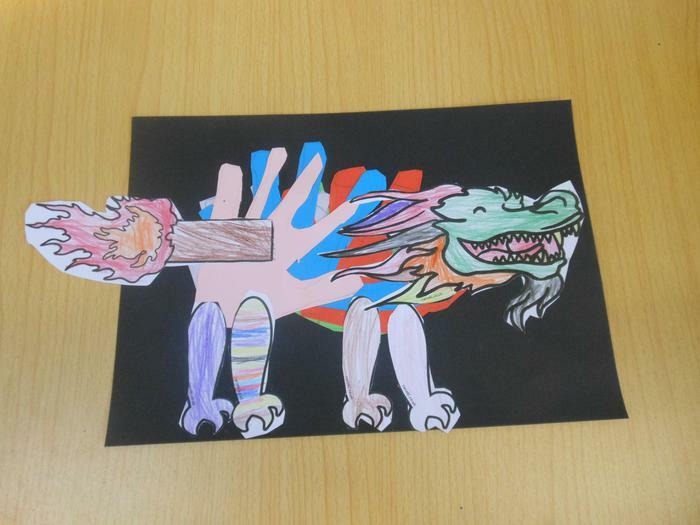 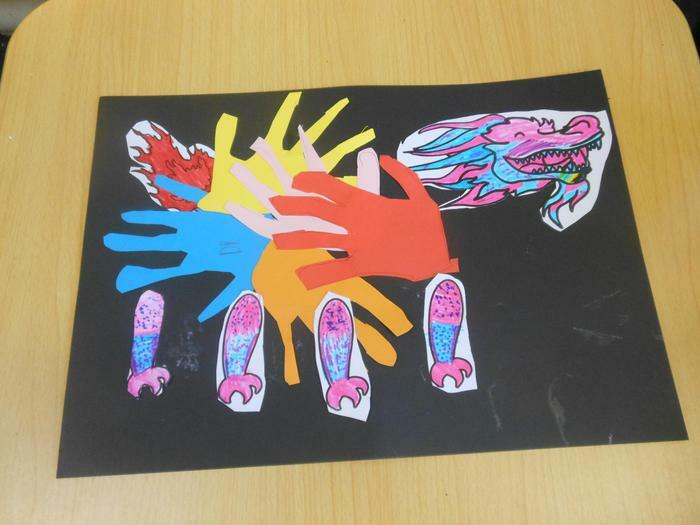 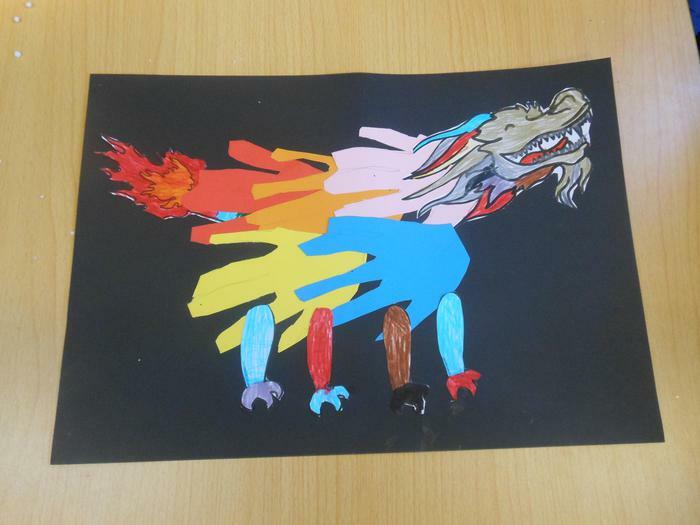 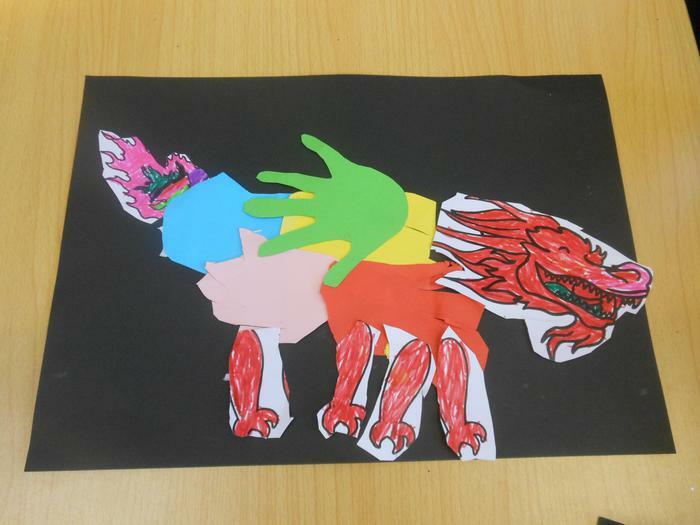 We created colourful handprint Chinese dragons and glittery lanterns. 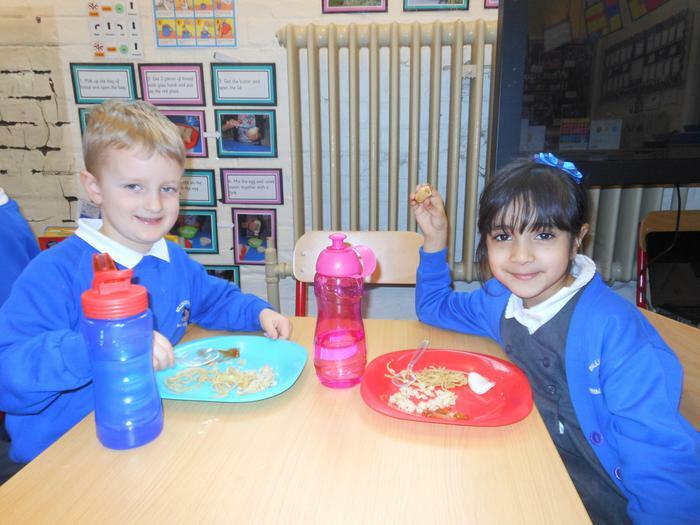 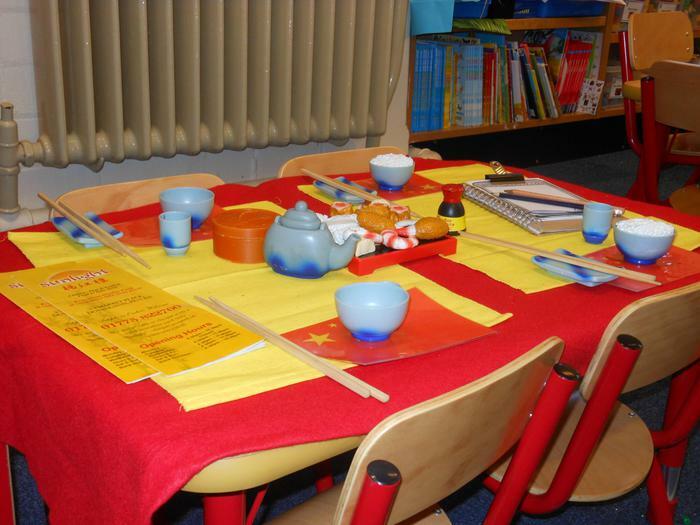 We then enjoyed our role play Chinese Restaurant sampling egg fried rice, prawn crackers, sweet and sour sauce and noodles. 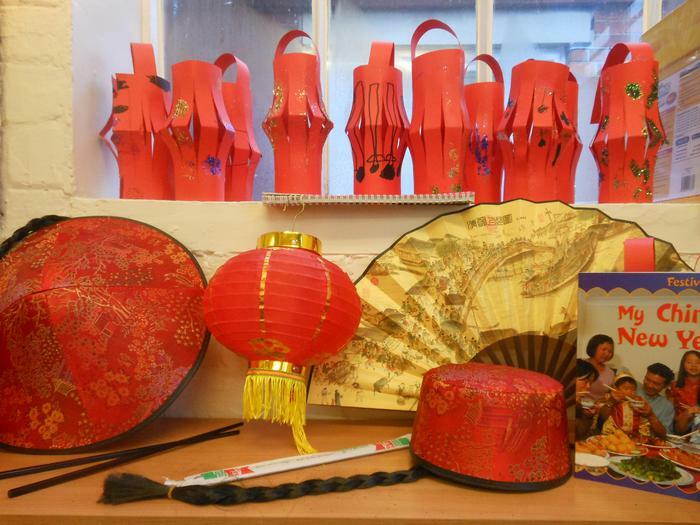 We also watched some video clips showing how Chinese people prepare and celebrate Chinese New Year. 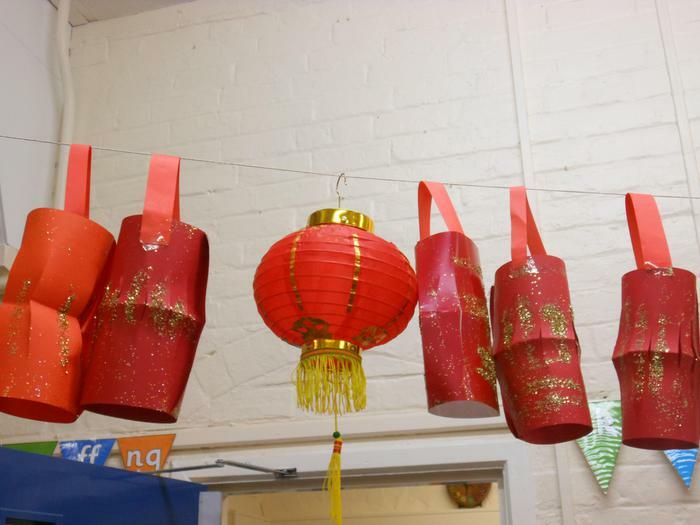 We loved learning a Chinese New Year song too. 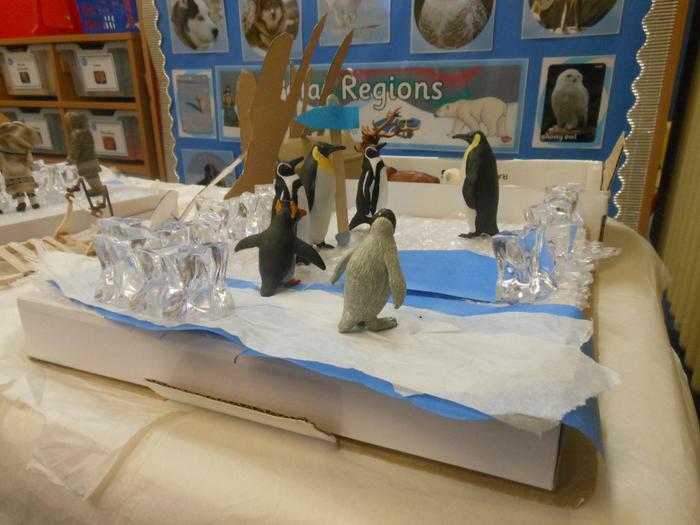 We were all very excited to see our new small world collection of Arctic and Antarctic animals and Inuits. 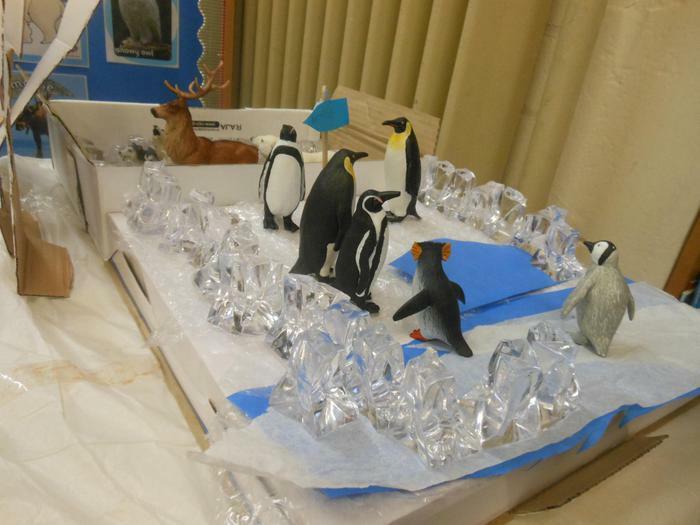 We created our small world adding icebergs, snow, mountains and sign posts for the North and South Poles. 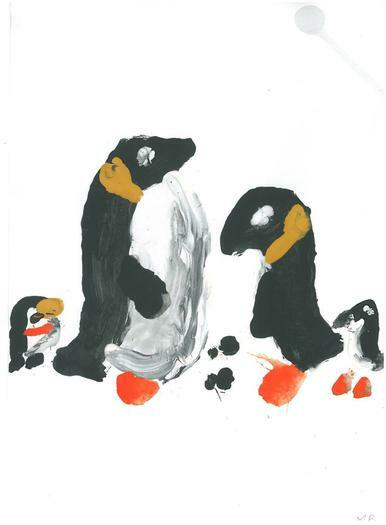 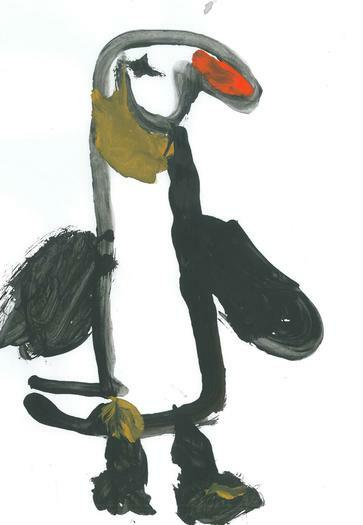 Baby penguins are black and white and the Mummy and Daddy penguin swap to keep the egg warm. 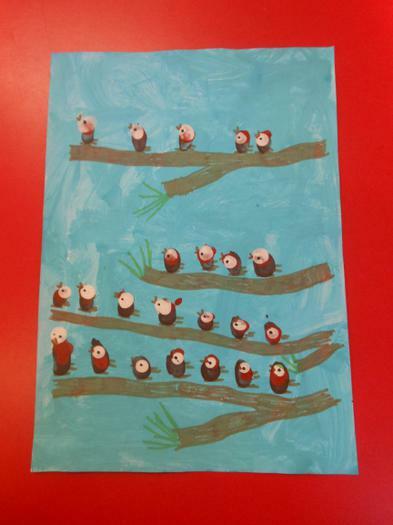 The Mum and Dad hunt for fish to give to the baby penguin. 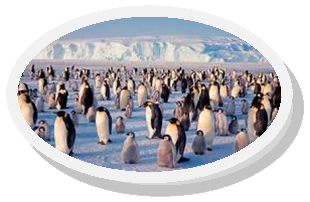 Penguins live in the cold, icy Antarctica. 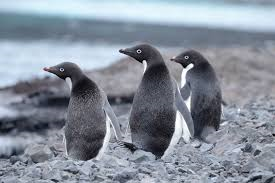 Baby penguins hatch from white, hard eggs. 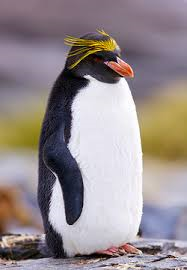 Some penguins live in hot places. 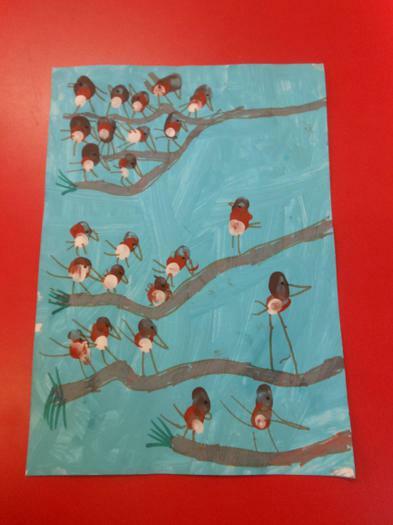 Penguins wings are waterproof and they are black and white. 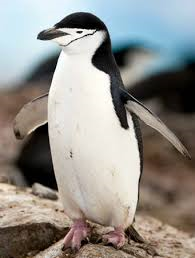 Penguins have three claws pointing forward and one claw pointing backwards. 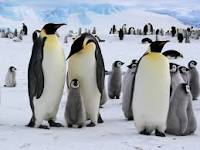 Whenever there's a snow storm they all huddled up together because it's very cold. 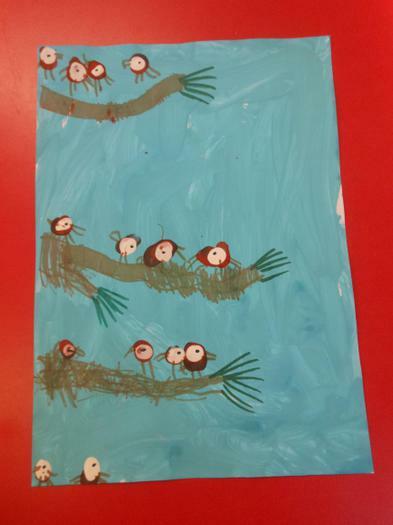 They are now very good at flying but they are good at swimming. 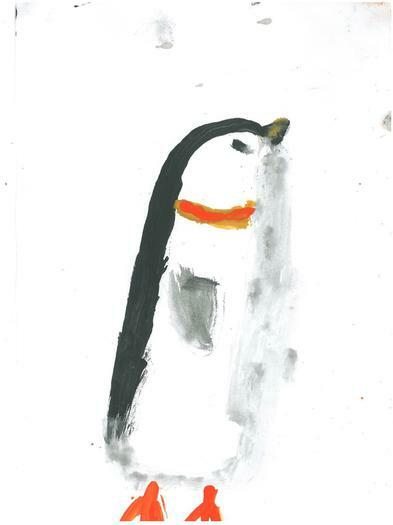 Penguins are good at sliding. 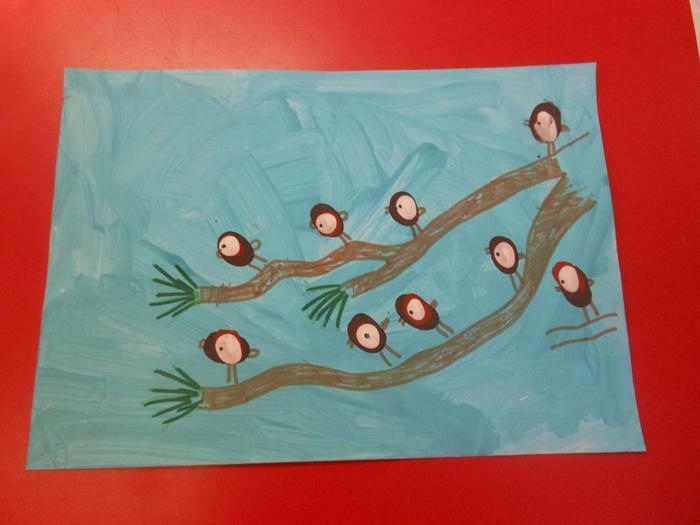 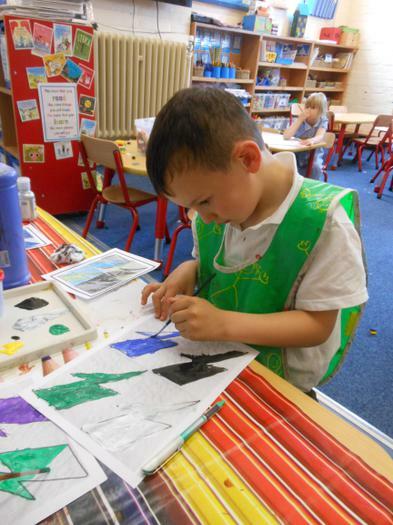 We used photographs from a selection of non fiction books to help us paint pictures of penguins. 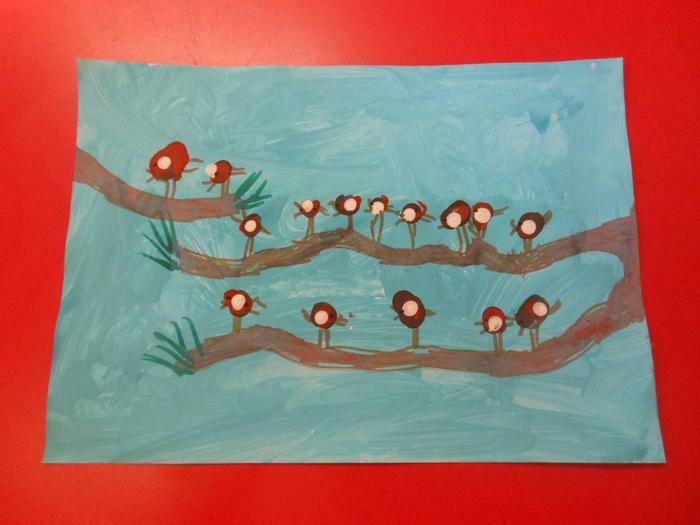 Here are just a few of our amazing paintings. 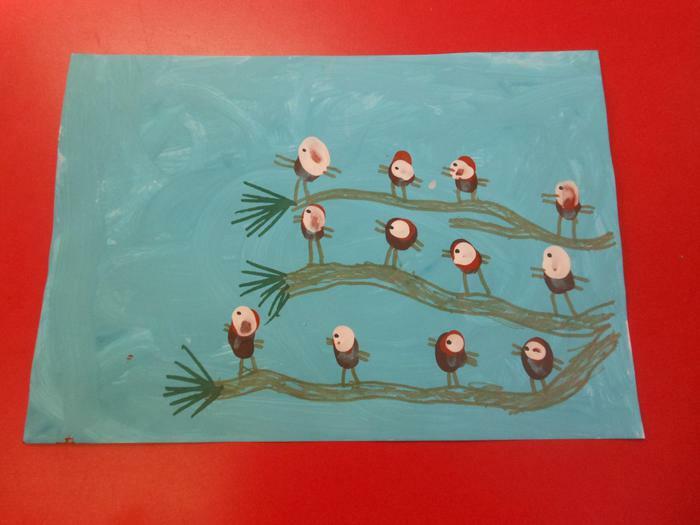 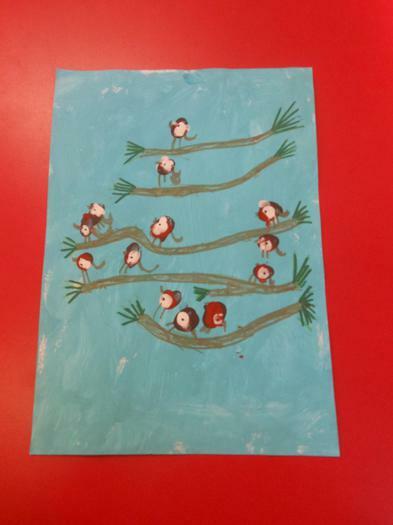 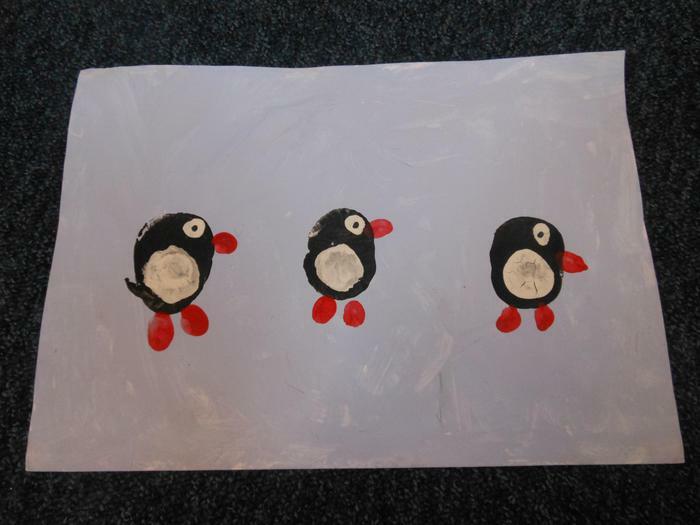 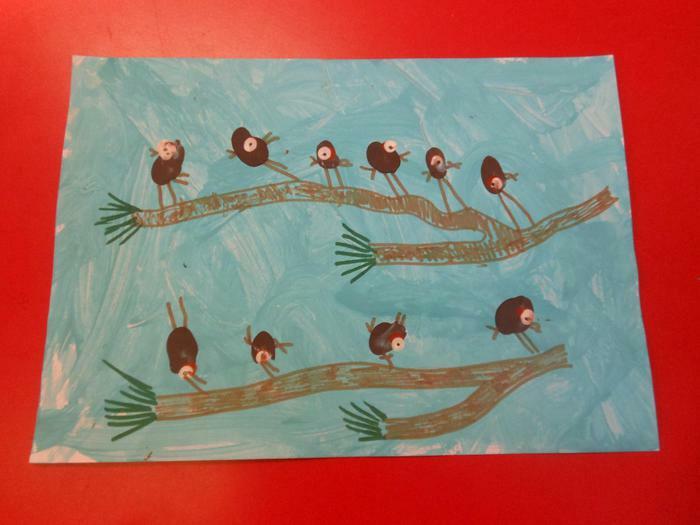 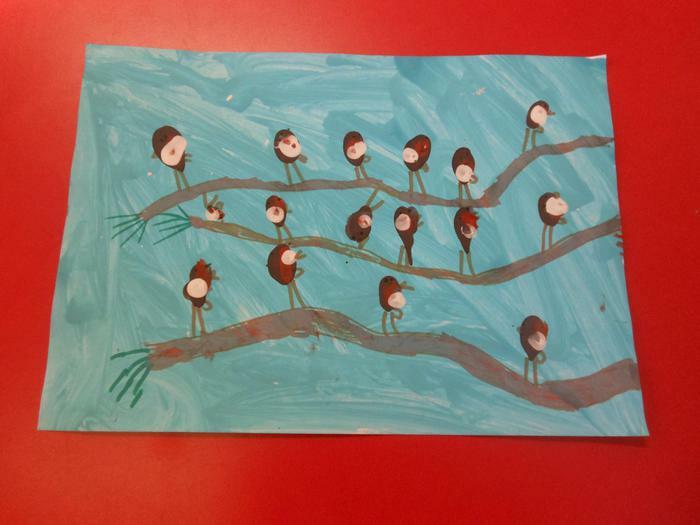 We worked together and followed the instructions to make 'Loopy Penguins' and created our own colony penguins. 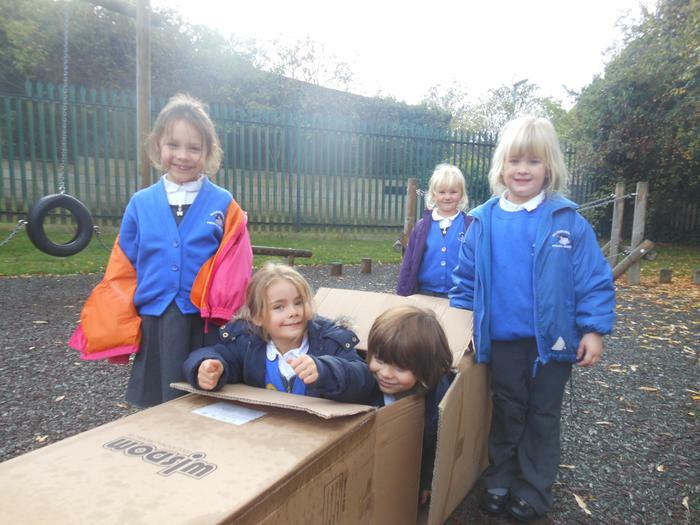 The following day we received another delivery, but this time it was a thin, rectangular parcel. 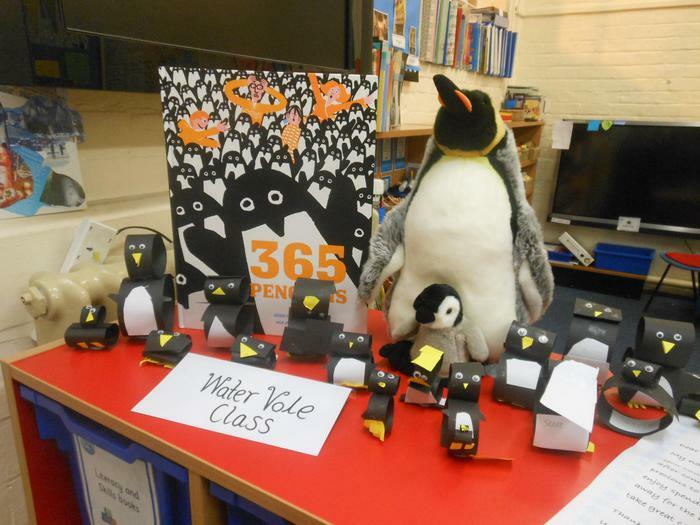 We were delighted to discover Uncle Victor had sent us the book 365 Penguins. 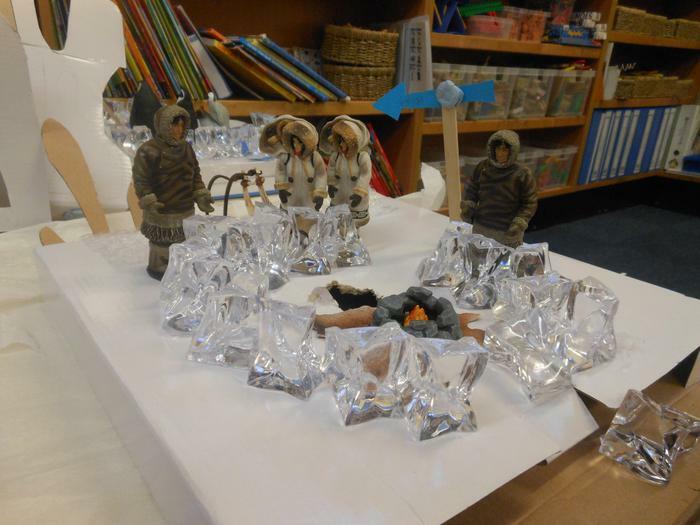 What would the story be about? 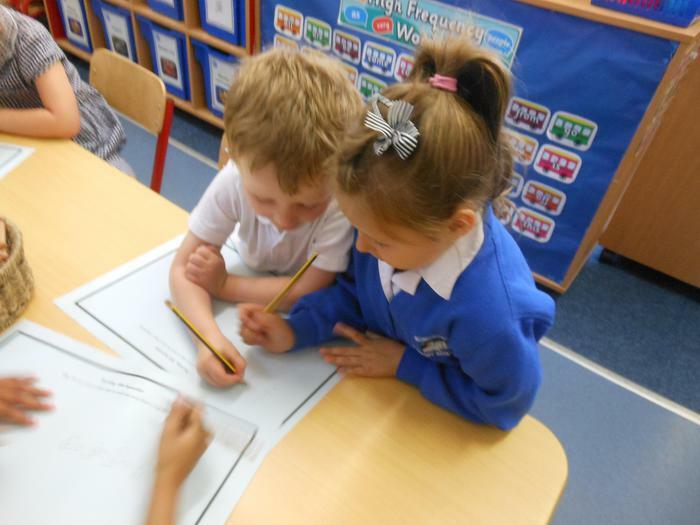 We started to make predictions and suggest possible storylines. 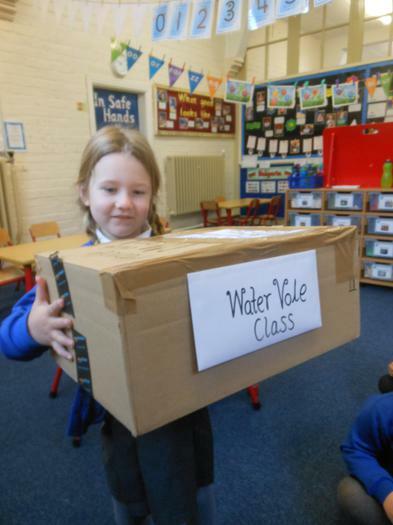 We had a very exciting morning with the delivery of a large cardboard box addressed to Water Vole class. 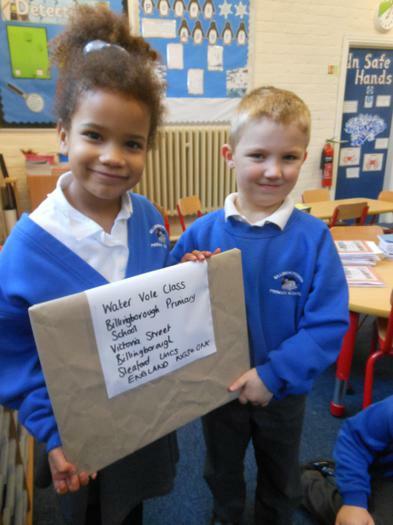 After lots of suggestions and predictions about the contents of the box, two children read the enclosed letter. 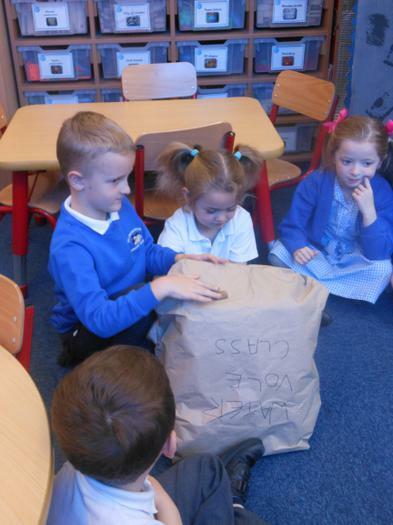 It was a letter from Uncle Victor asking us if we would take great care of a very special and important object. 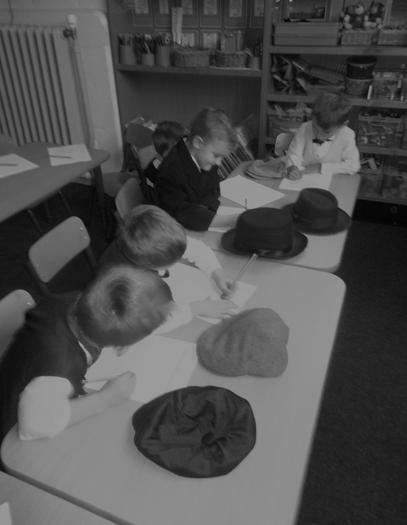 Uncle Victor was due to begin his travels around the world and knew that we are kind and caring children and grown ups. 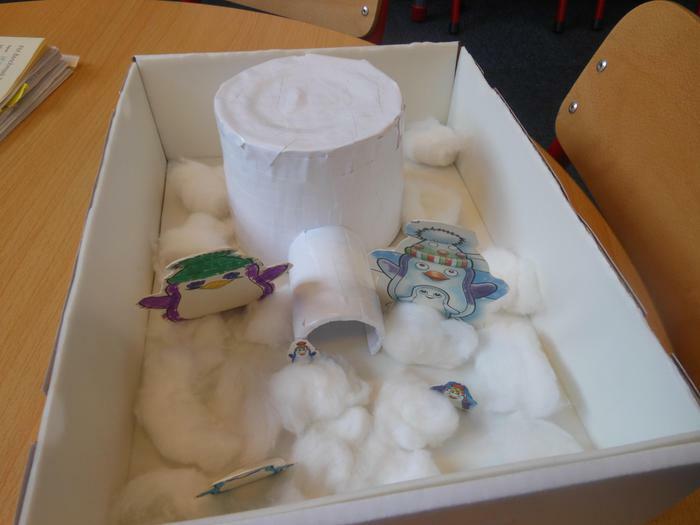 Inside the cardboard box was an Emperor Penguin with light grey fluffy feathers and bright yellow behind its ears. 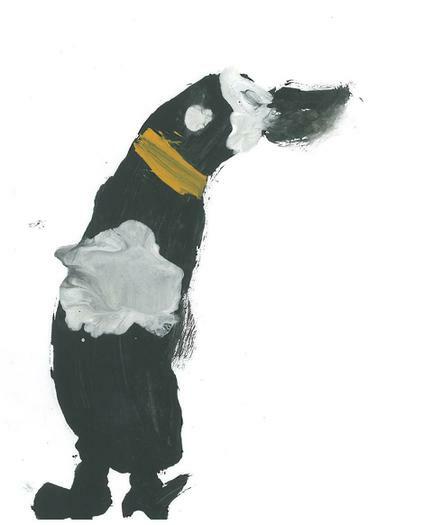 We instantly bonded with our new penguin friend. 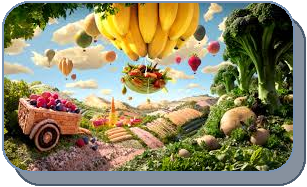 and the journey of our food. 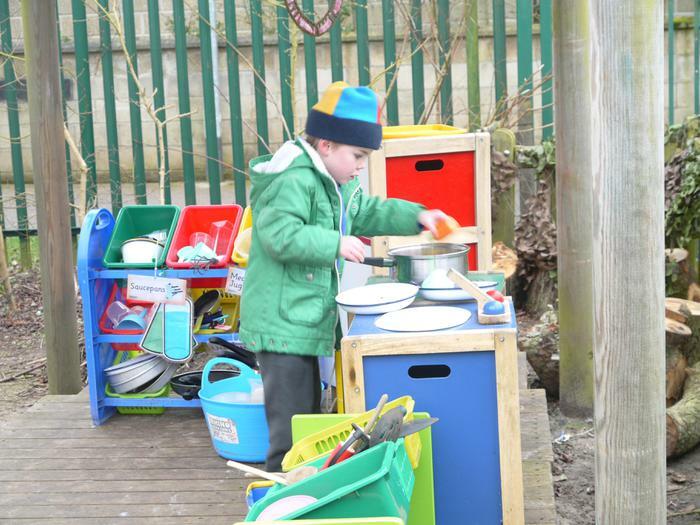 and mud kitchen areas too. 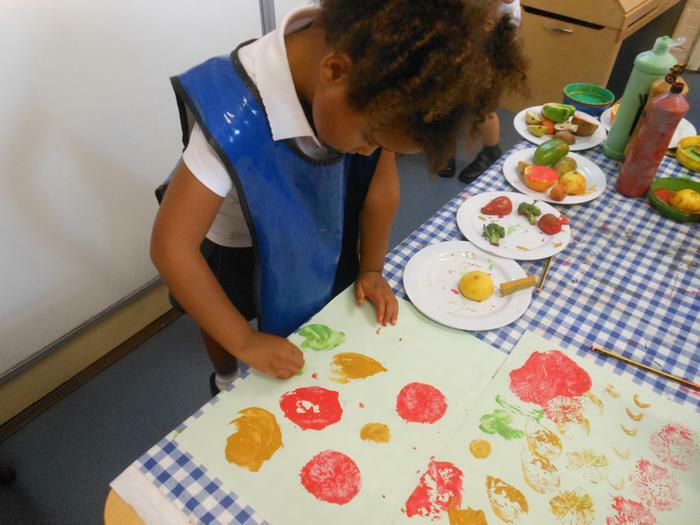 We will develop our cooking skills to prepare and cook dishes using a variety of fruits and vegetables, and artists such as Cezanne and Arcimboldo will inspire our creative work. 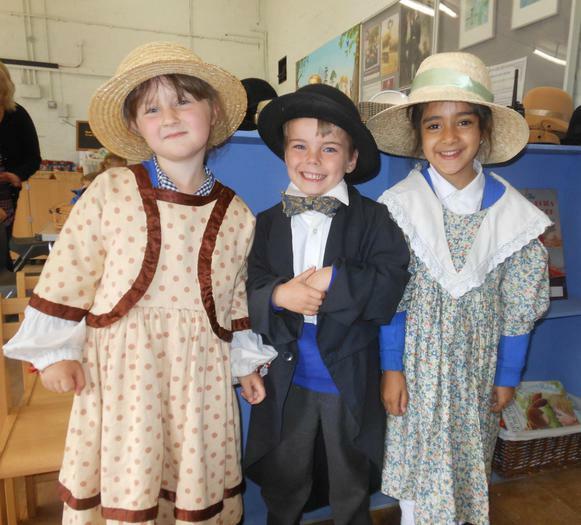 On Tuesday 13th December, we came to school in our Victorian style clothes and experienced what school might have been like during the Victorian times. 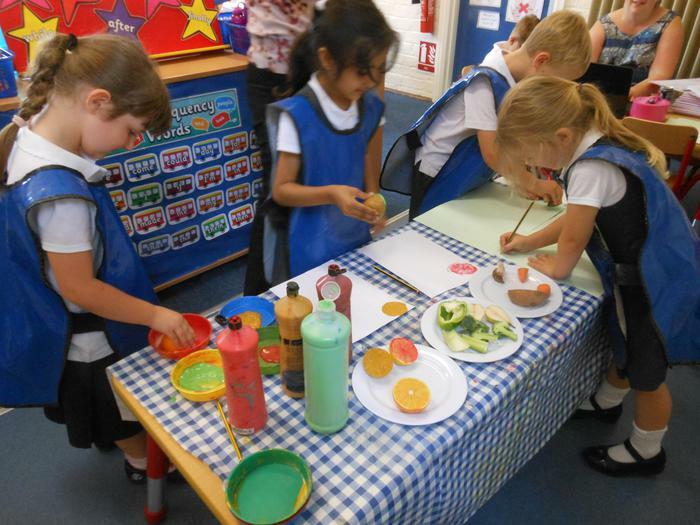 We changed the classroom by moving the tables into rows and covering our bright and colourful displays with black paper. 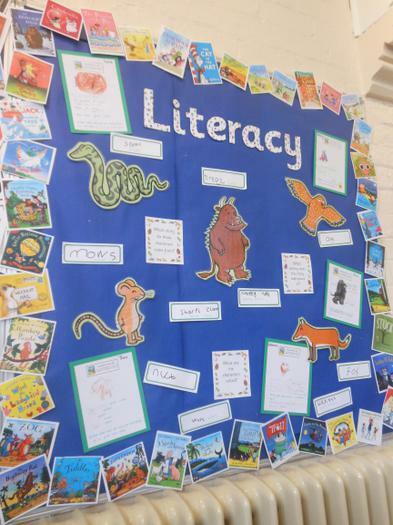 We then displayed a portrait of Queen Victoria, the alphabet, the Lord's Prayer and a map of the world. 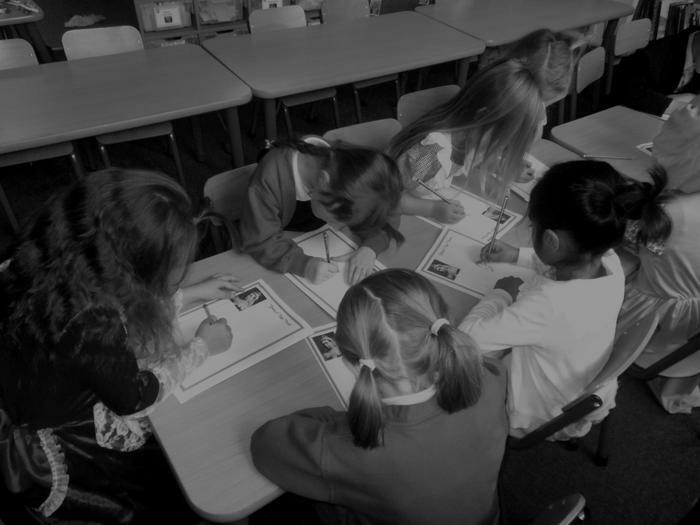 The boys sat together in the classroom and were separate to the girls. 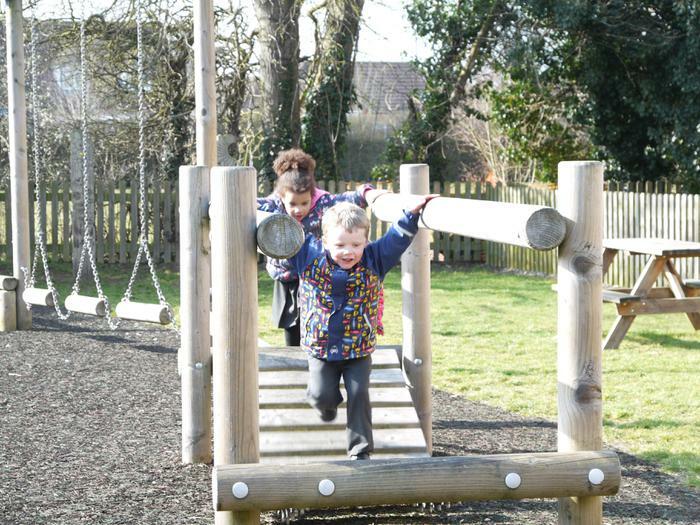 At playtime, we all played in the front playground, however the girls and boys were not allowed to play together. 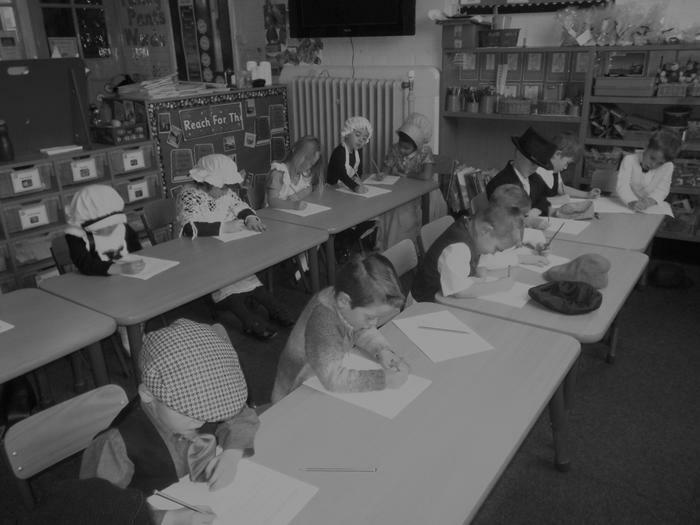 During Victorian Day, we practised our handwriting, did some observational drawings, made a 3D model Victorian school building and made a wooden peg dolls. 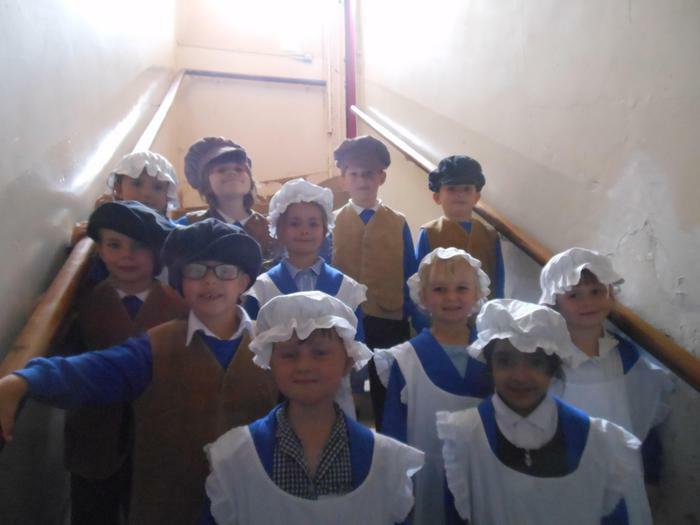 We have been working so hard over the last few weeks learning songs, remembering when to walk on and off the stage, learning our lines and also remembering to smile. 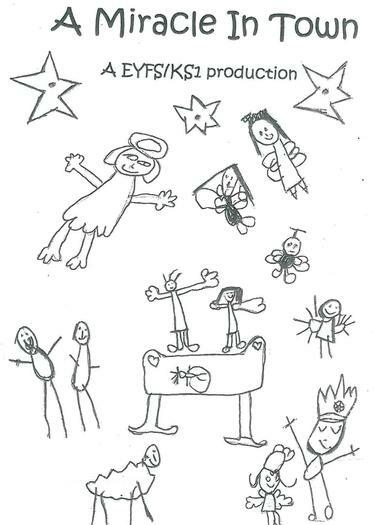 We were all very excited on Thursday 8th December as our performance day had arrived with our afternoon performance at 2pm and an evening performance at 6pm. 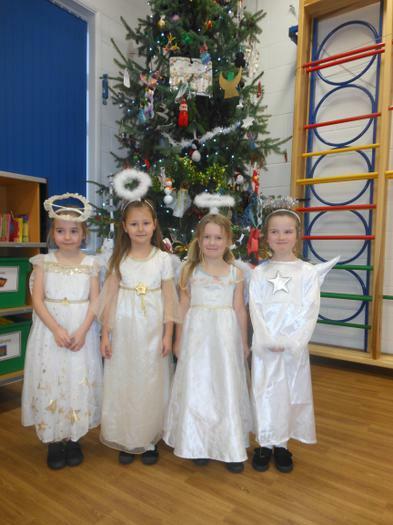 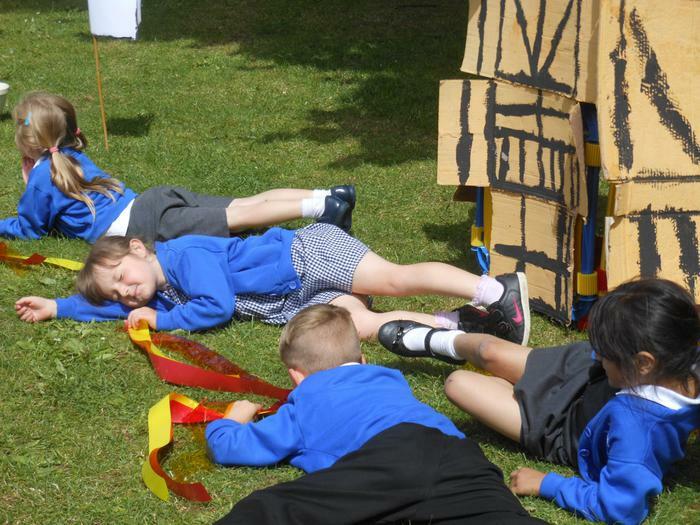 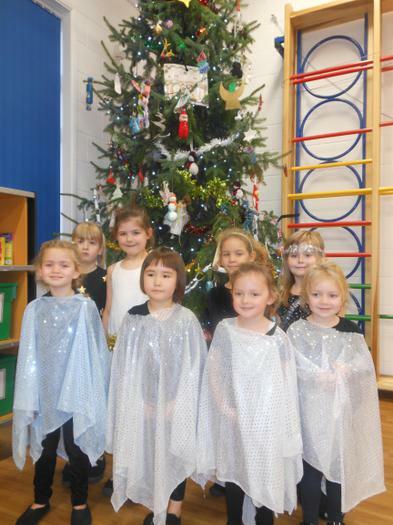 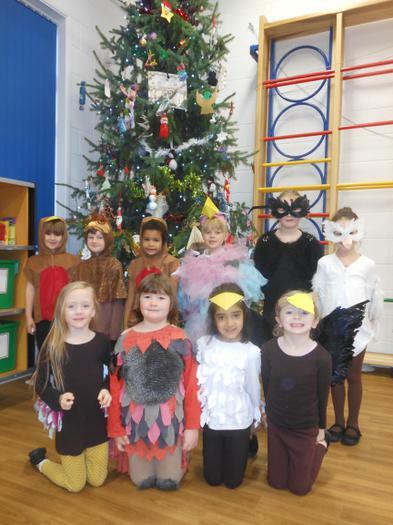 Our performances were amazing and we certainly made many grown ups proud of our achievements. 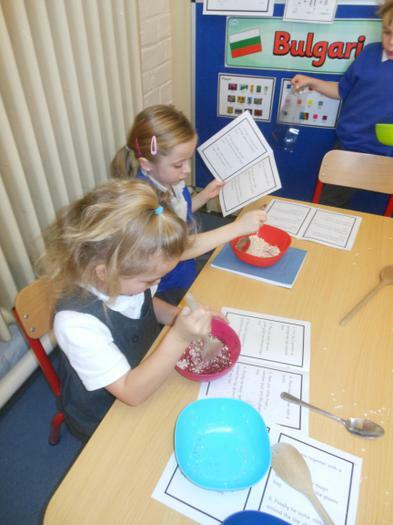 We read our instruction booklet 'How to make magic reindeer food' and carefully followed the step by step instructions to make magic reindeer food. 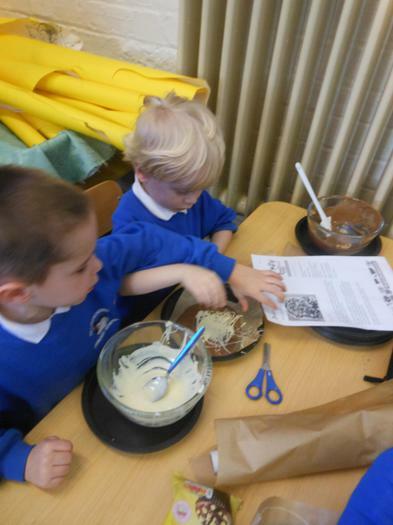 The next day, we wrote instructions how to make magic reindeer food and our 3 robots then visited Water Vole class to follow our instructions. 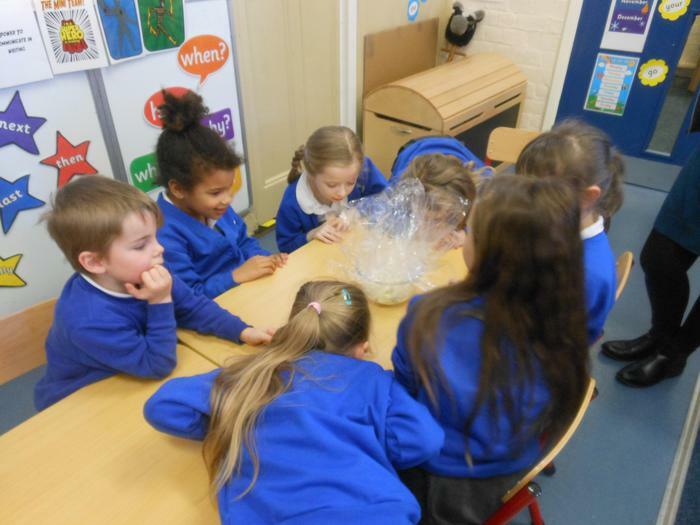 The robots hoped they would successfully make reindeer food. 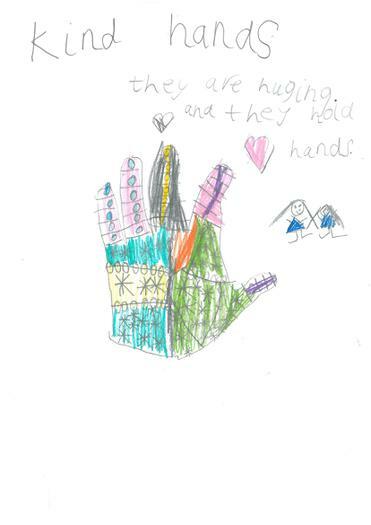 But did they? 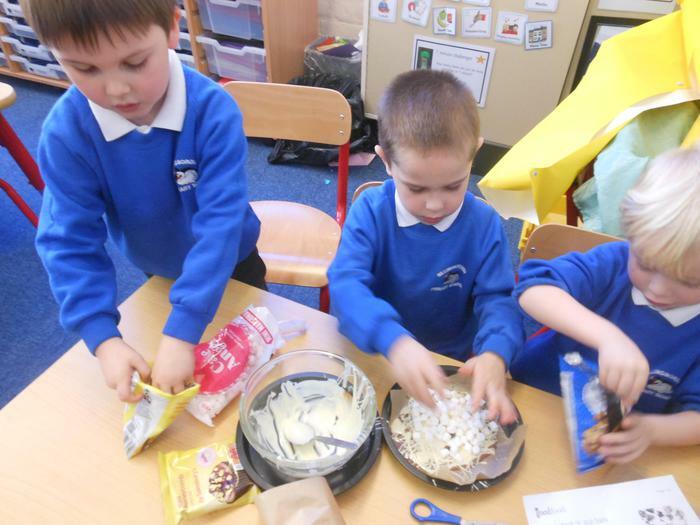 We developed our cooking skills by making Christmas cakes. 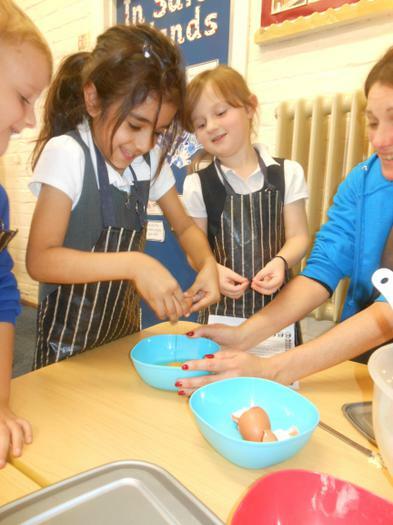 We learnt how to beat butter and sugar, crack eggs and mix wet and dry ingredients together. 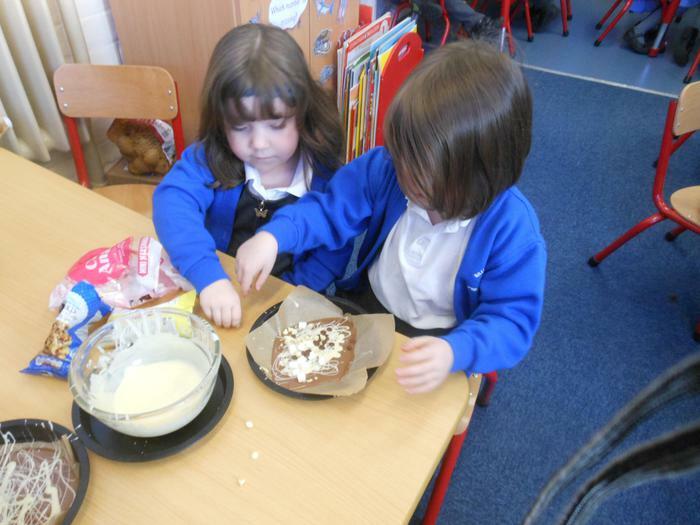 We then covered the cakes with marzipan and white icing. 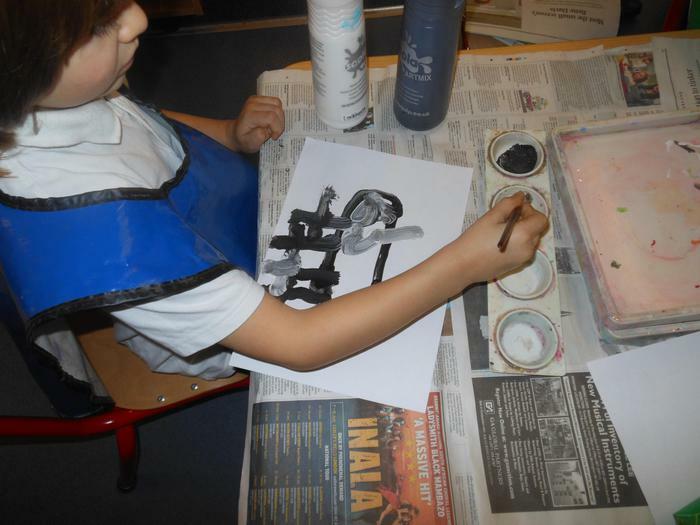 We have been finding out about the French artist Paul Cézanne who was born in 1839. 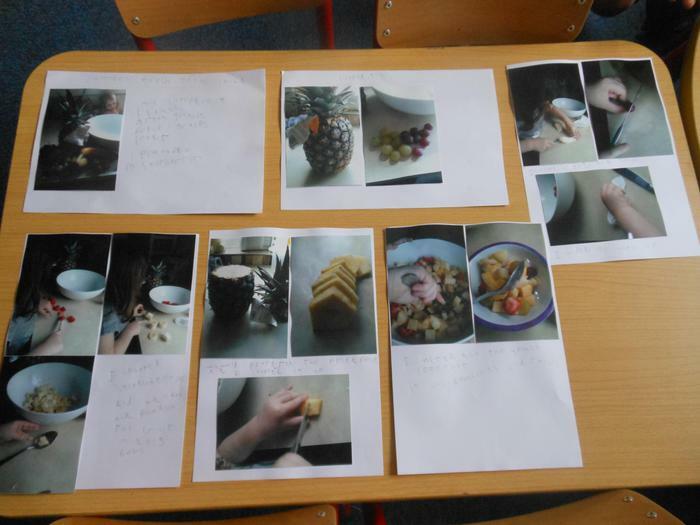 We used his 'Nature Morte' and 'A Still Life' to inspire us with our own creations. 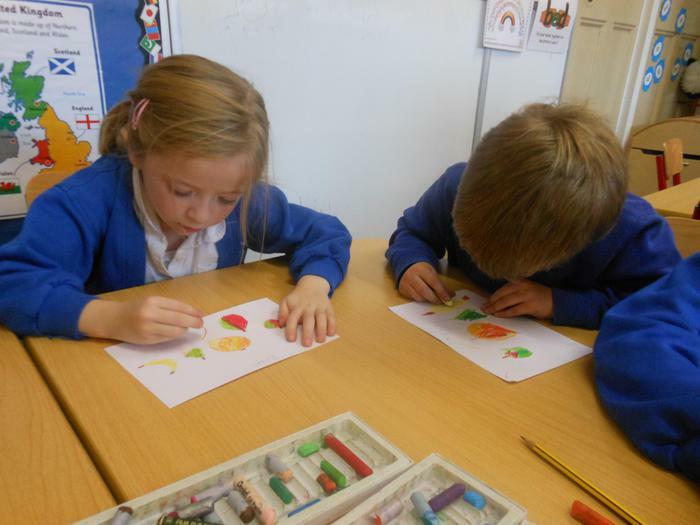 We used pastels to draw different types of fruit and then drew an arrangement of fruits in a basket. 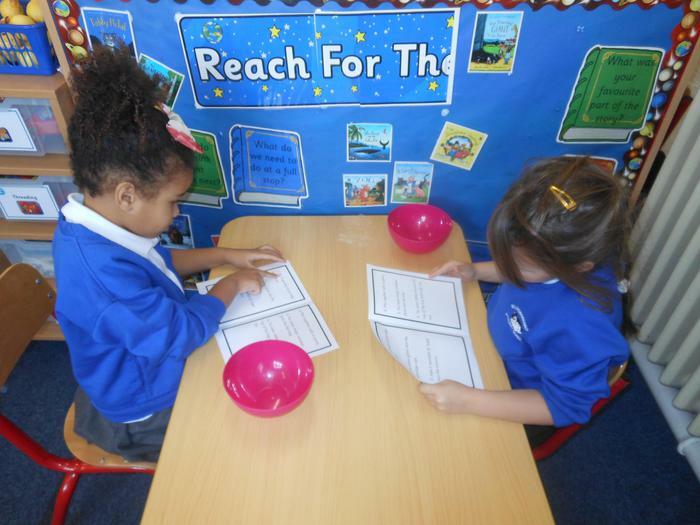 At 11o'clock, we showed our respect by stopping our activities in the classroom and sitting very, very quietly for 2 minutes. 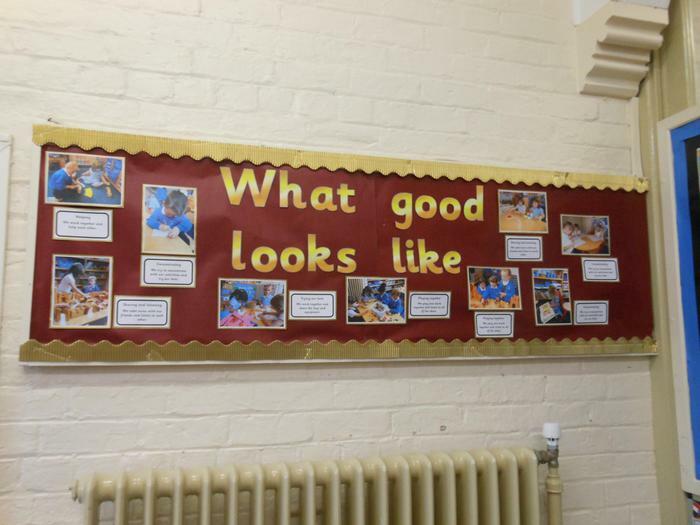 We were respectful and thoughtful. 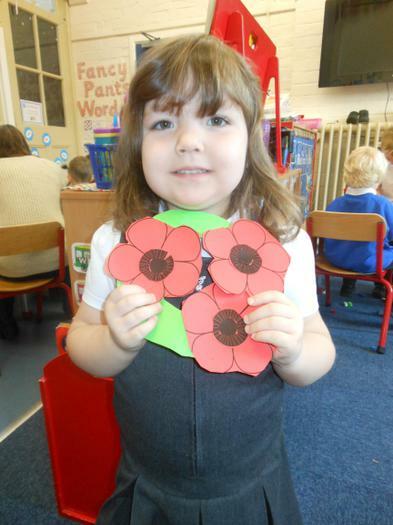 We made poppy wreaths and looked at some images comparing now and then. 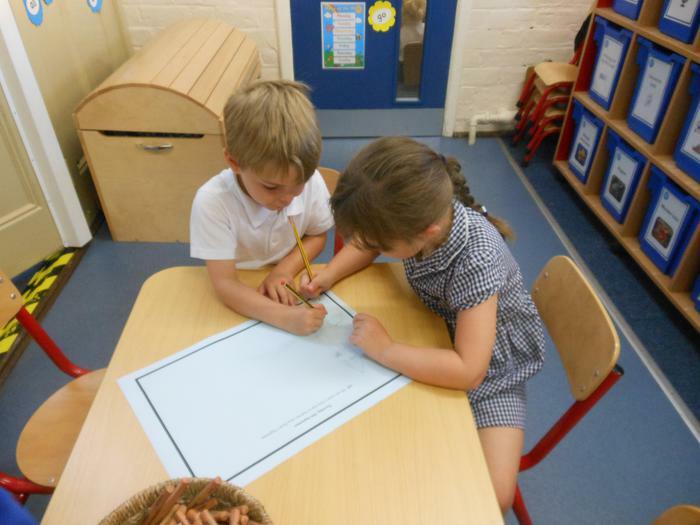 We discussed our thoughts and feelings with our talking partner. 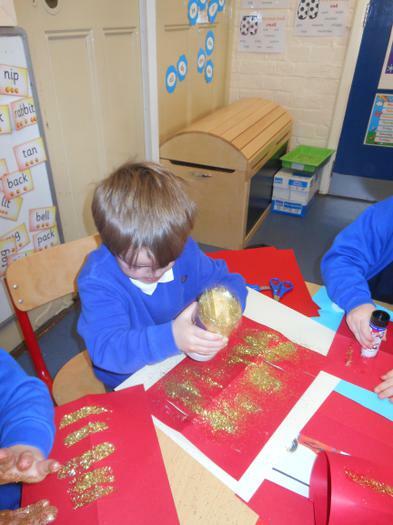 We have been enjoying reading The Little Red Hen and making our own moveable red hen puppets. 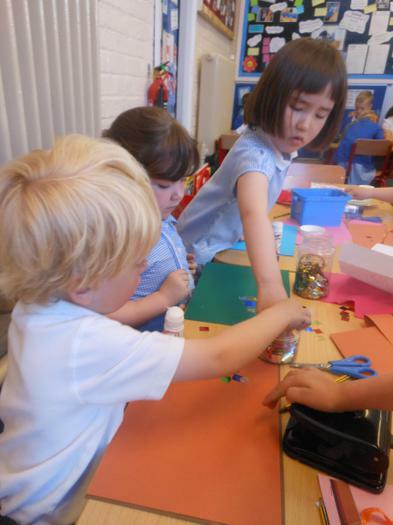 The Year 1 children worked in small groups to create a play using puppets. 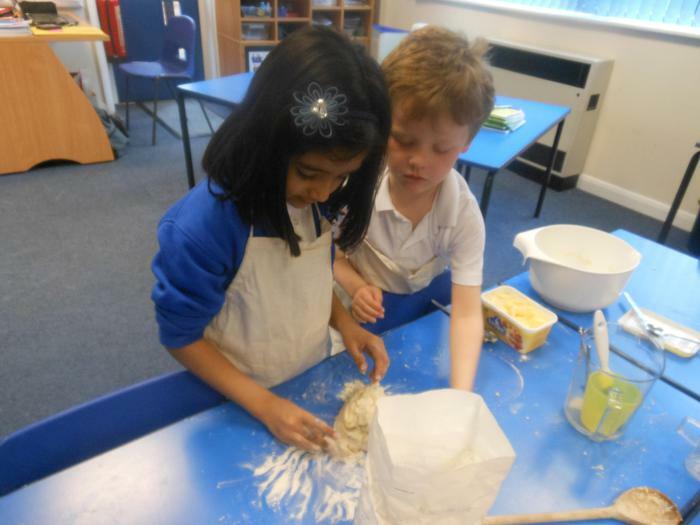 We then enjoyed the story of The Giant Jam Sandwich and followed the instructions to make our own bread. 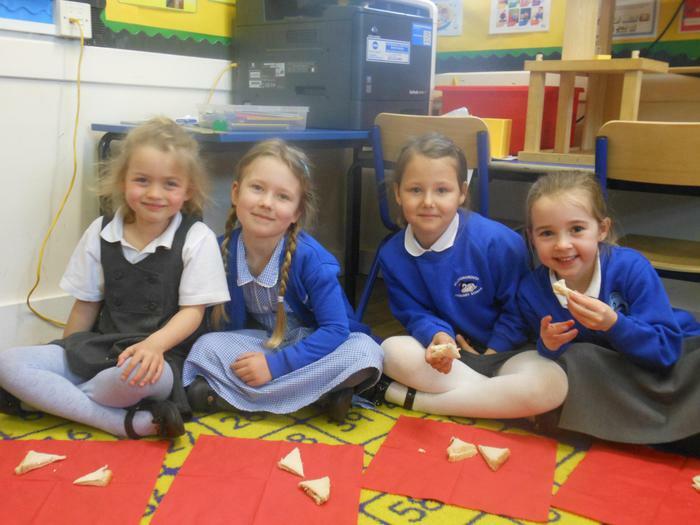 We also made strawberry jam sandwiches and tried a selection of other breads including naan bread, croissant, fruit loaf and pain au chocolat. 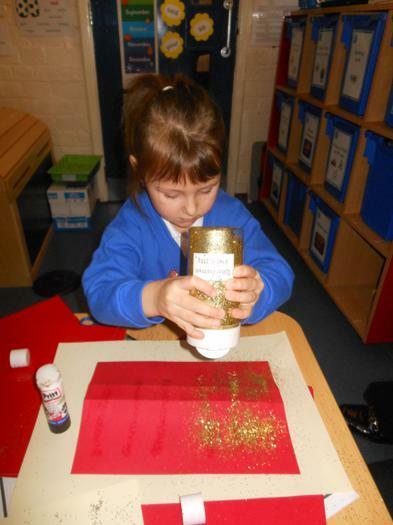 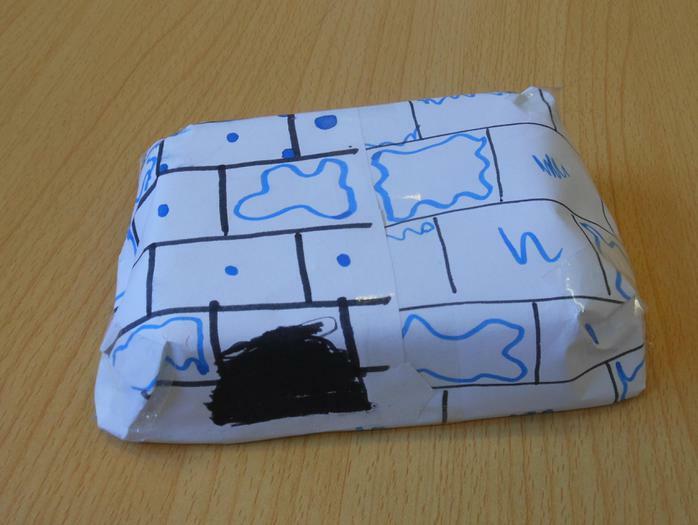 We have been very busy creating our card and wrapping paper designs ready for printing. 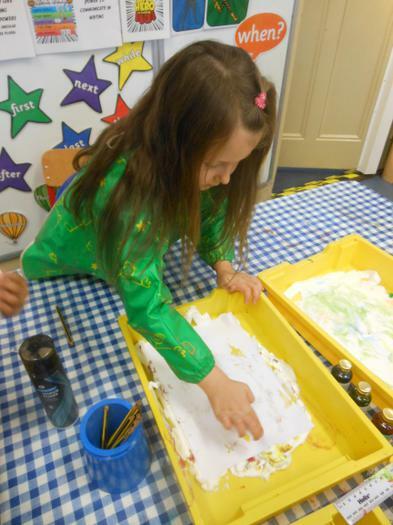 We enjoyed potato printing robins, penguins and snowmen too. 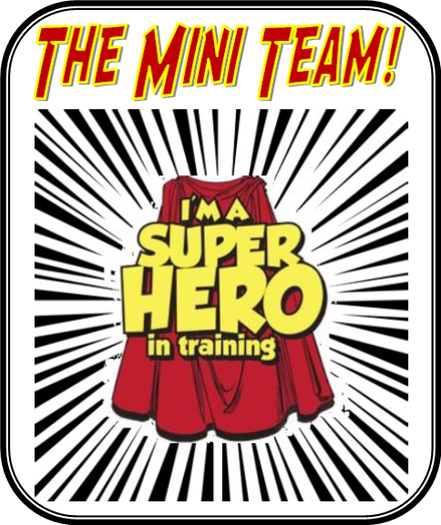 We were very excited to meet some of our new Super Grammar Heroes. 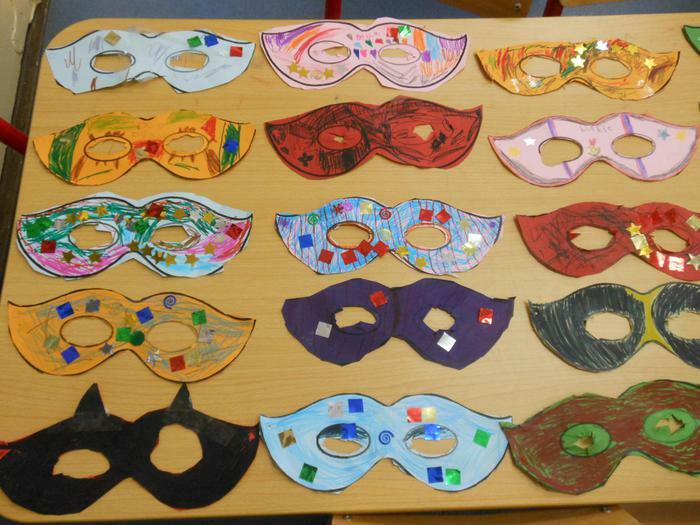 We all loved making super hero masks and then magical modifiers. 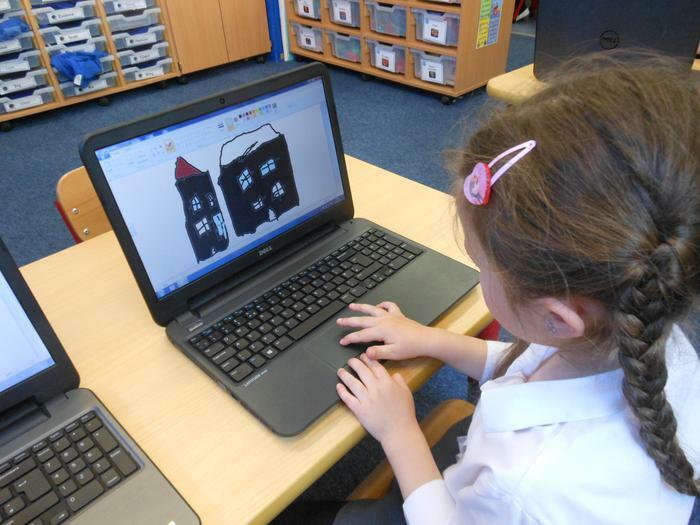 Our Magical Modifiers will help us to use exciting adjectives to add descriptive language to our writing. 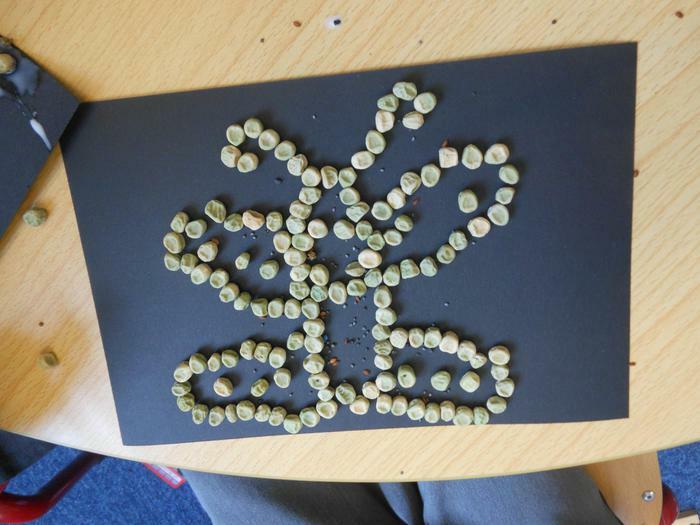 We used different seeds to create patterns or pictures, we carefully made our design and then glued the seeds into position when we had reflected on our collage. 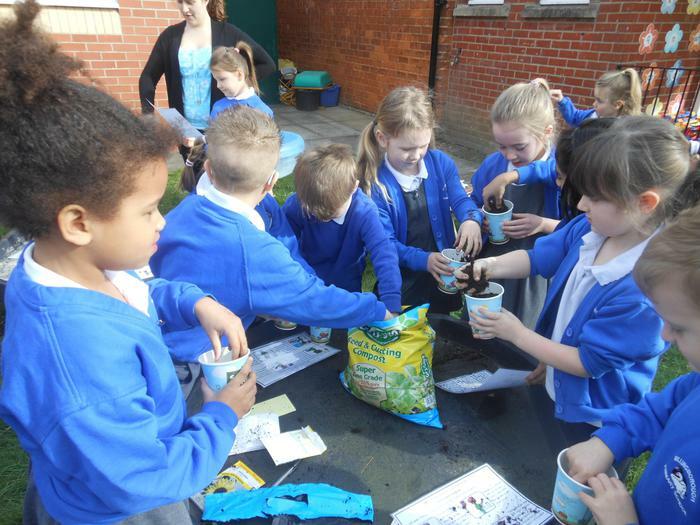 We used sunflower seeds, tomato, poppy, pepper, carrot, spinach and lettuce seeds. 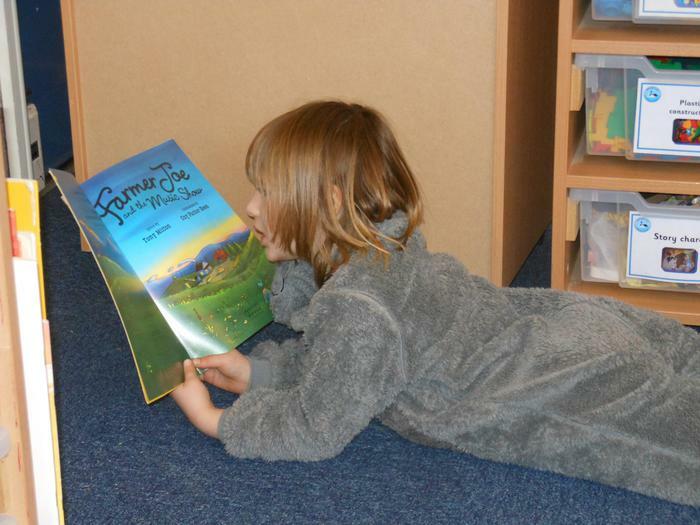 In Literacy, we have been reading two stories by Alison Bartlett and Vivian French. 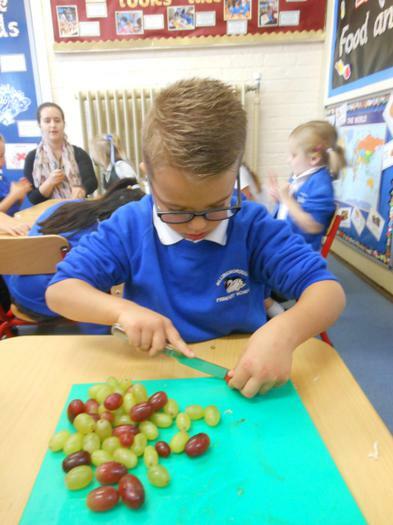 Oliver and his Grandpa love spending time together in the garden growing many different vegetables and fruits. 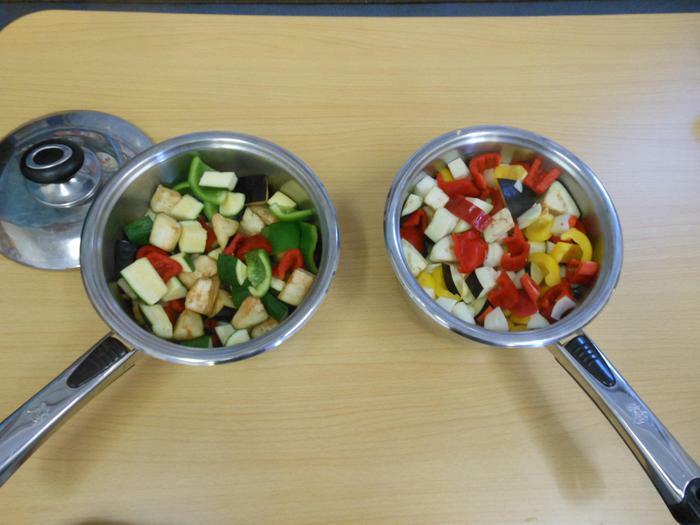 We worked together to make ratatouille and then fresh fruit salad. 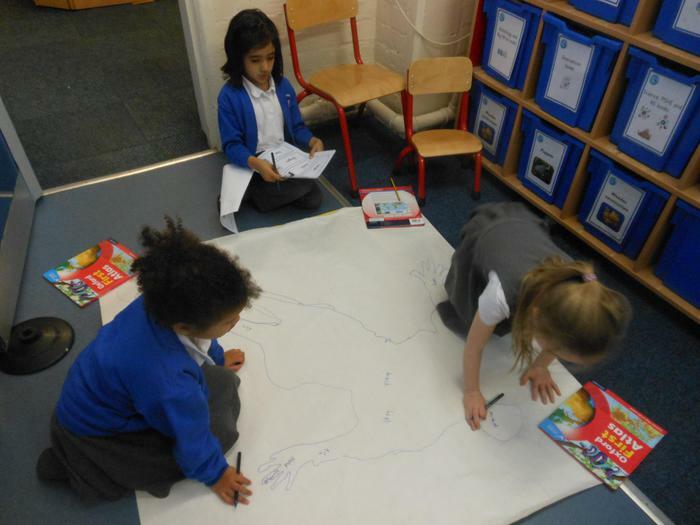 We also worked with a partner to create a Story Map of the story Oliver's Vegetables. 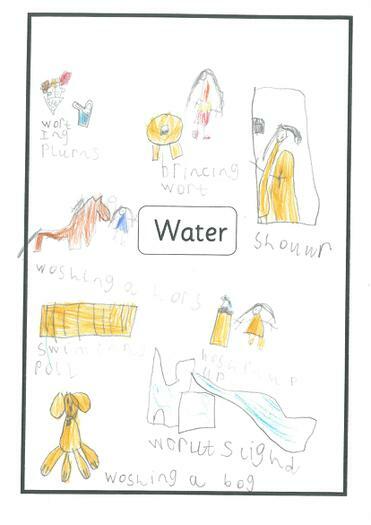 We would then use this story map later in the week to support us with our writing. 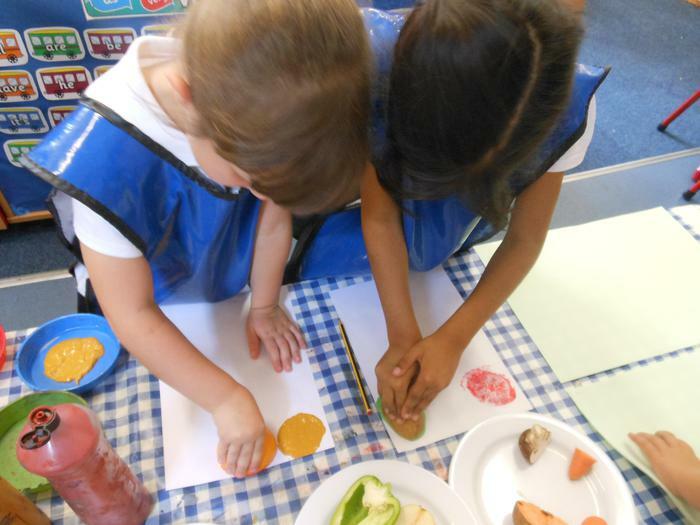 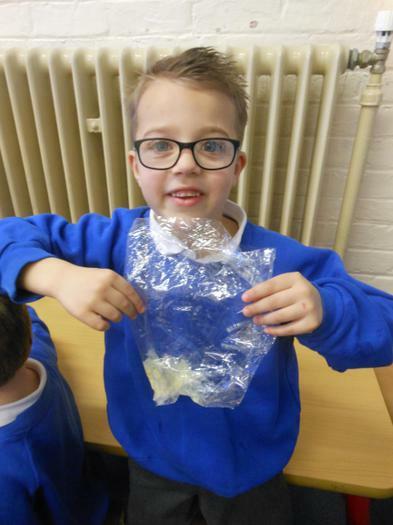 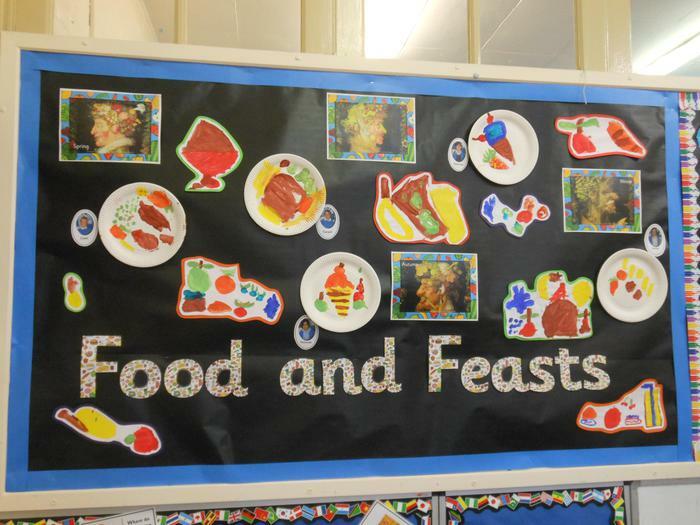 We have been exploring different fruits and vegetables and thoroughly enjoyed printing with a variety of foods. 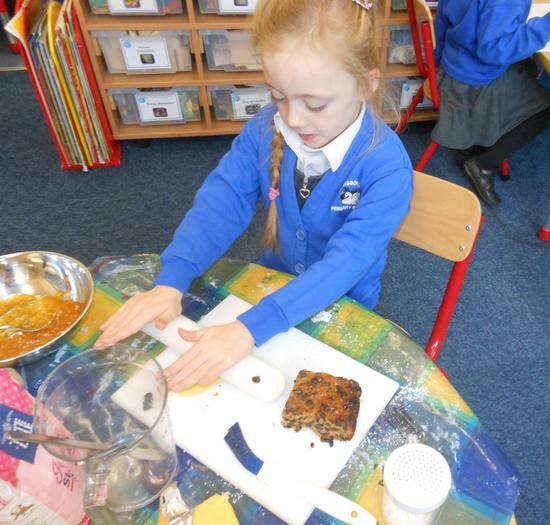 We used broccoli, pepper, celery, potato, carrot, mushroom, orange, lemon and pear. 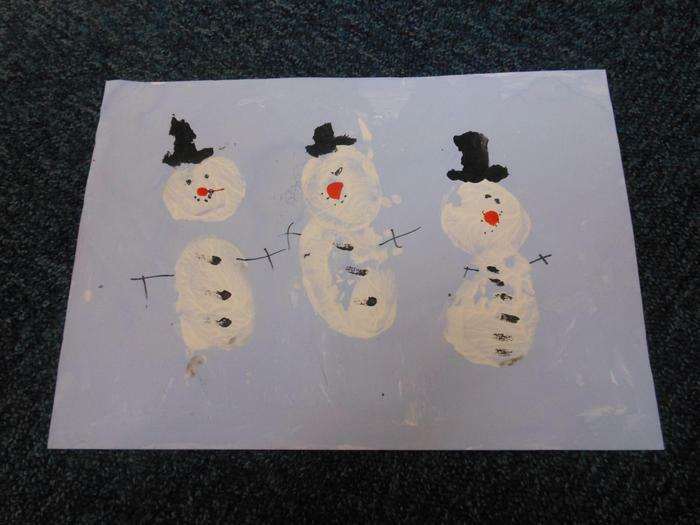 In a few weeks we will be designing Christmas pictures, where we will continue to use vegetables for printing robins, snowmen and penguins. 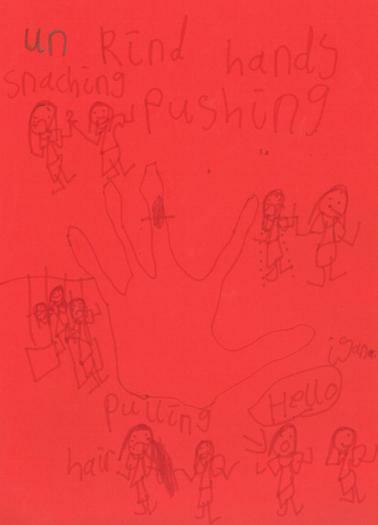 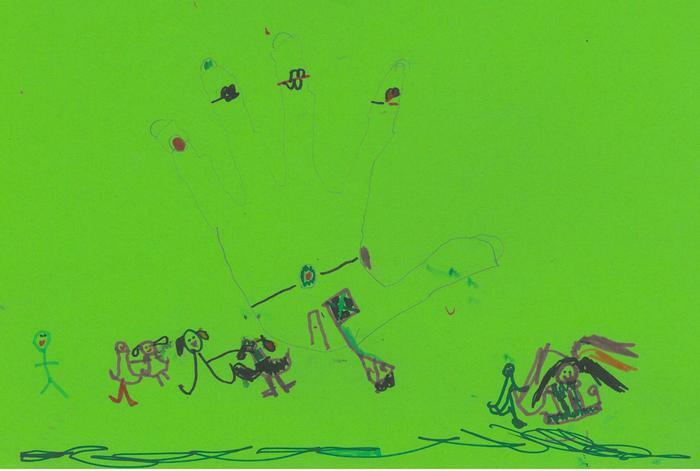 We have been thinking about our hands and how we use them for many different things such as clapping when someone does something good, drawing a picture for someone, giving a present to someone, waving and hugging when someone is sad. 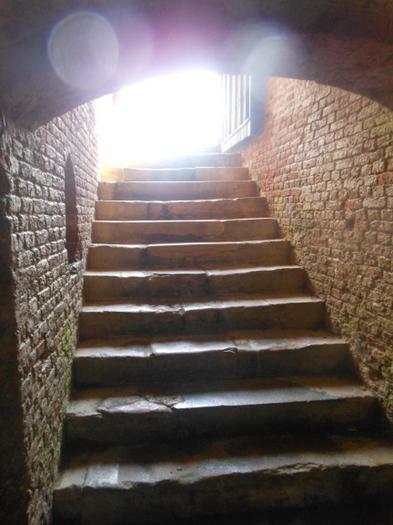 would make us and our friends feel. 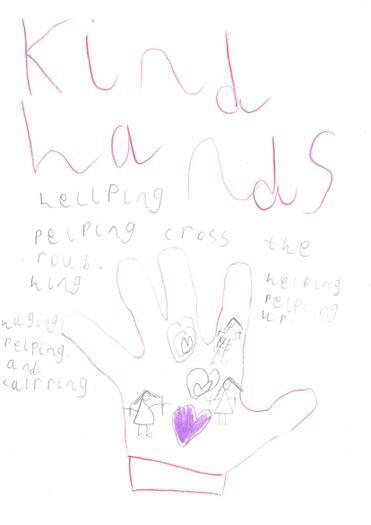 We designed posters to share our ideas about kind hands. 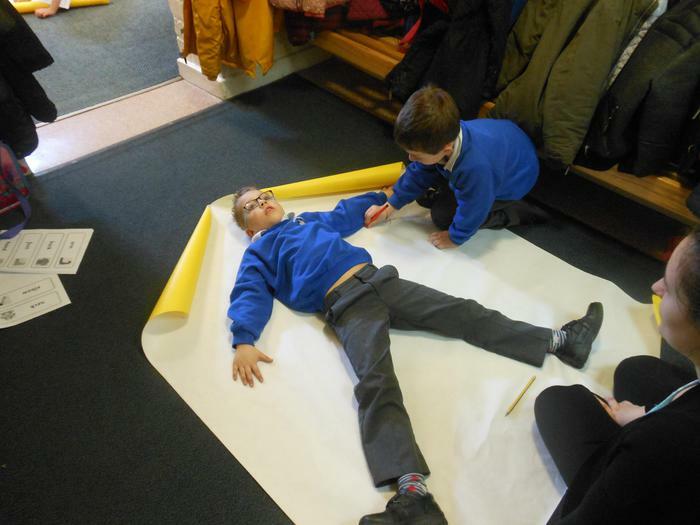 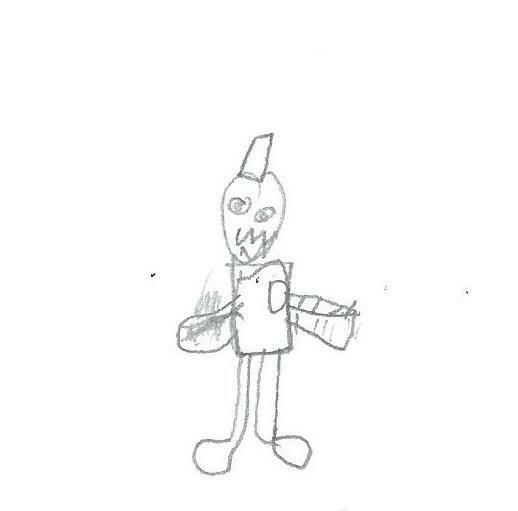 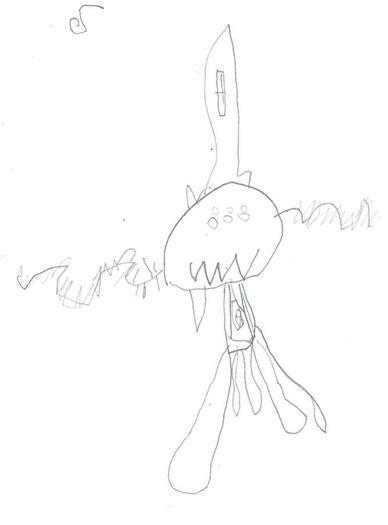 We listened to the instructions to draw a 'Crazy Creature' however, we soon realised that the instructions needed to be very clear and precise. 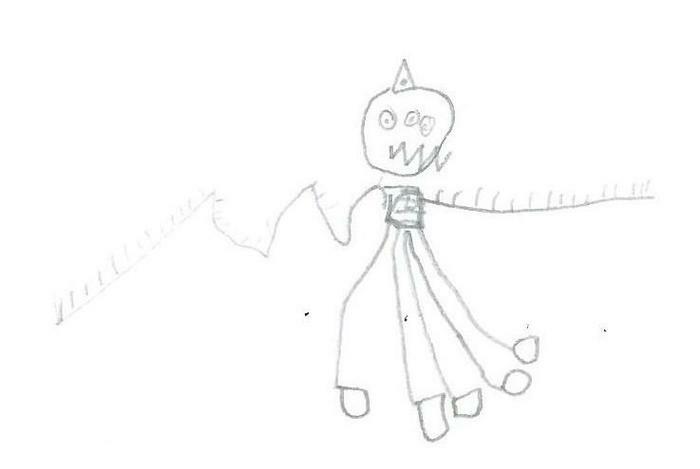 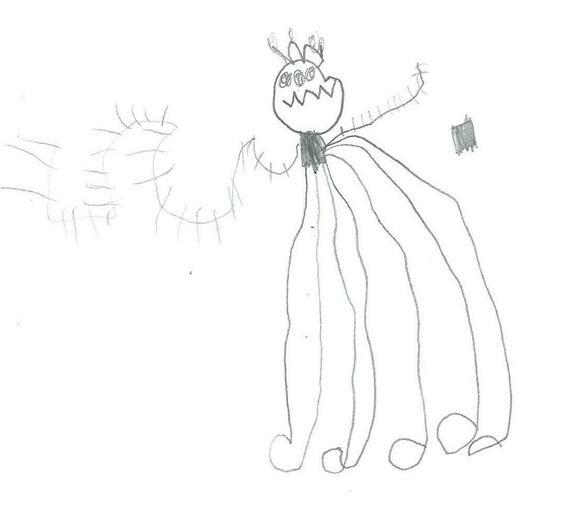 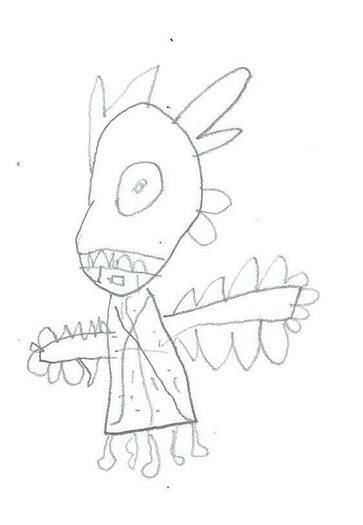 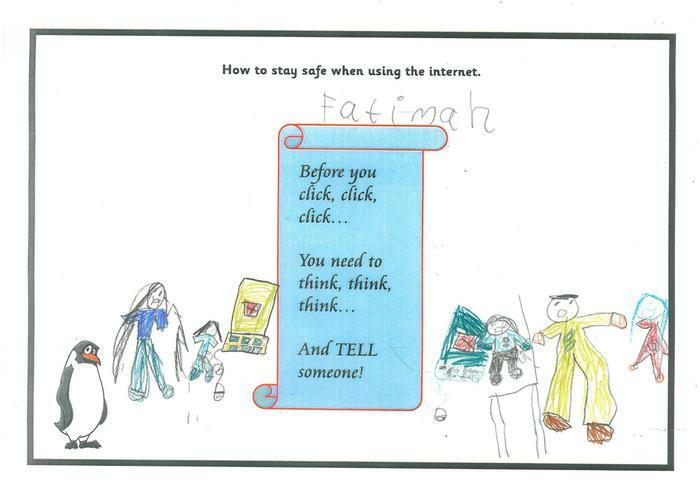 Fatimah then gave us very clear but detailed set of instructions to enable us to draw the creature she was thinking of. 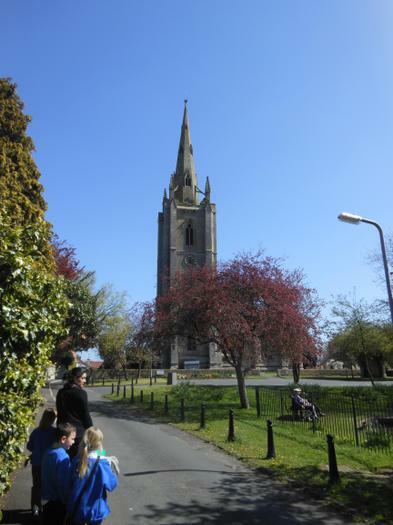 What type of homes and buildings are in our local area? 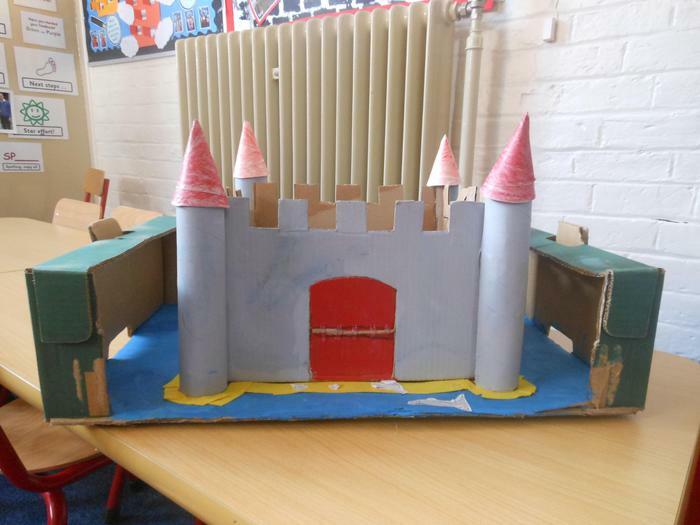 Can we become architects by designing and making a model 3D house? 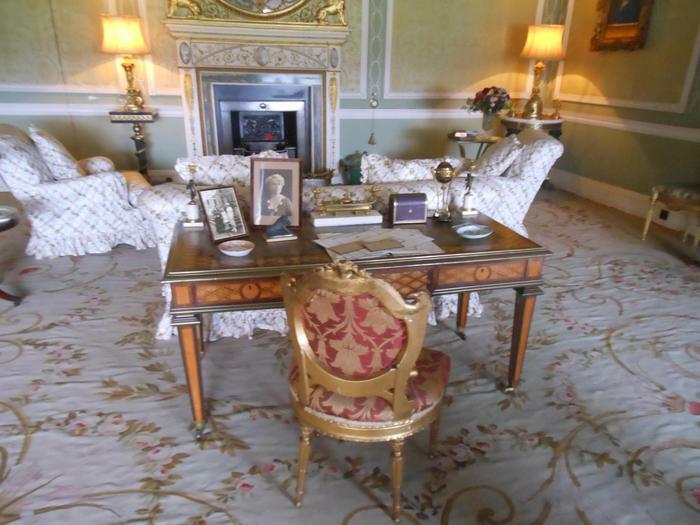 to homes and buildings in the United Kingdom? 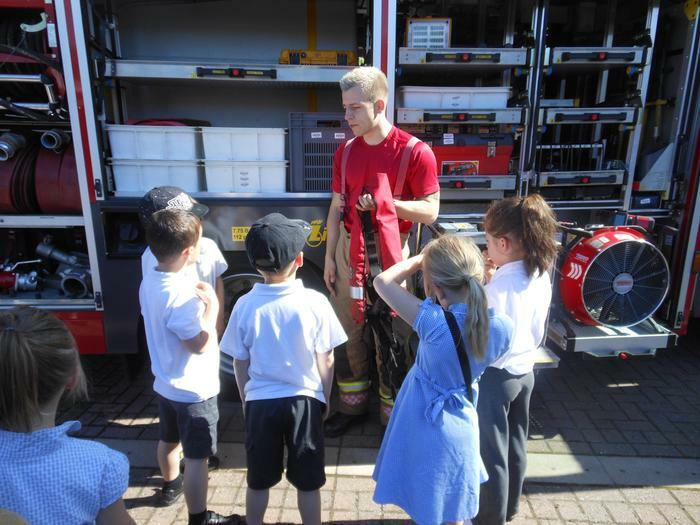 To conclude our learning about The Great Fire of London and comparing this with our local heroes 'Billingborough firefighters', we enjoyed the morning at Billingborough Fire Station. 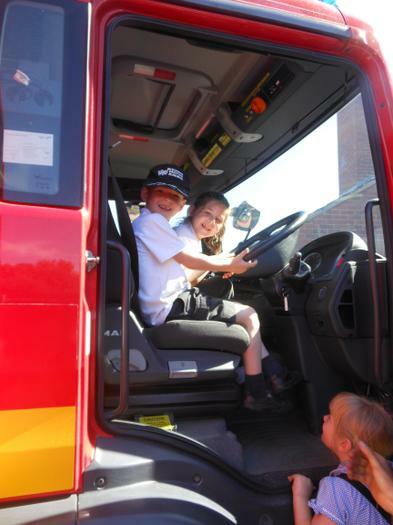 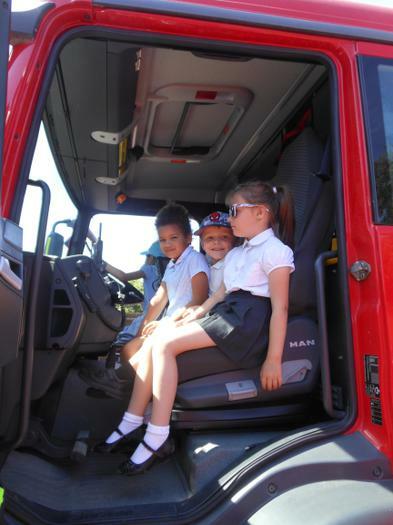 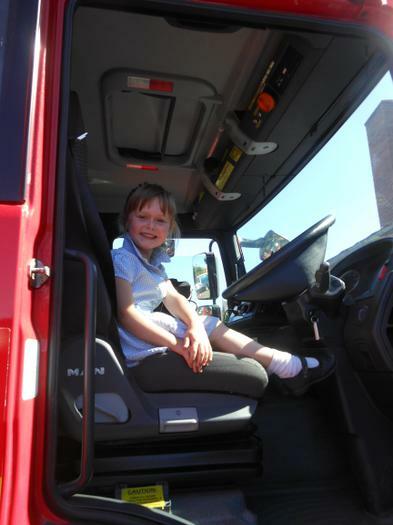 We found out about the different uniforms as well as the equipment in the fire engine. 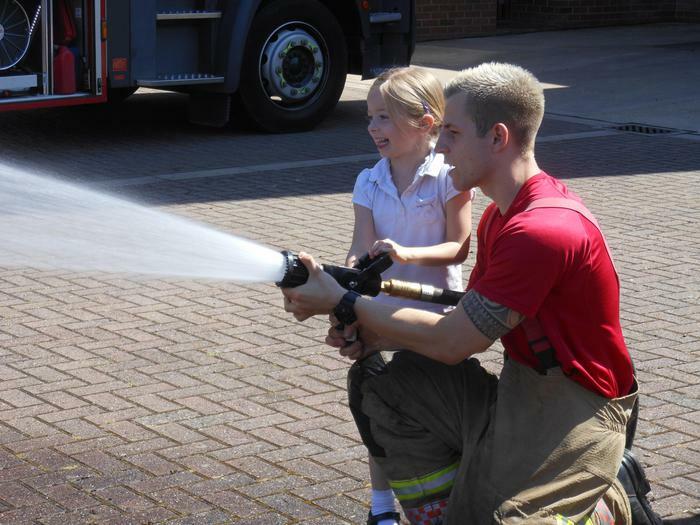 Finally, we thoroughly enjoyed using the water hose and seeing how the front doors of the fire station opened. 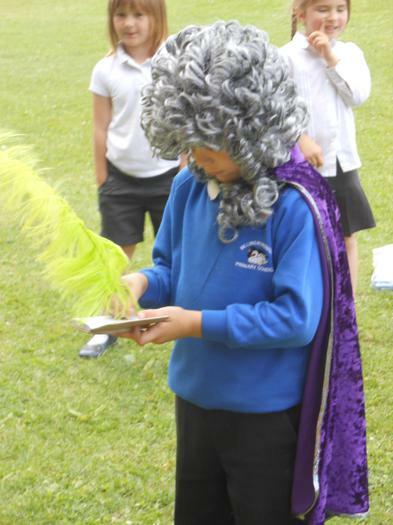 We also shared our knowledge of the historical event that took place in Pudding Lane, London in 1666. 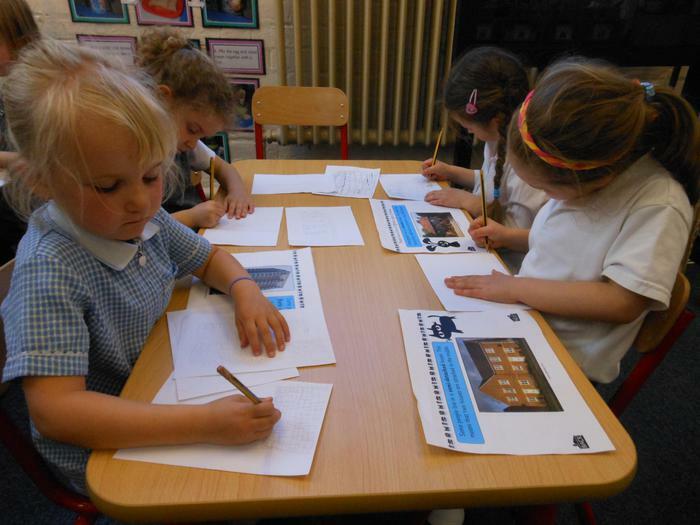 Over the last few weeks, we have been finding out The Great Fire of London. 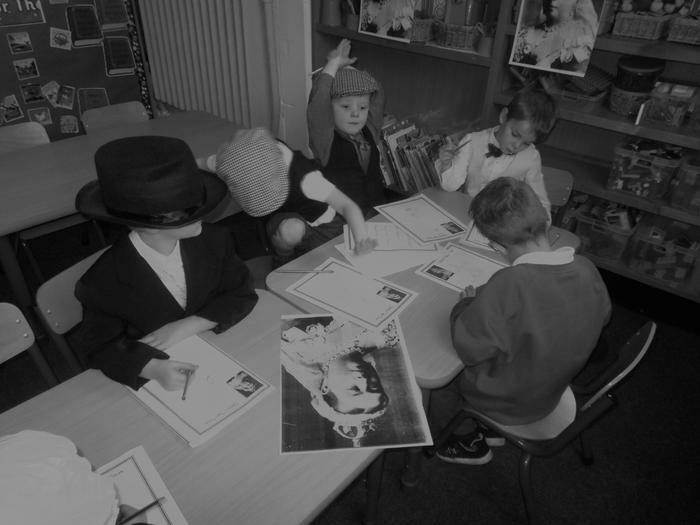 Using a variety of non fiction books we began to discover the events that took place in Pudding Lane, London, 1666. 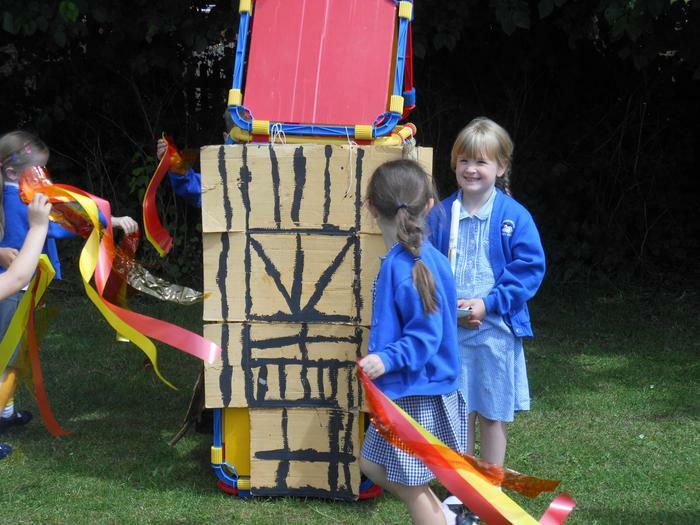 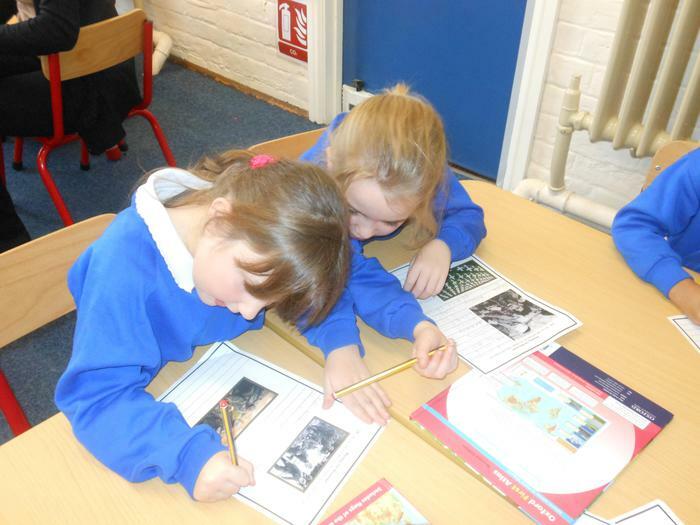 Together we wrote the story of The Great Fire of London. 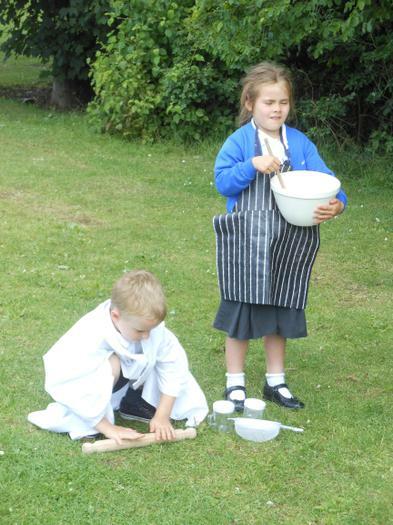 In 1666, there was a baker called Tom who worked hard in his bakery. 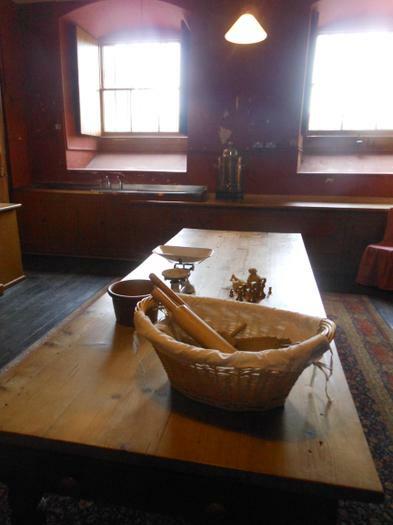 The bakery was in Pudding Lane, London and the smell was amazing. 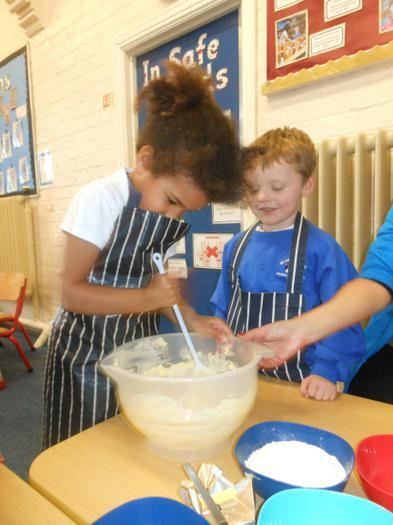 On 2nd September, there was a small fire in the bakery because the coal fell out of the oven onto the straw. 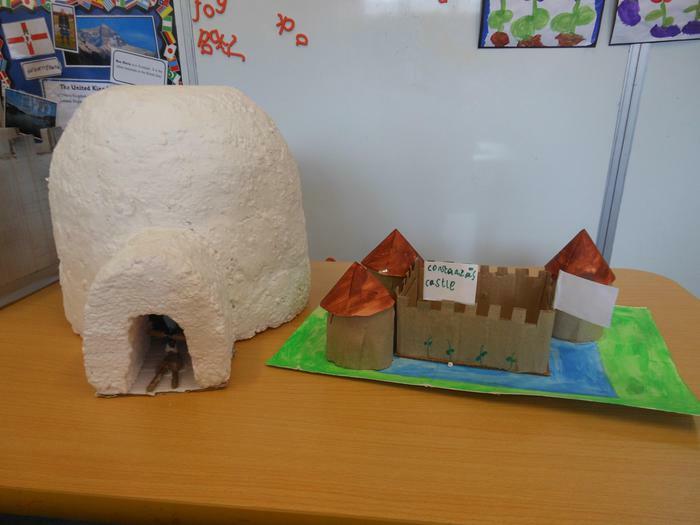 In London, the houses were made of wood and plaster with thatched roofs. 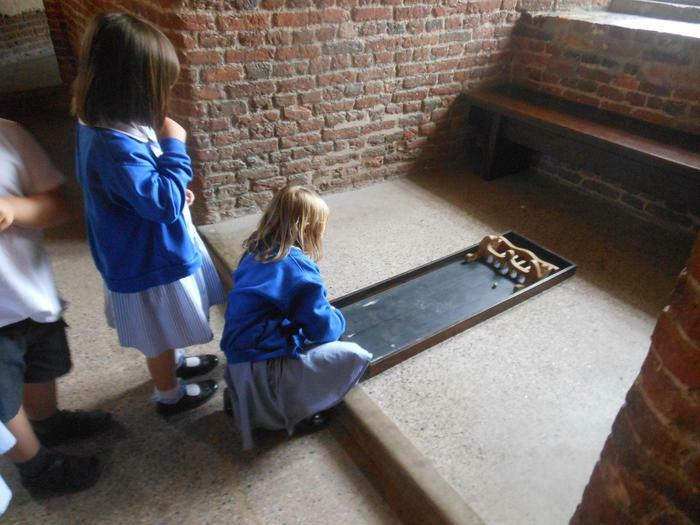 The wooden beams were dark black. 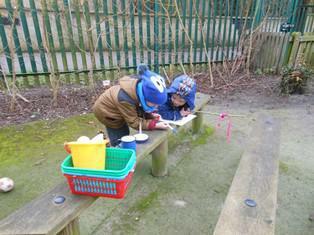 People had candles to help them see and keep warm. 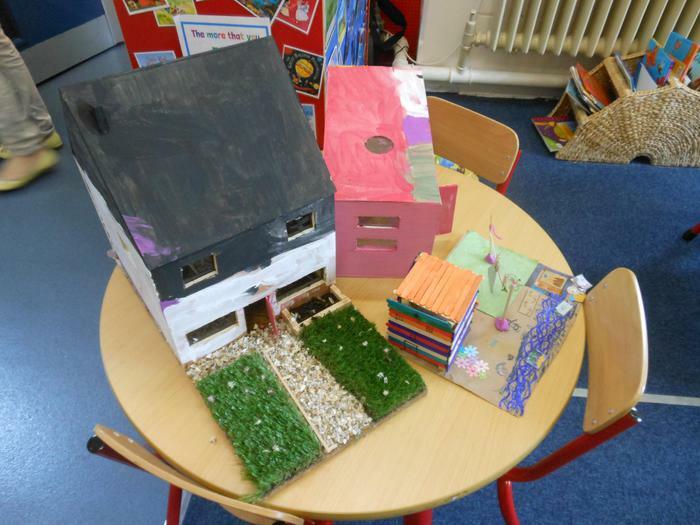 The houses were very close together. 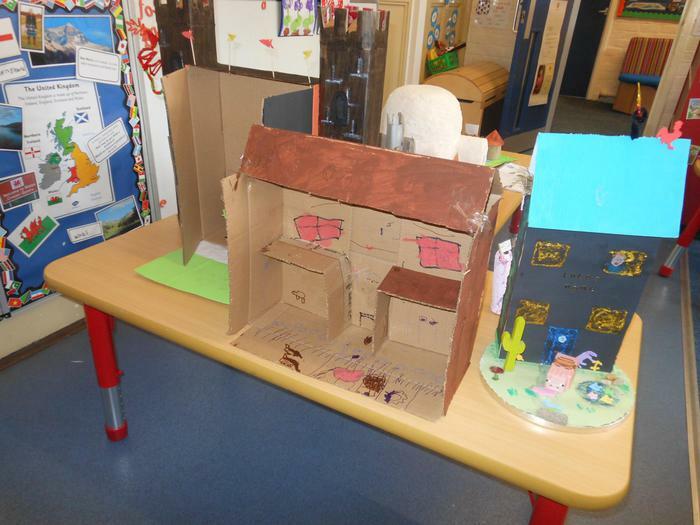 The fire started in Tom's bakery and it spread quickly because the houses were built of wood and straw. 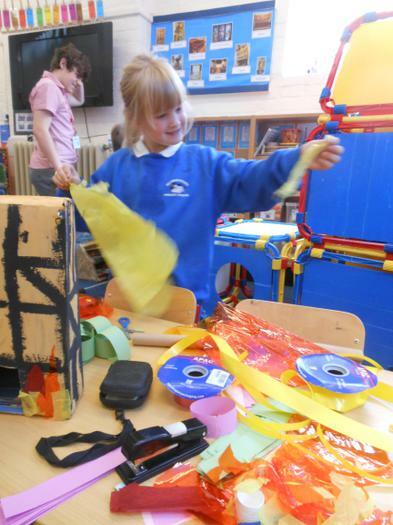 The wind blew the fire to some other houses. 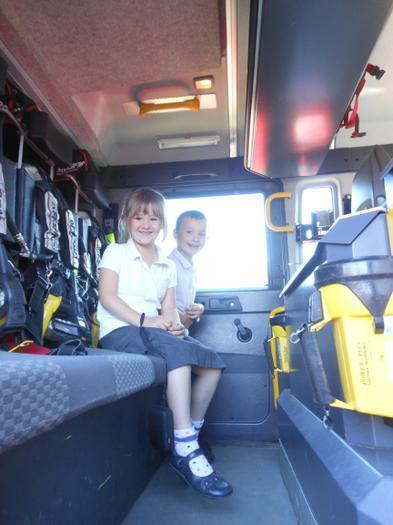 Everybody was screaming when the fire spread and they escaped from their houses. 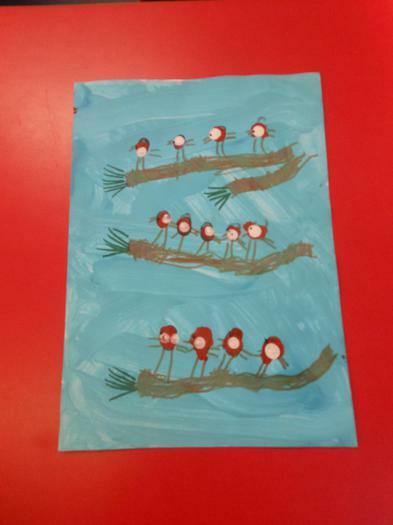 They took their special things, escaped into wooden boats and sailed along the River Thames. 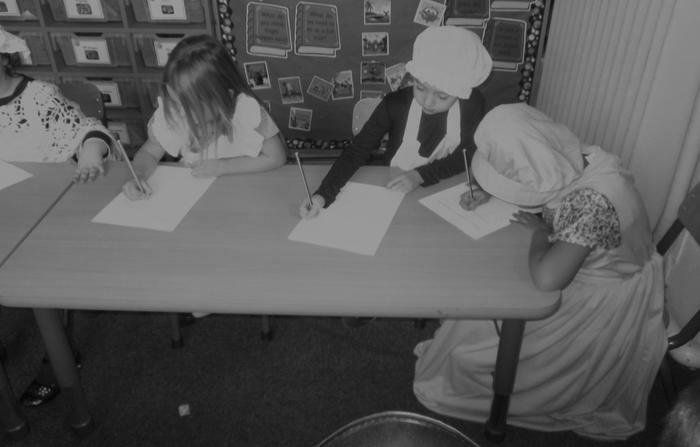 Samuel Pepys noticed the fire and started writing in his diary. 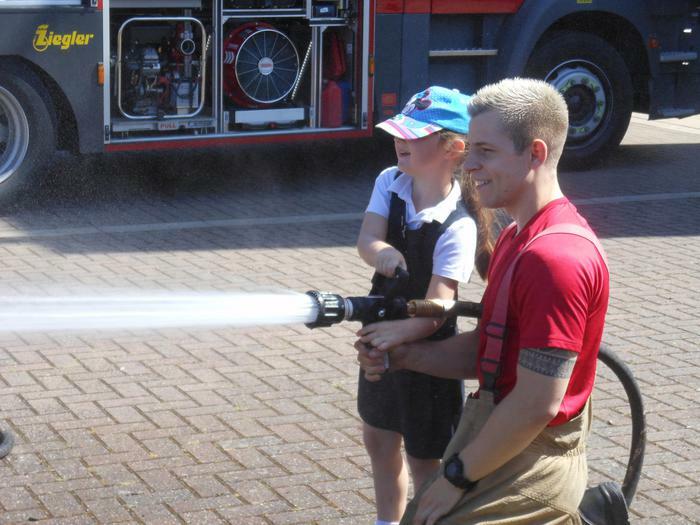 People tried to put out the fires using water squirters as they did not have fire engines like today. 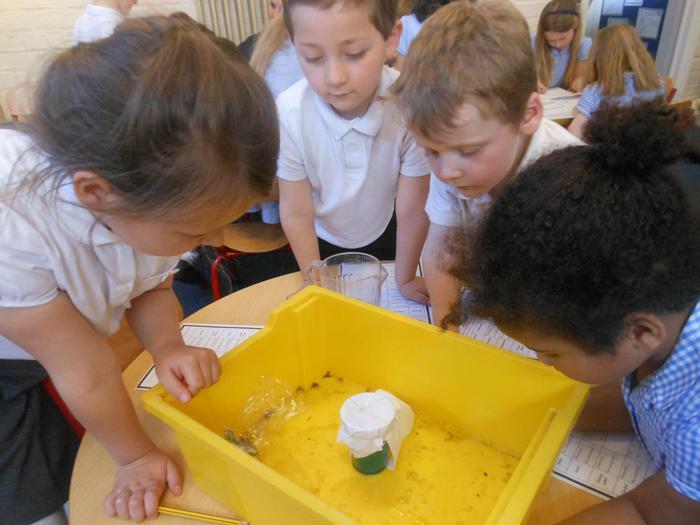 They used buckets of water and the water came from the River Thames and passed the buckets along to each other. 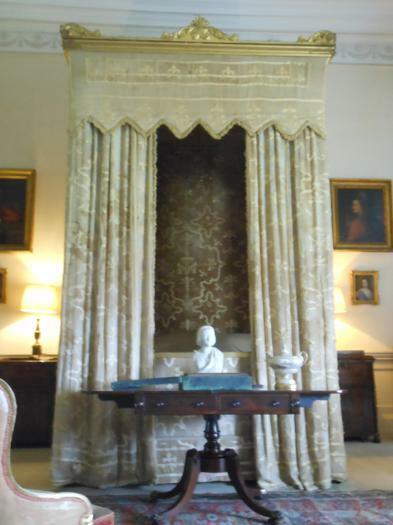 King Charles II, King of England wanted to pull some houses down using metal hooks as this would stop the fire from spreading. 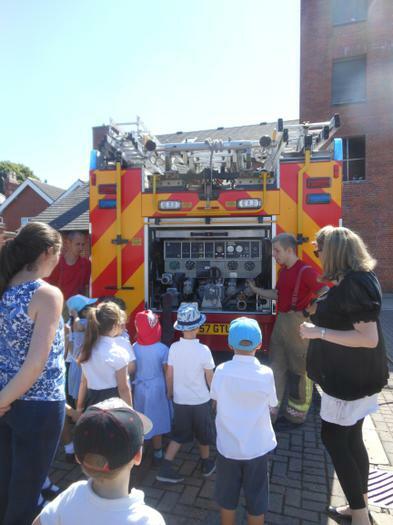 The fire was put out by Thursday 6th September. 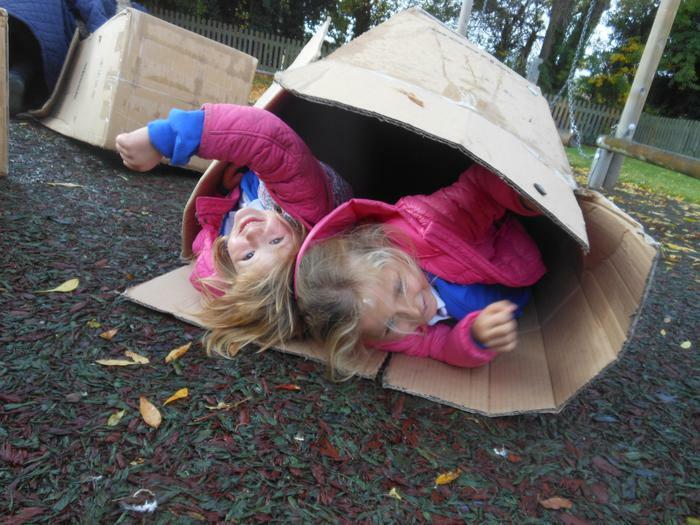 Thousands of people were made homeless. 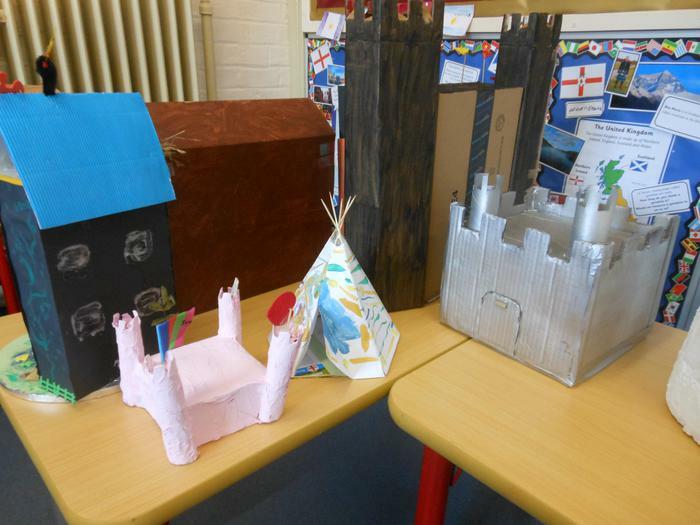 After the fire, they had to rebuild parts of London, the houses had to be made from stone and were built further apart. 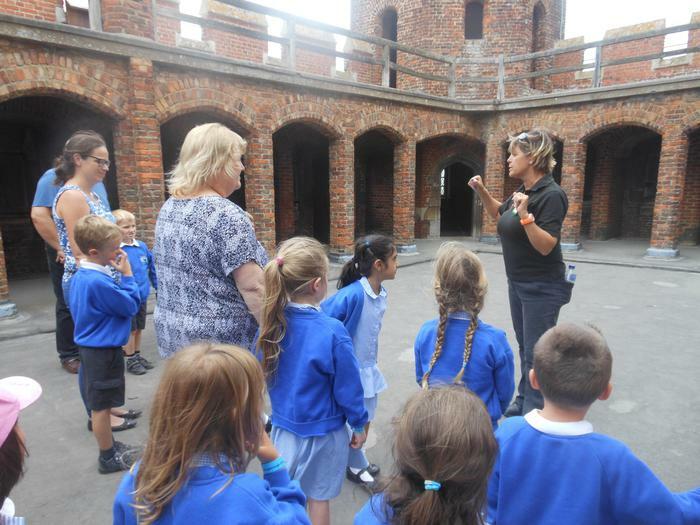 "How many sleeps until our school trip?" 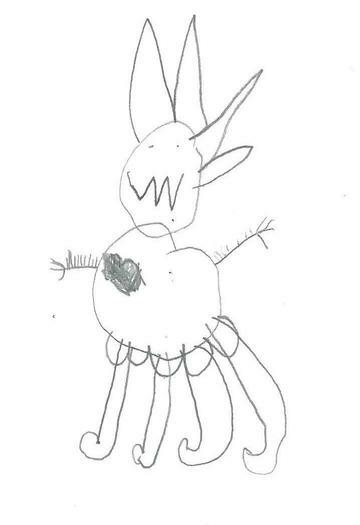 After a several weeks of waiting. 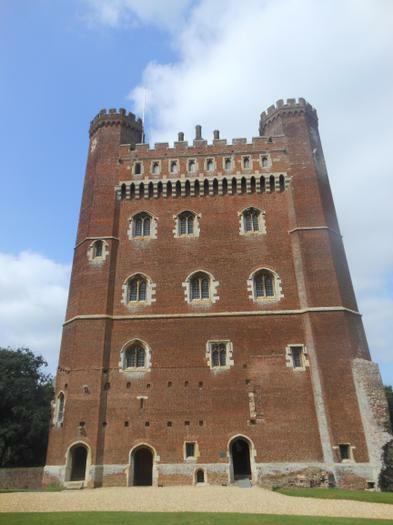 Wednesday 29th June was here. 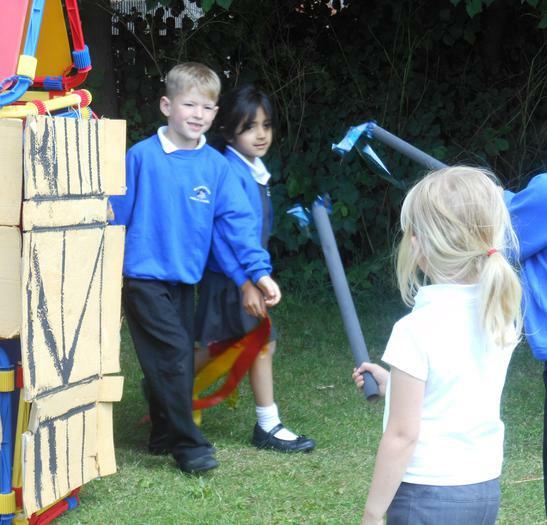 Our adventure began as we carefully climbed onto the coach and waved to our parents who were waiting in the playground. 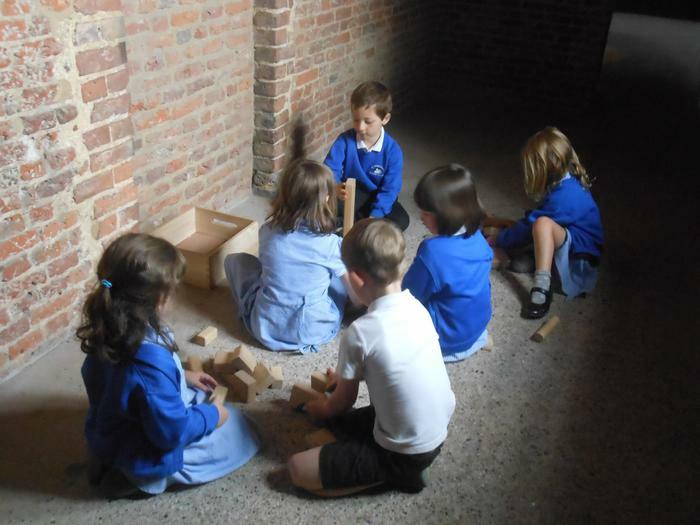 We arrived at Belton House and enjoyed time in the Discovery Centre exploring the contents of an old suitcase, trying dressing up clothes on and playing with the wooden train and building blocks. 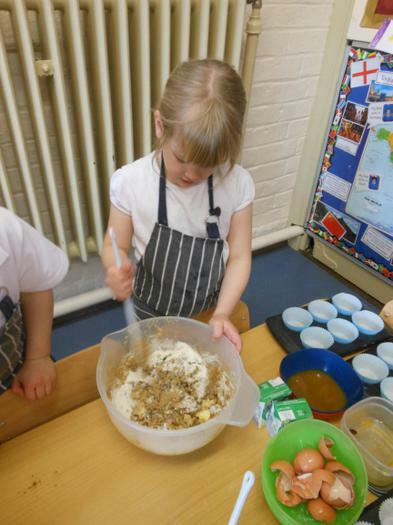 including sweeping the floor and making the bread and butter. 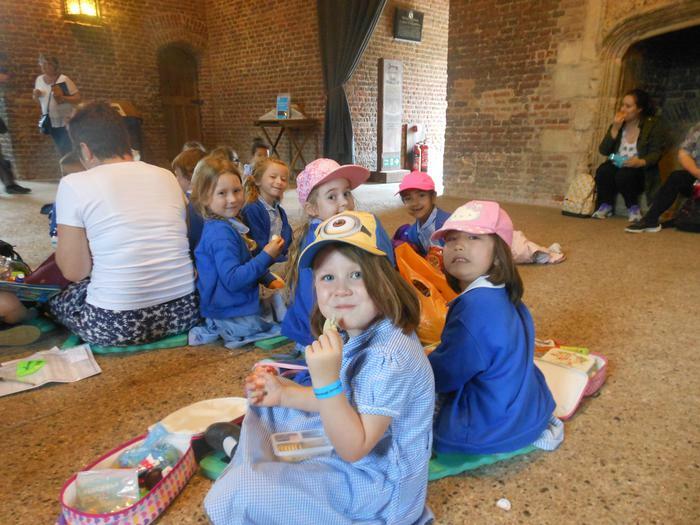 We then went to the Discovery Centre and enjoyed lunch. 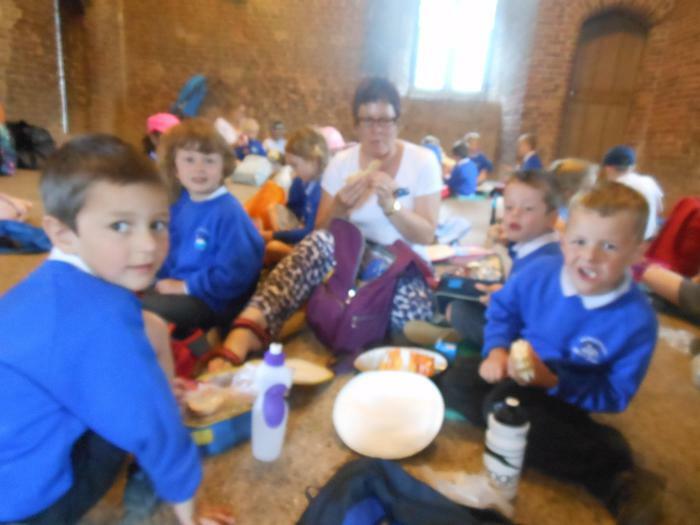 We had worked so hard this morning we were certainly ready for our sandwiches, fruit and drinks. 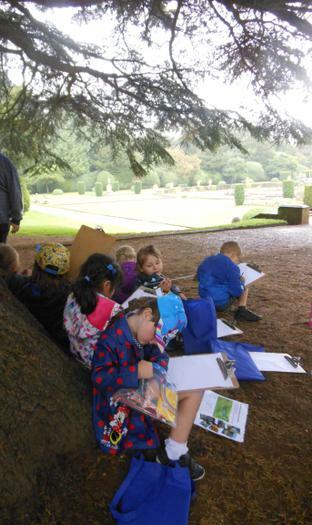 After lunch we became 'artists' and explored the Italian garden once more, we each had a clip board, pieces of paper and canvas artists bag. 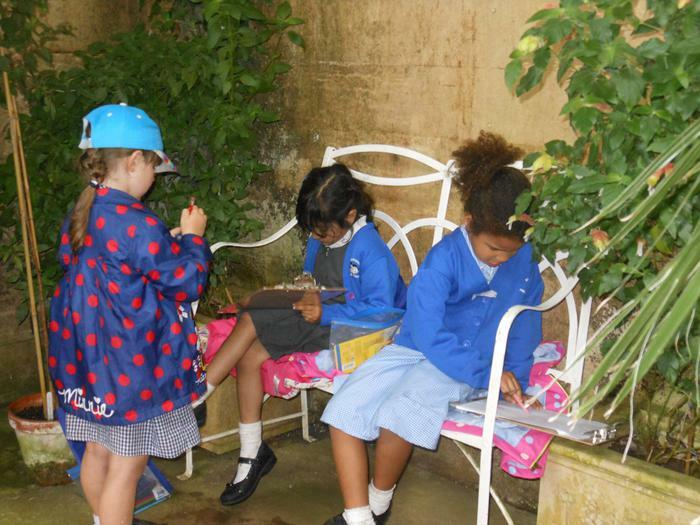 We found a superb tree that became 'our umbrella' to shelter us from the rain. 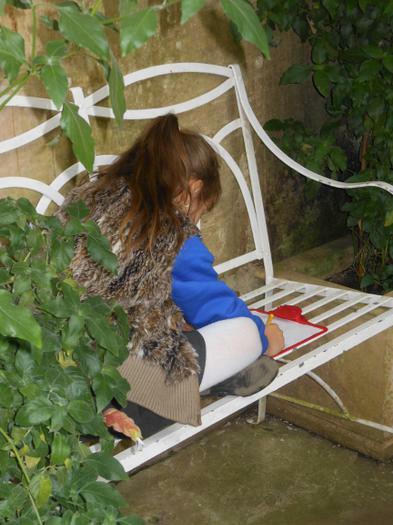 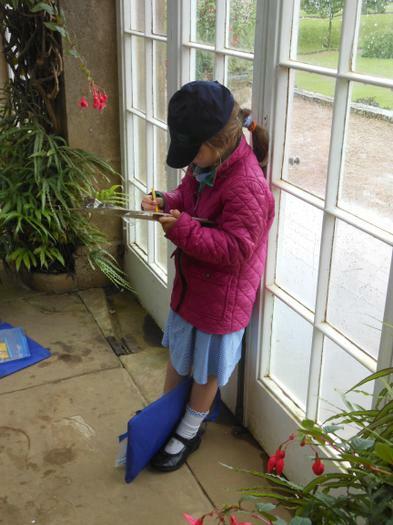 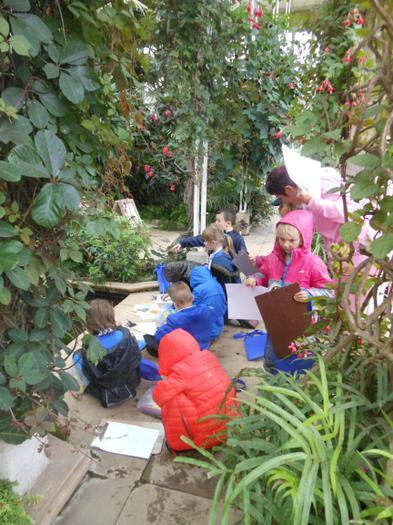 Afterwards we walked to the Orangery to continue drawing flowers, plants and fish. 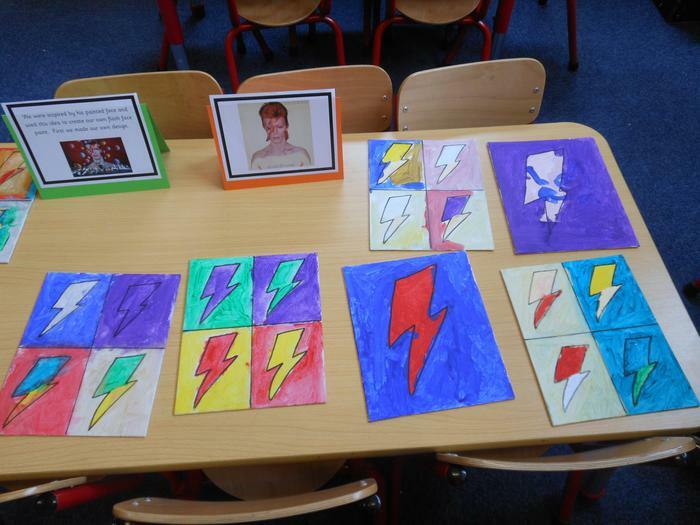 Over the last two weeks, we have been learning about David Bowie and have been enjoying many creative activities including drawing, painting, model making, dancing, paper mâché and marbling. 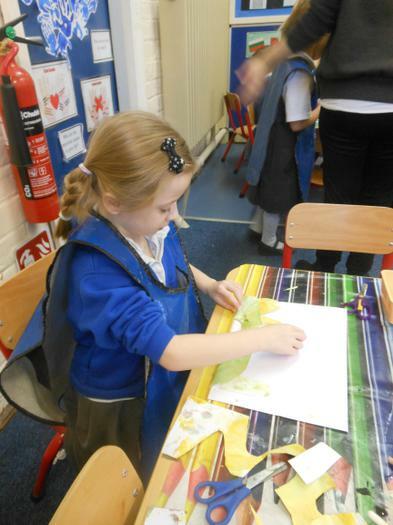 We then transformed our classrooms into galleries to display our art work for friends and family to see. 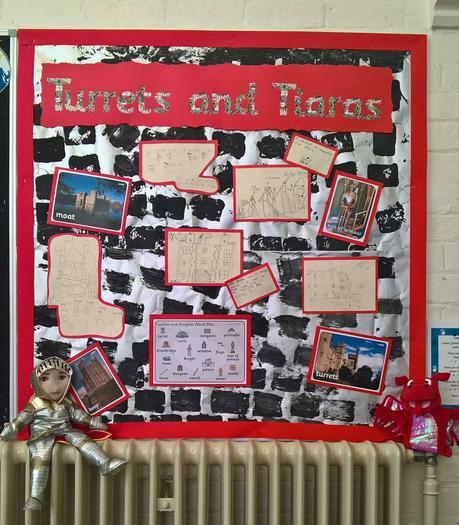 We have been finding out Queen Elizabeth II and the Royal residences. 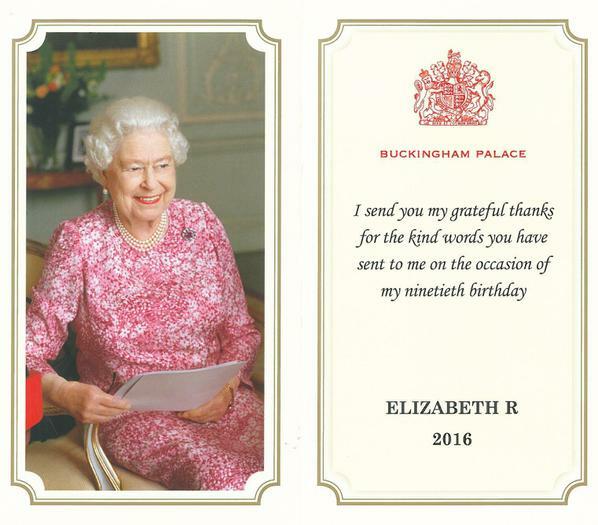 We made special happy birthday cards and sent them to Buckingham Palace. 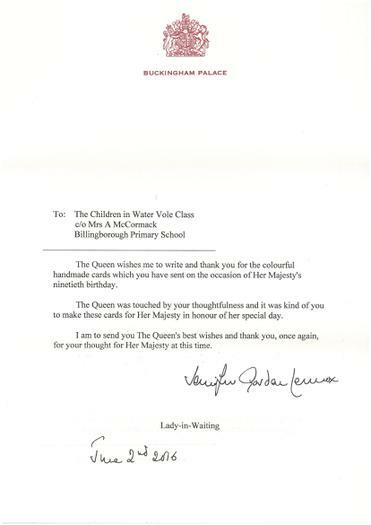 Last week, we received a very special delivery and were very excited to open an envelope containing a thank you card from the Queen and a thank you letter from her Lady-in-Waiting. 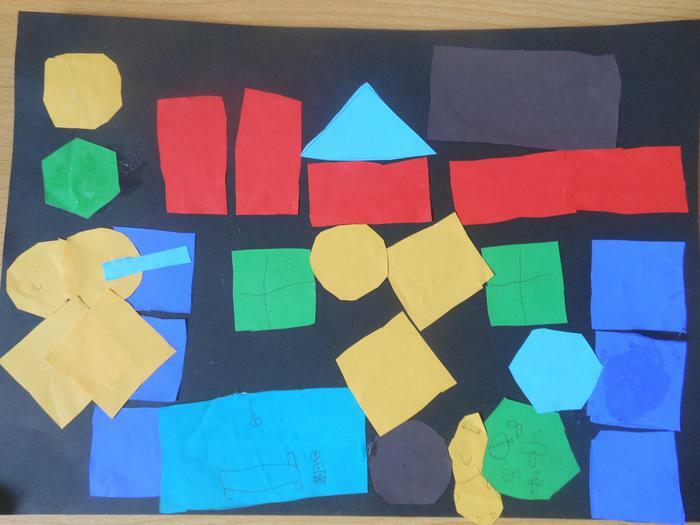 We have been finding out about different homes and buildings including detached, semi detached, terraced, house boat, caravan, flats and cottages. 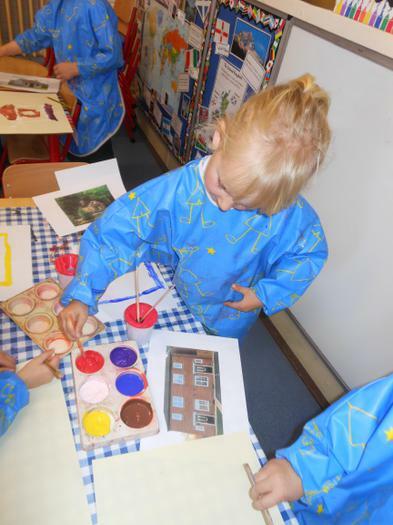 We looked carefully at the examples and then painted a picture of a building remembering to carefully mix the colours and to really try with our art work. 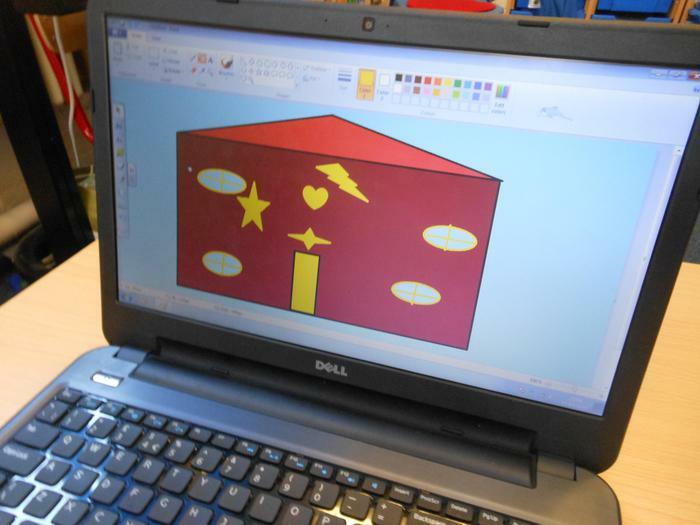 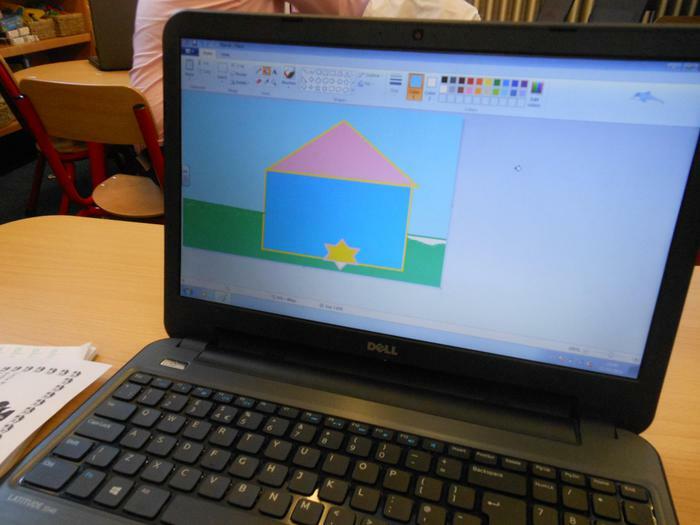 We have also been trying very hard with our observational drawings of buildings, as well as using the Paint program on the laptops. 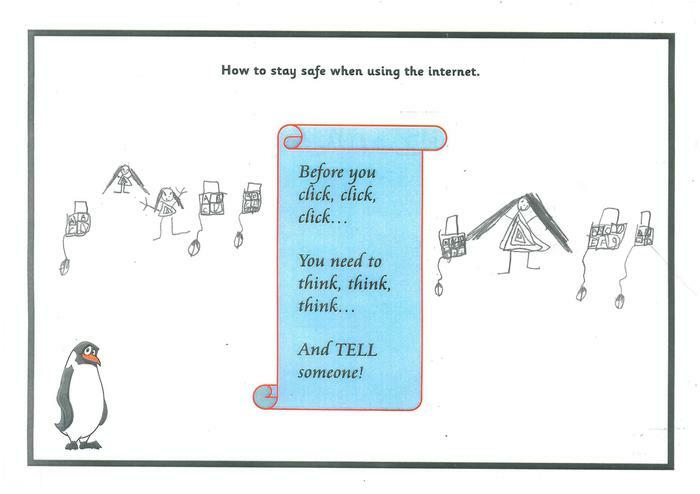 On Thursday, we learnt how to stay safe when using the internet. 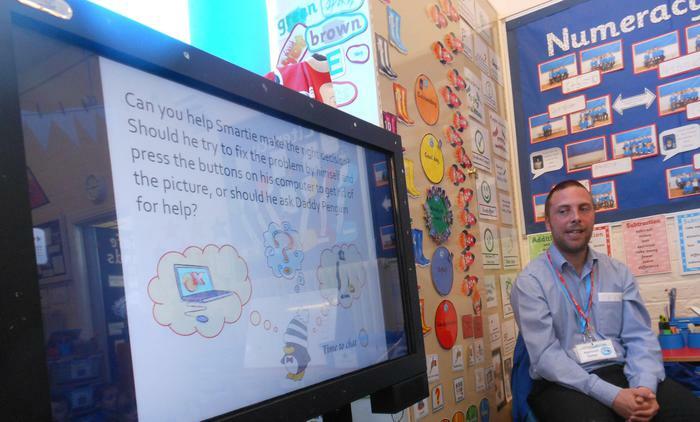 Dan read us a story about Smartie and taught us a song. 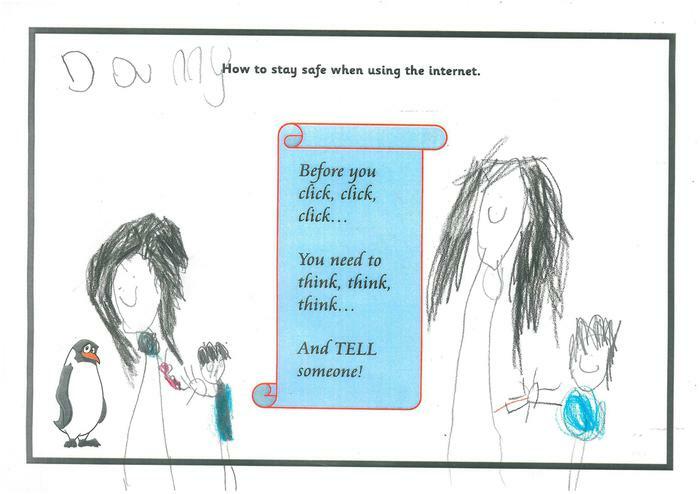 We then created posters to remind us how to stay safe and shared these with our families too. 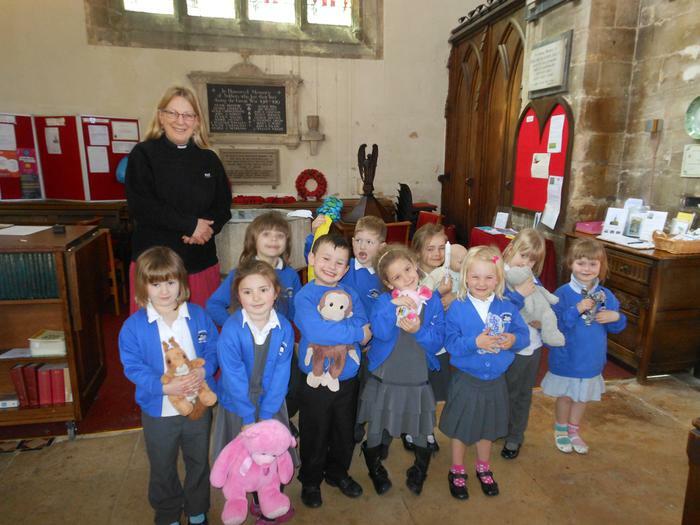 On Wednesday, the Year 1 children went to see Rev Anna at the village church. 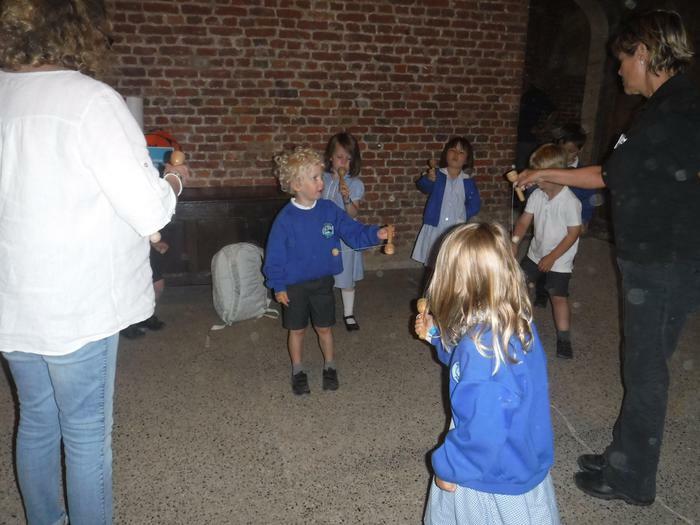 First we enjoyed exploring the church using our I spy trail. 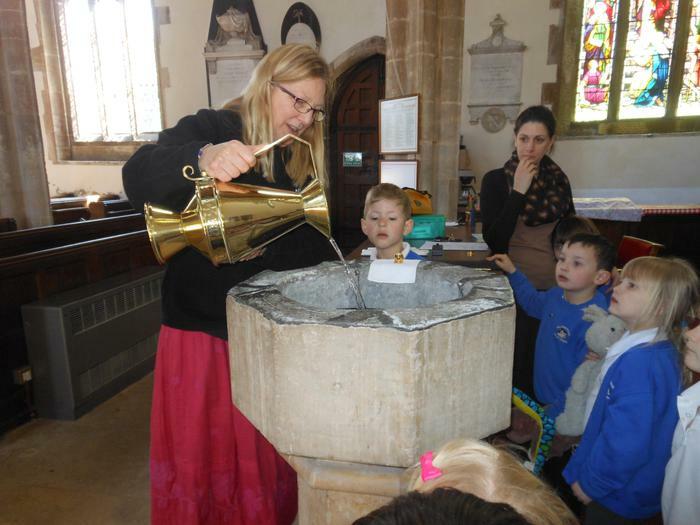 We found to font, pulpit, choir stalls, organ, stained glass windows and many crosses too. 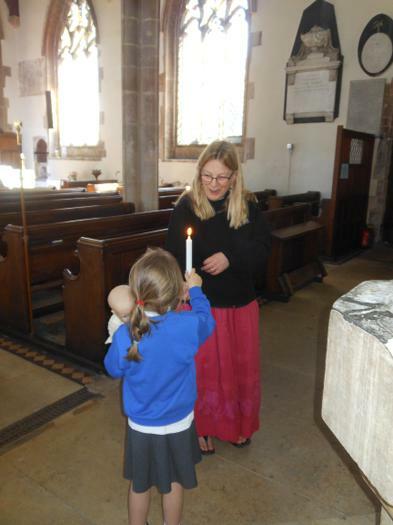 Then we took part in a role play Baptism, Rev Anna individually baptised our favourite teddies and presented Constanza with the baptism candle. 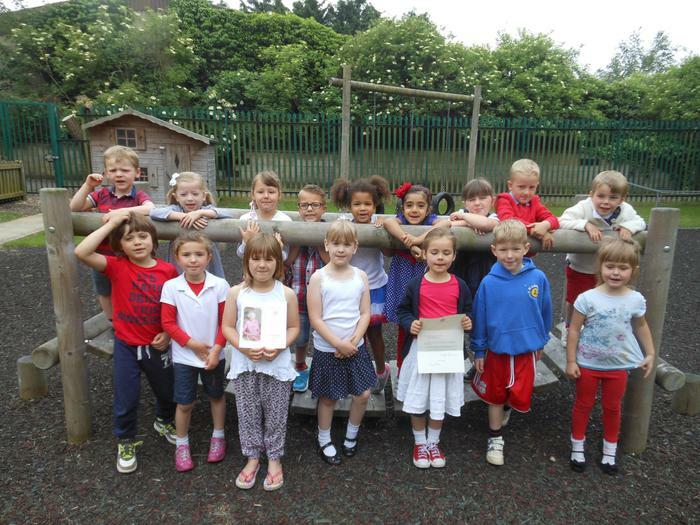 When we returned to school, we were presented with the Baptism certificates for our teddies. 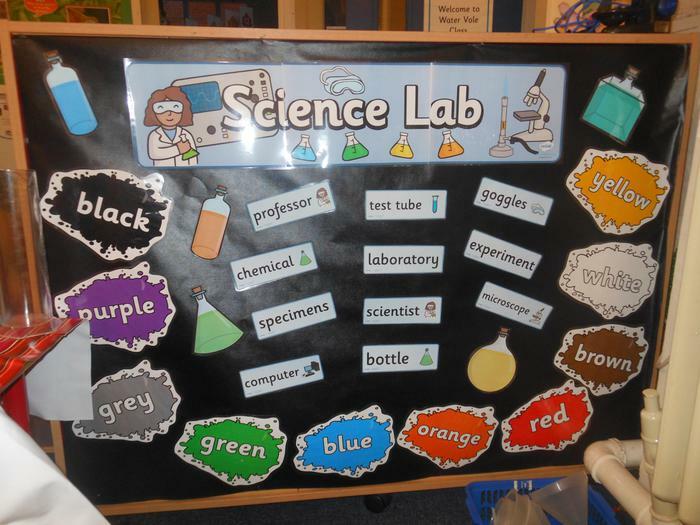 What would our world be like if we took away all the colour? 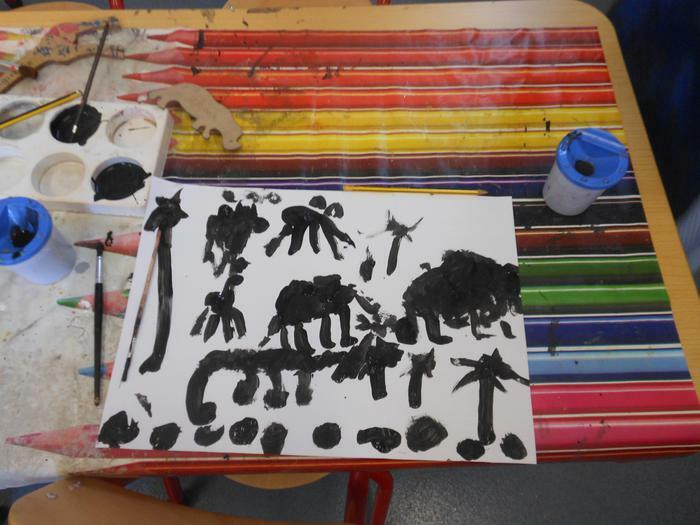 How would we feel if planet Earth was black and white? 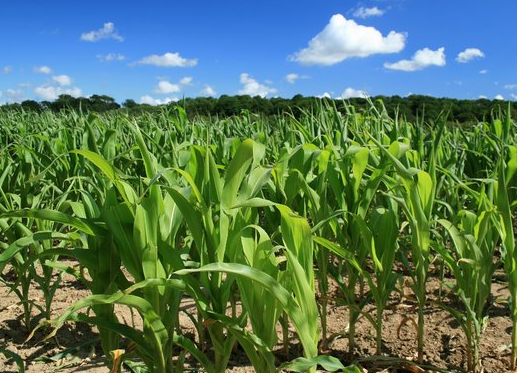 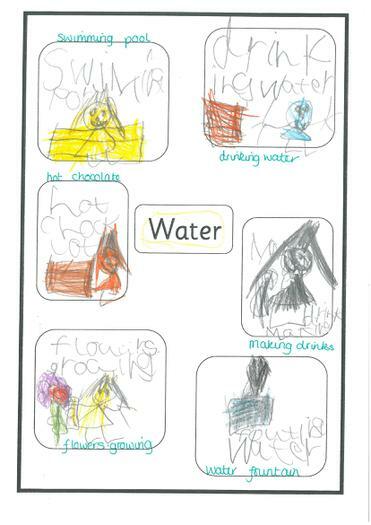 On Tuesday, we thought about water and how we need water to fuel our own bodies, also to grown food, generate power and run all our industries. 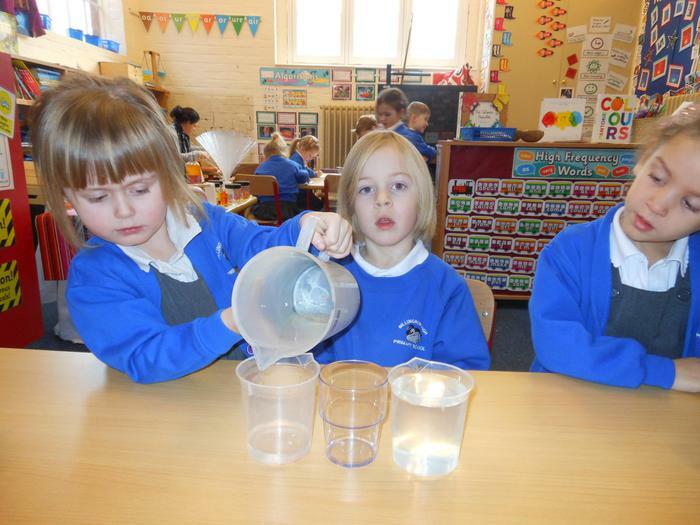 We know we should drink 6-8 glasses of water everyday. 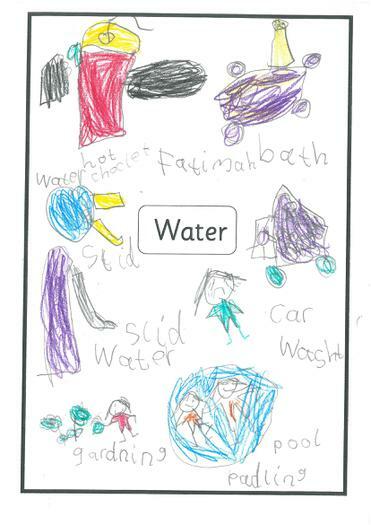 We looked at photos of people who do not have clean, safe water. 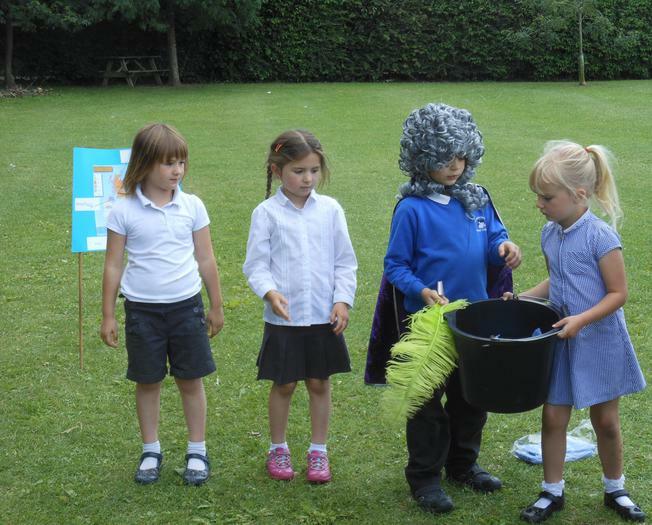 Women often carry containers of water on their head. 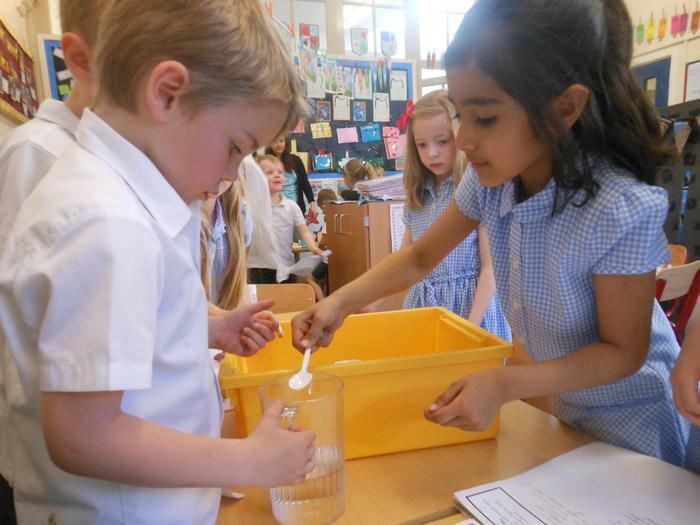 We talked about how we use water and how we should save water if we can. 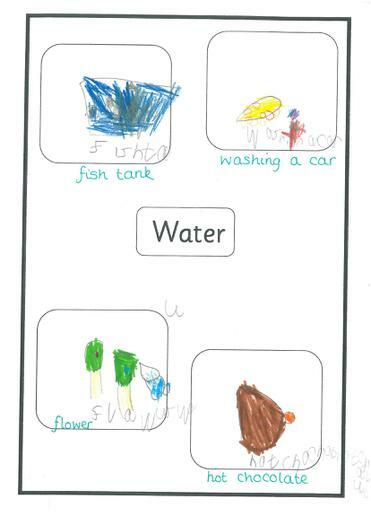 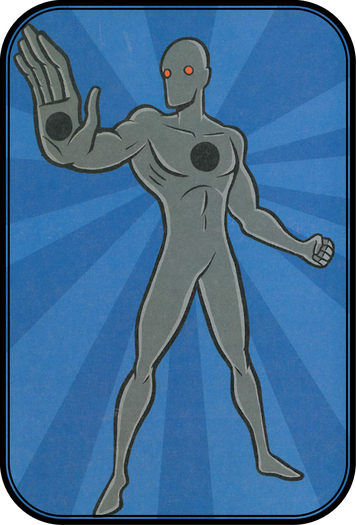 Below are our posters to show how we use water in our everyday lives. 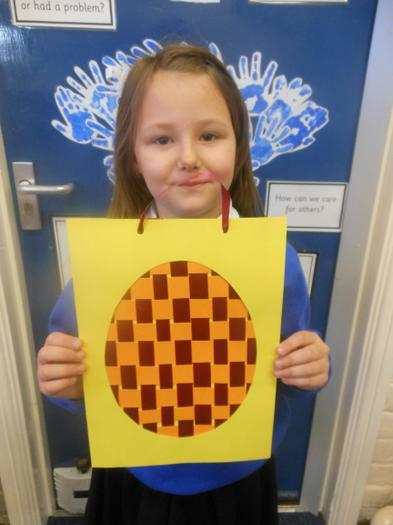 We talked about Easter being a special and important Christian celebration. 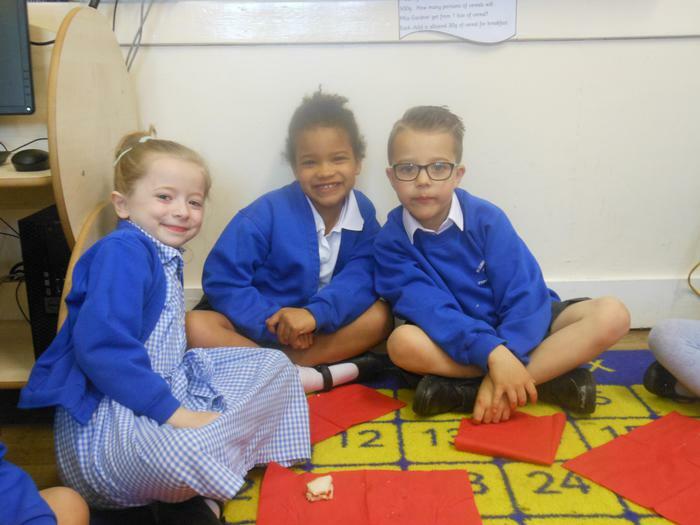 We read the Easter story which talked about Jesus having a special last supper with his friends ‘disciples’ and how Jesus was then put on a wooden cross to die. 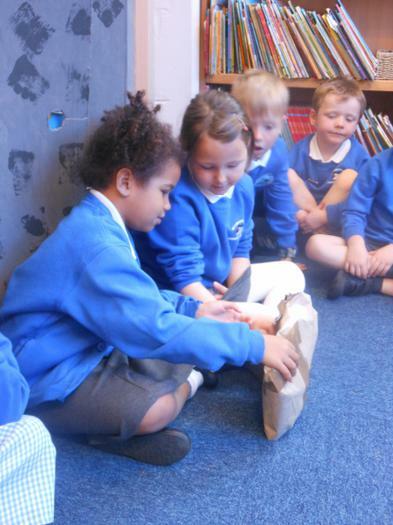 We then discovered the story continued explaining how Jesus’ body was placed in a tomb and a large stone was placed in front. 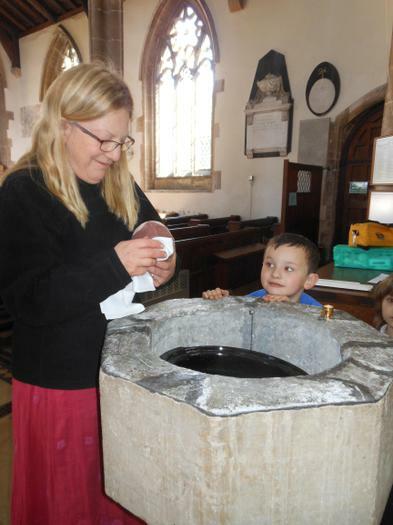 Two days later the stone had gone and Jesus was no longer in the tomb. 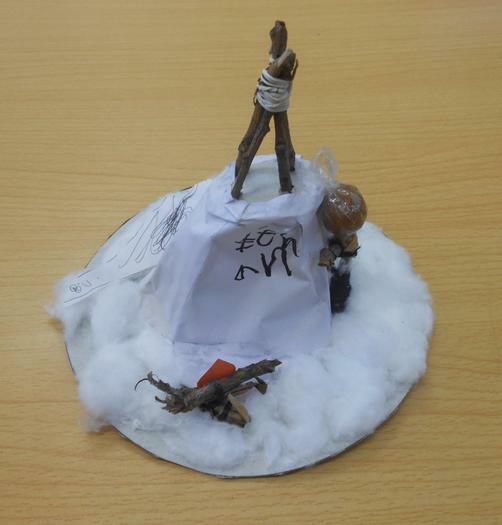 He had risen from the dead. 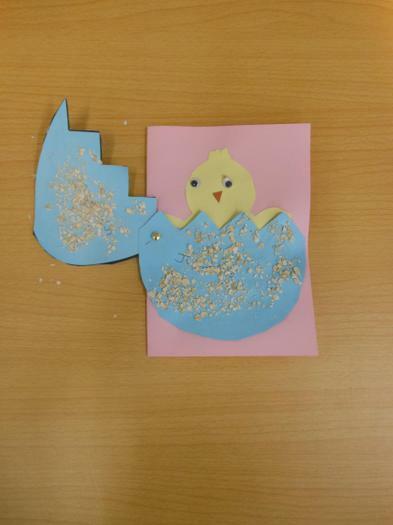 We decided to included eggs within our Easter cards as eggs were always thought to be special because although they do not seem alive, they have life within them especially at springtime when chicks hatch out. 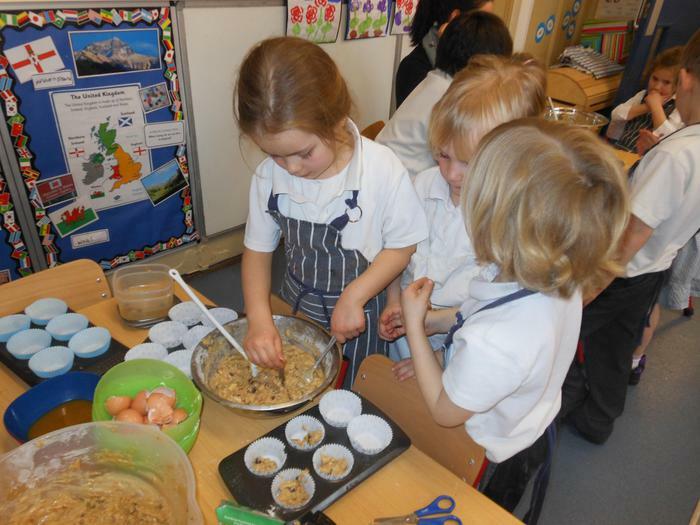 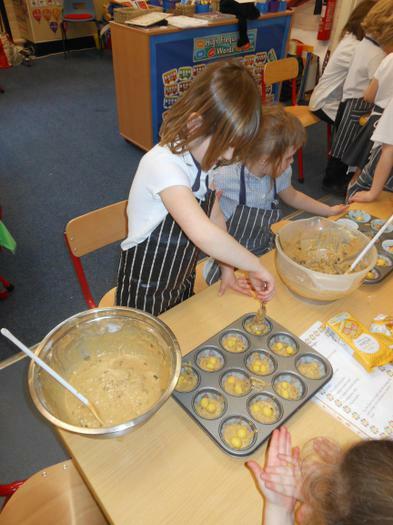 We followed the recipe and instructions to make Easter Simnel muffins. 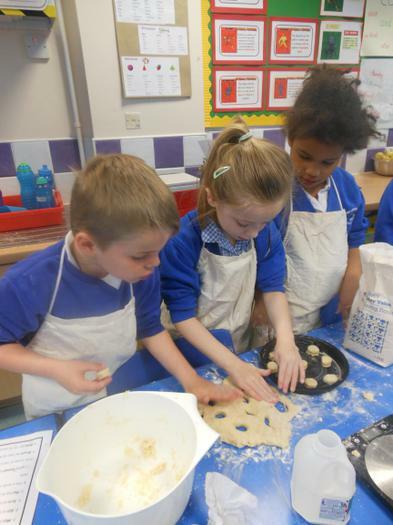 We were developing our skills at taking turns and sharing. 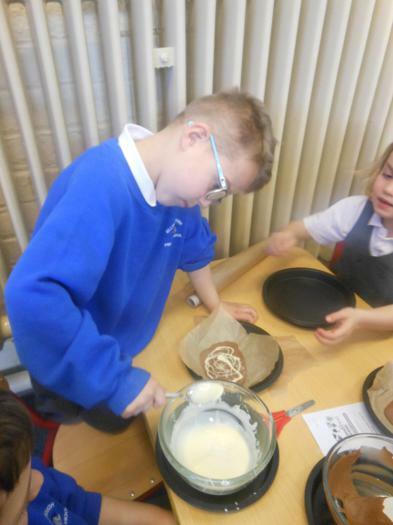 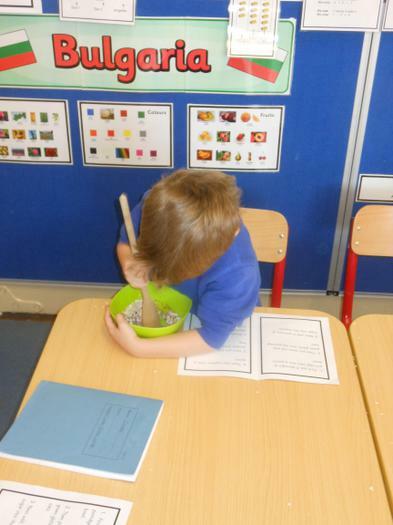 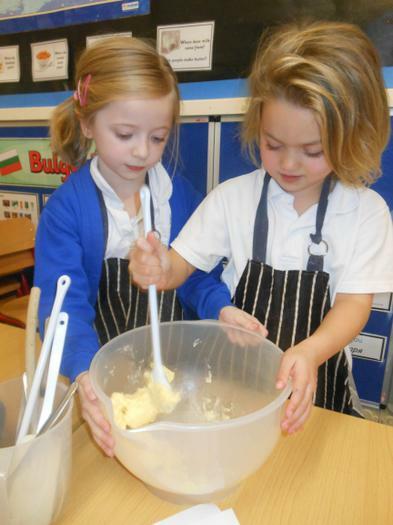 We also learnt how to mix and stir the butter, flour and sugar. 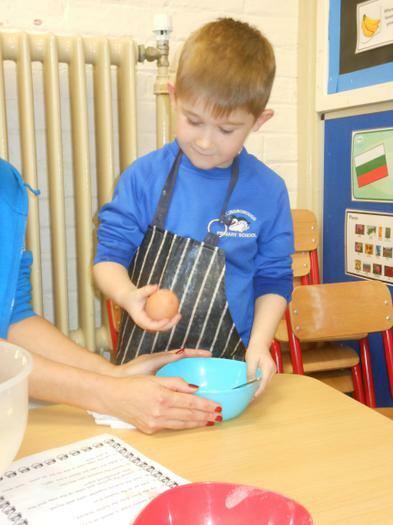 We each cracked an egg and learnt how to beat the egg with a fork. 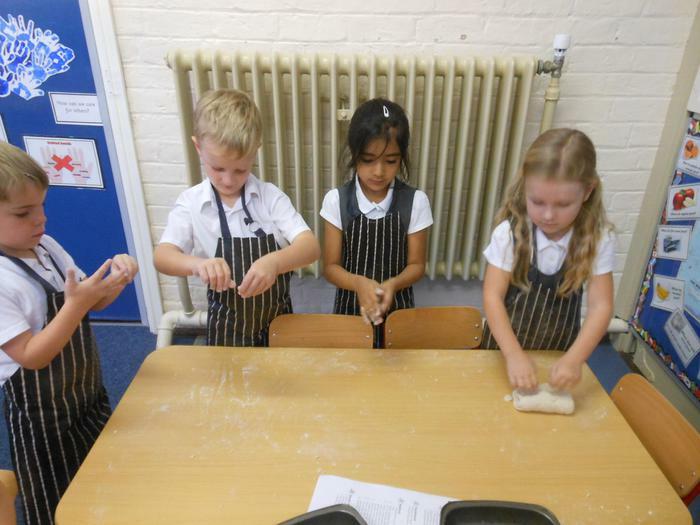 We talked about the different ingredients and then learnt how to roll the marzipan into small balls. 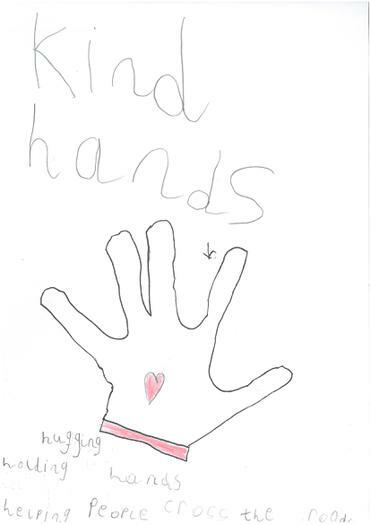 We designed posters to share our ideas about kind hands. 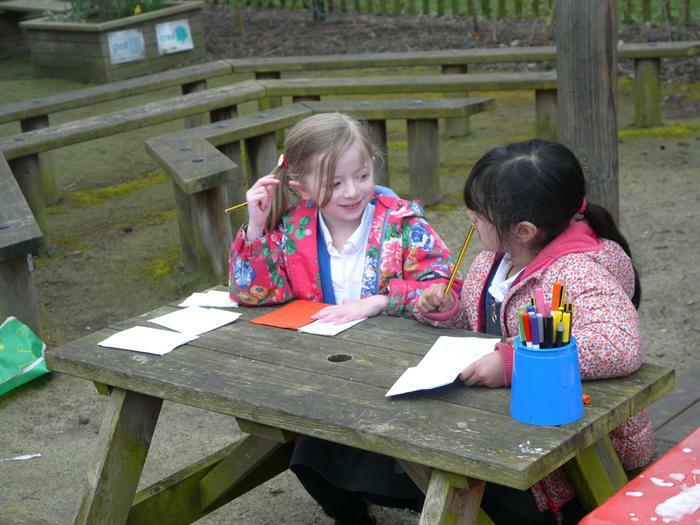 We have enjoyed learning outside with our friends and have been developing our writing skills in many fun ways. 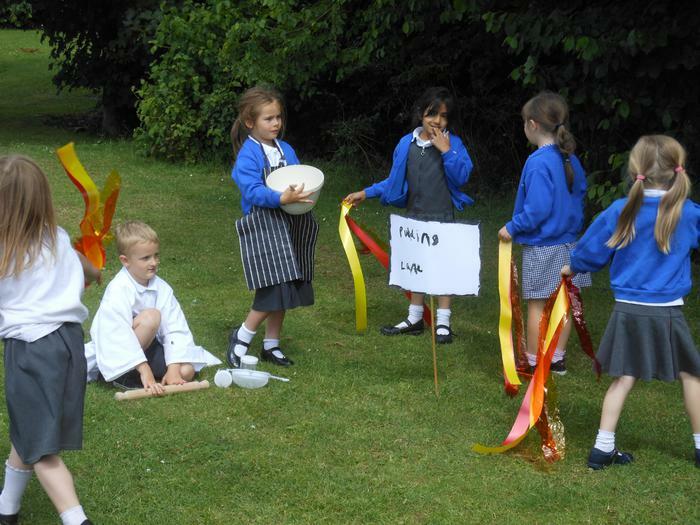 Below are some of our exciting outdoor photos. 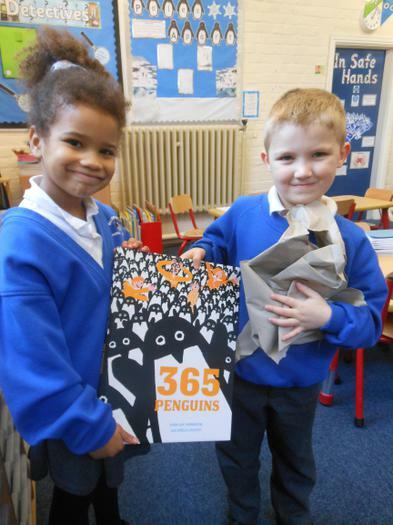 During World Book Day, we sorted our classroom books and made a library by sorting the books into different groups: fiction, non fiction, dictionary books and atlas books. 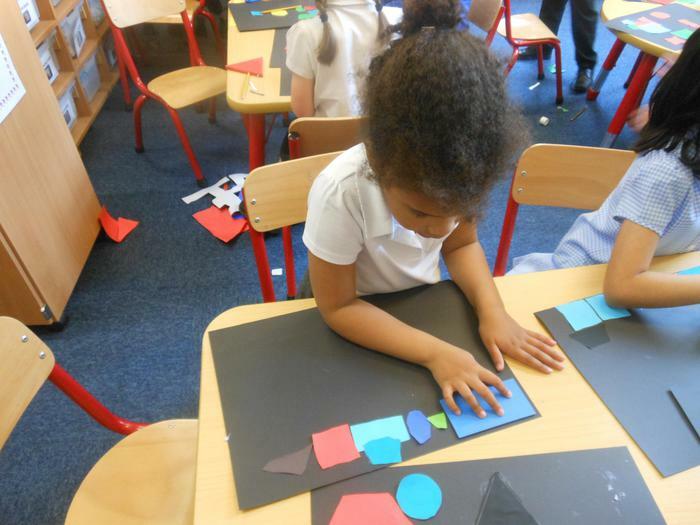 We then stuck small coloured circles onto the spine of the books and learnt how to put the books onto the shelf correctly. 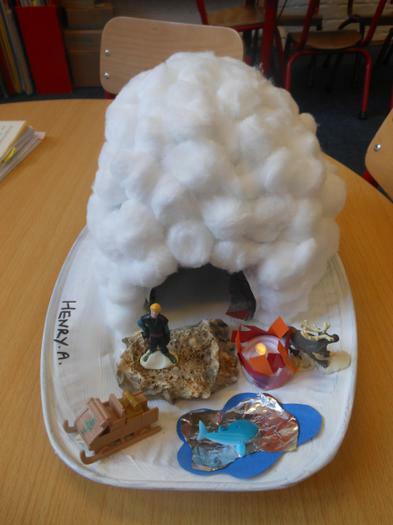 We also created a cosy book corner to explore and enjoy books. 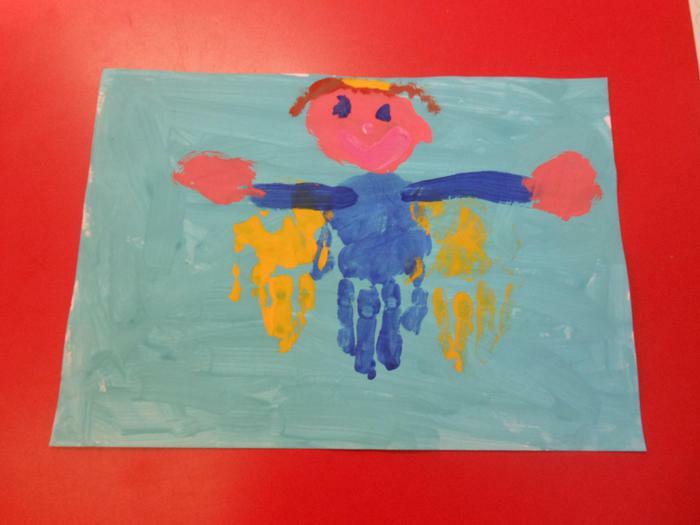 We talked about Mothering Sunday being a time when children pay respect to their mothers. 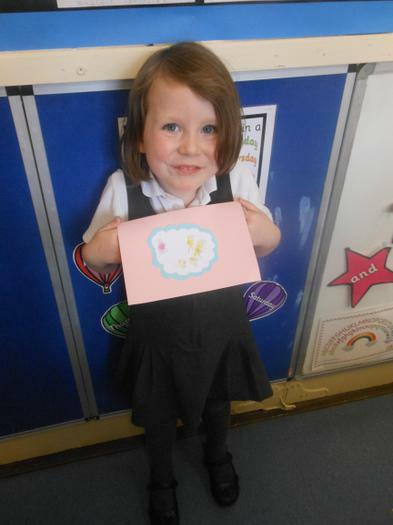 We know that children often give their Mothers a gift and a card. 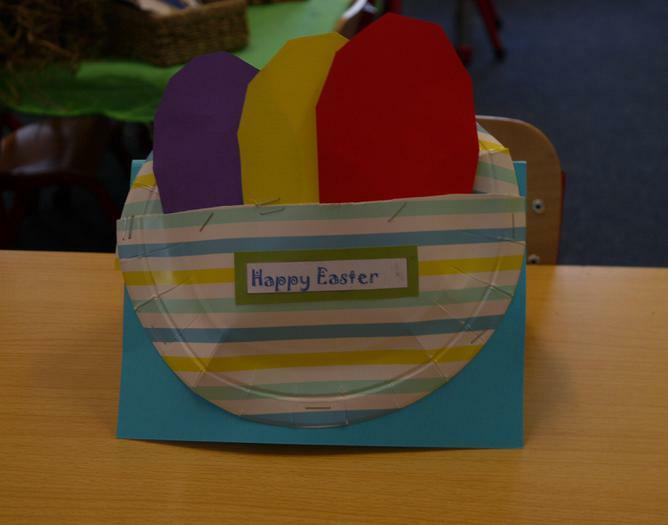 Many churches give the children in the congregation a little bunch of spring flowers to give to their mothers as a thank you for all their care and love throughout the year. 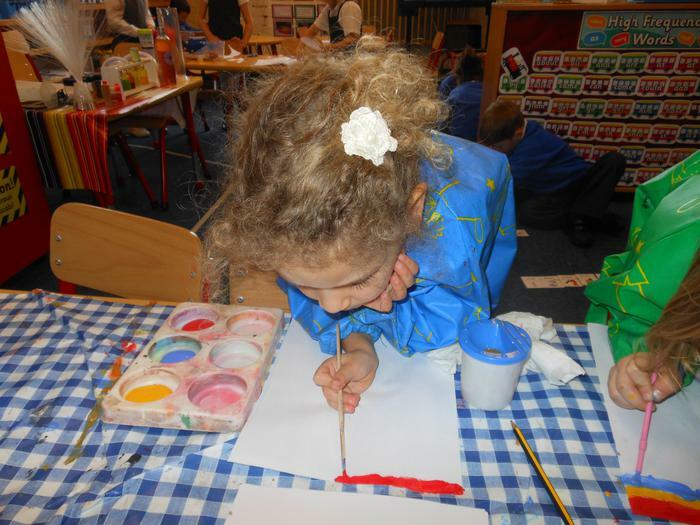 We shared our thoughts and feelings about our mothers and talked about all the important and special things they do for us. 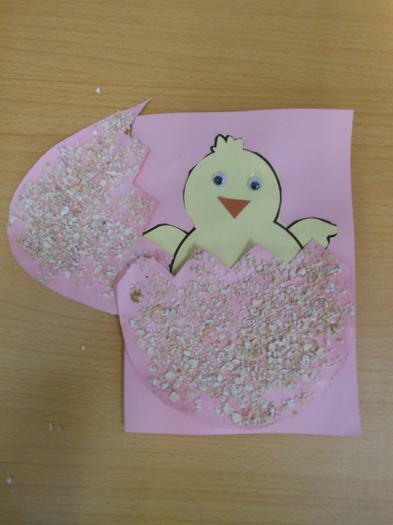 The Reception children have been very busy making Mother's Day cards. 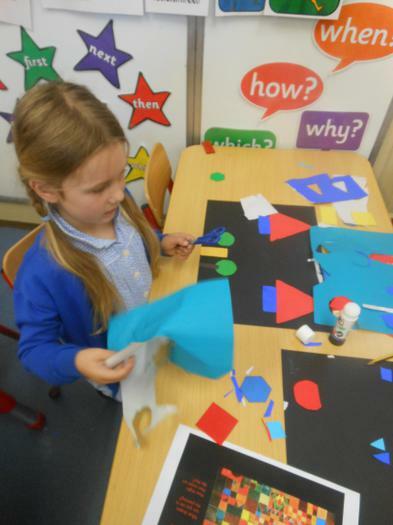 They have been learning about an artist called Wassily Kandinsky who used circles in his creations. 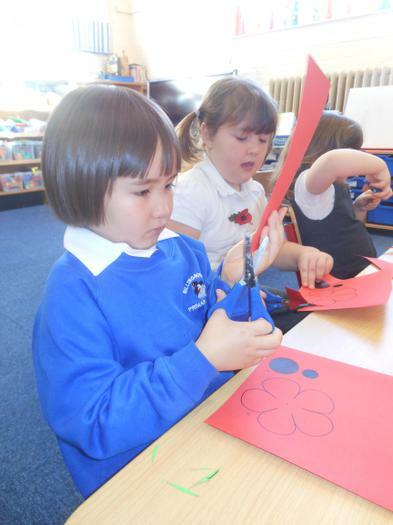 The children cut out their own circles and made beautiful flowers for the cards. 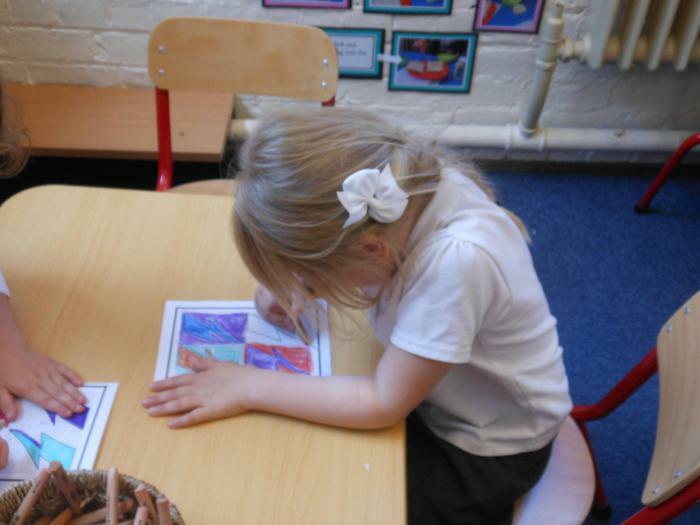 They listened carefully to the sounds in the words when writing their special Mother's Day messages. 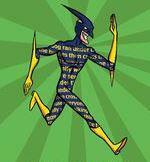 write some Mandarin numbers too. 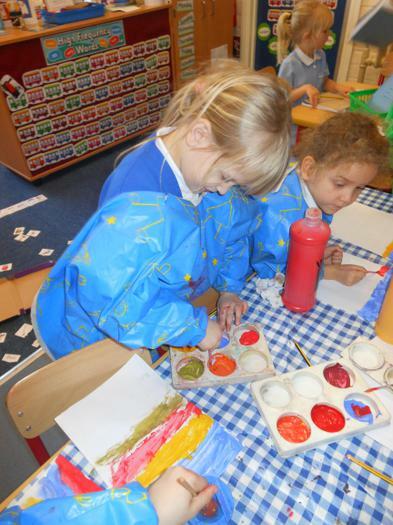 We explored colour mixing using the primary colours. 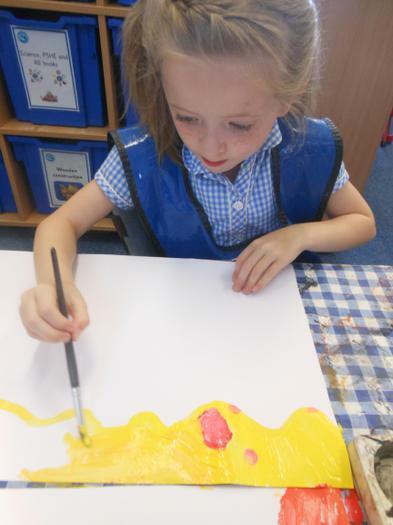 We tried hard to remember to swish, wipe and dab out paintbrush in-between using different colours. 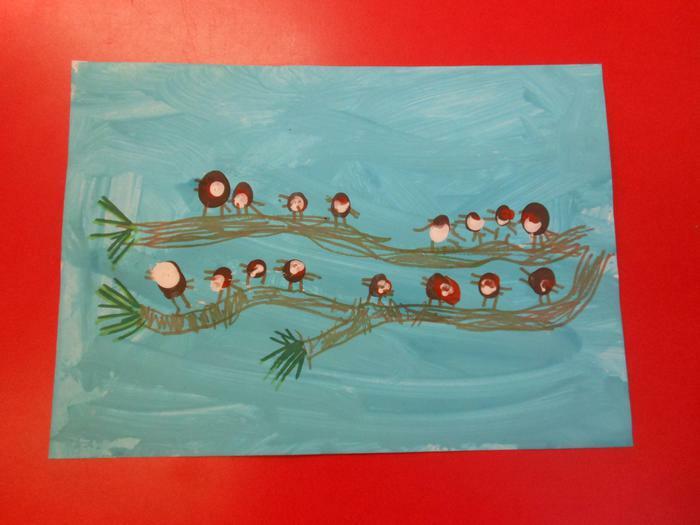 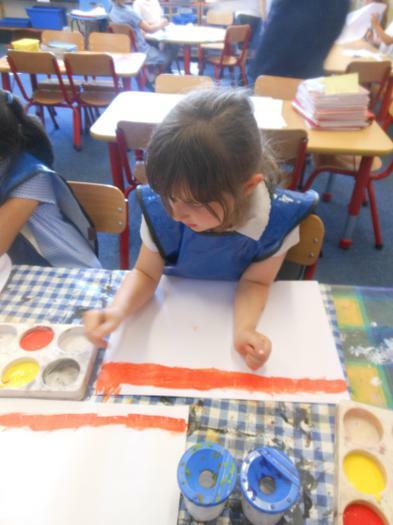 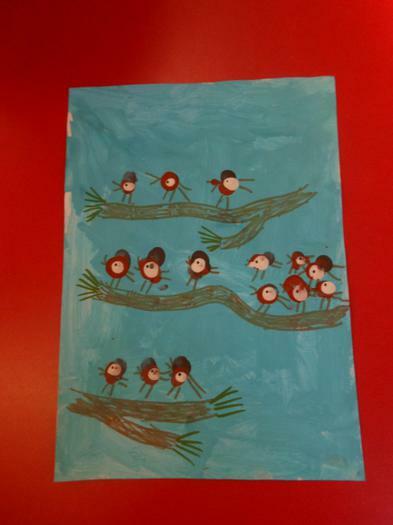 We then painted stripes from the top of our paper to the bottom of our paper. 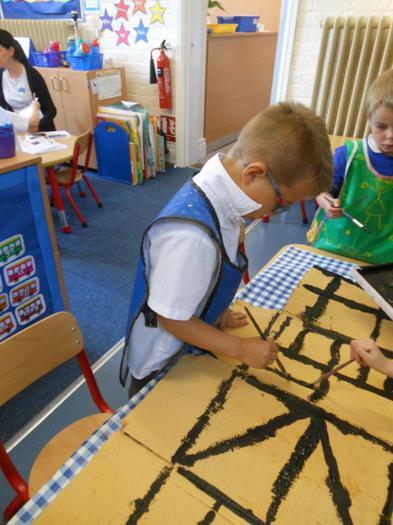 This week, we have been exploring black and white. 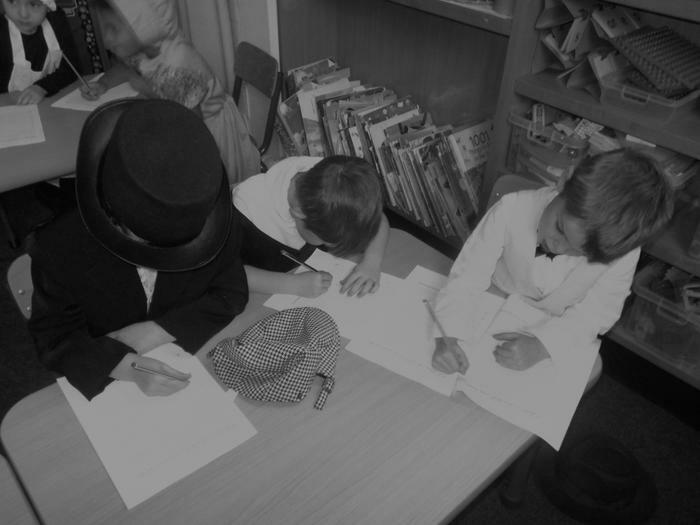 We have shared our thoughts about living in a black and white world. 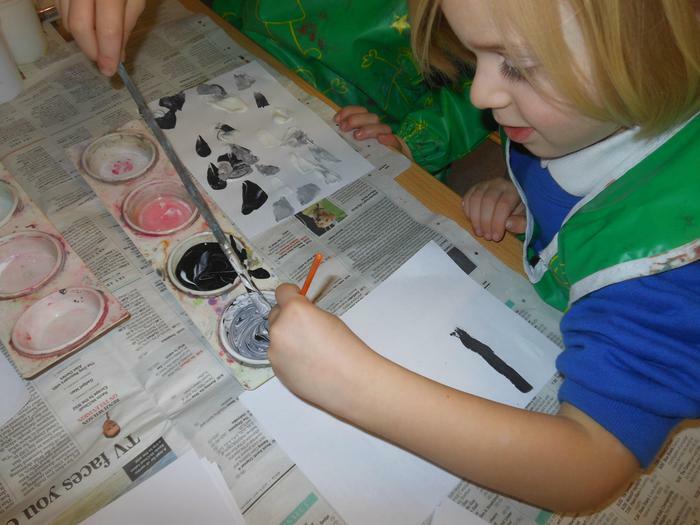 We have explored black and white paint and different shades of grey. 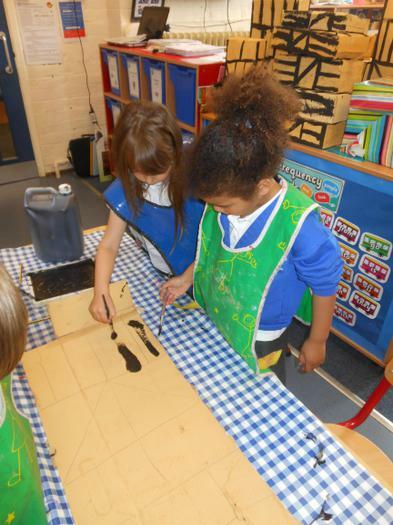 We have only used black and grey pencil crayons and felt tips, as well as only black, white and grey paper too. 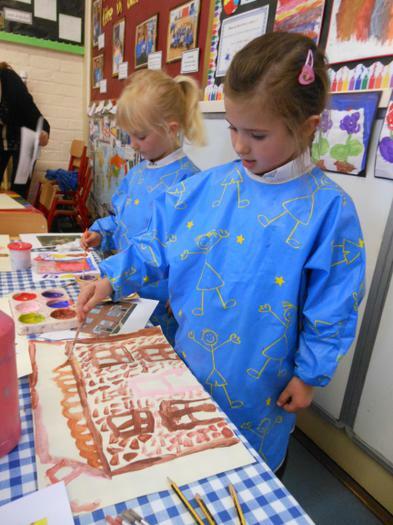 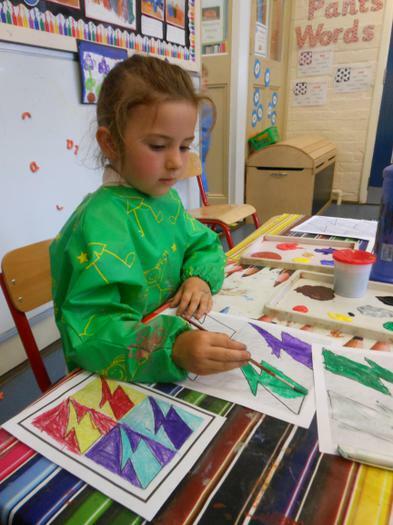 learn about artists such as Piet Mondrian, Paul Klee and Wassily Kandinsky. 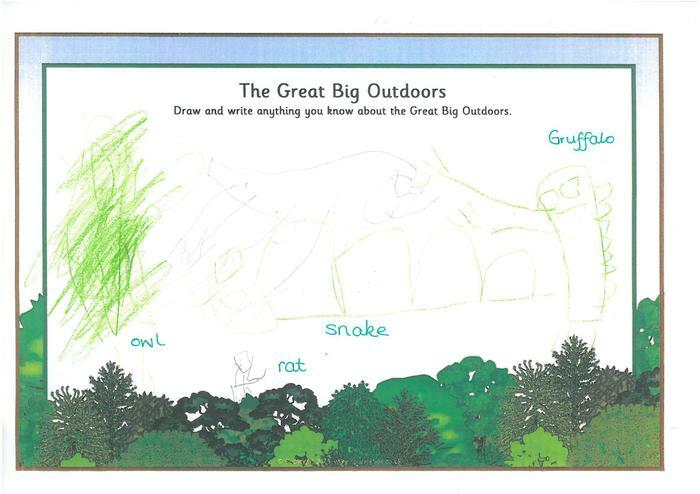 including whether they are natural or man-made. 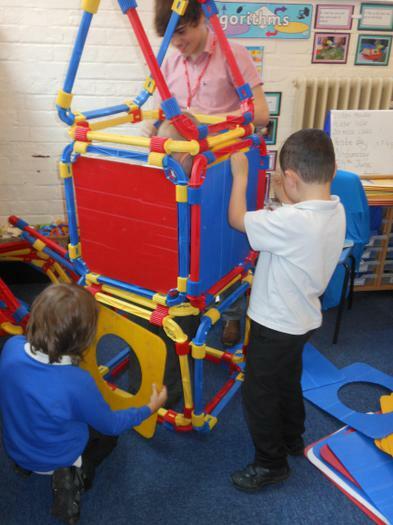 building massive constructions, weaving and mark making too. 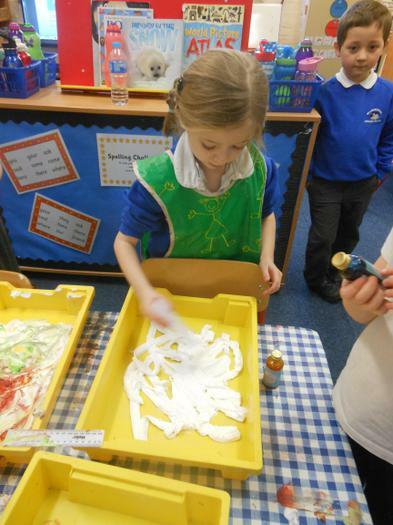 We have been writing numbers as well as making a role play fish and chip shop. 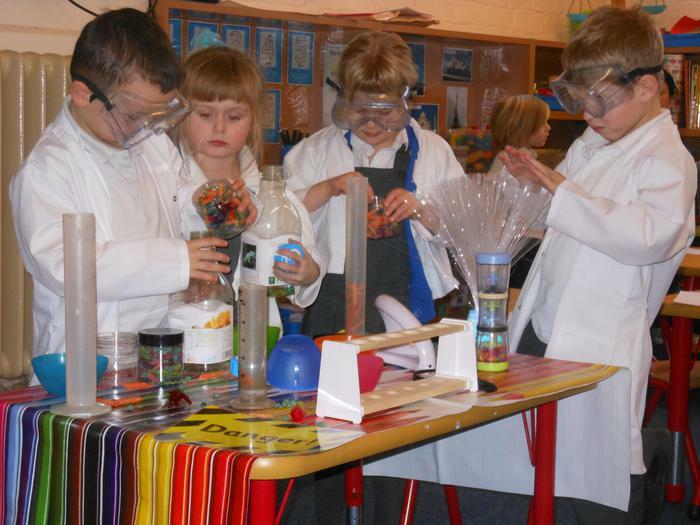 the white lab coats and goggles! 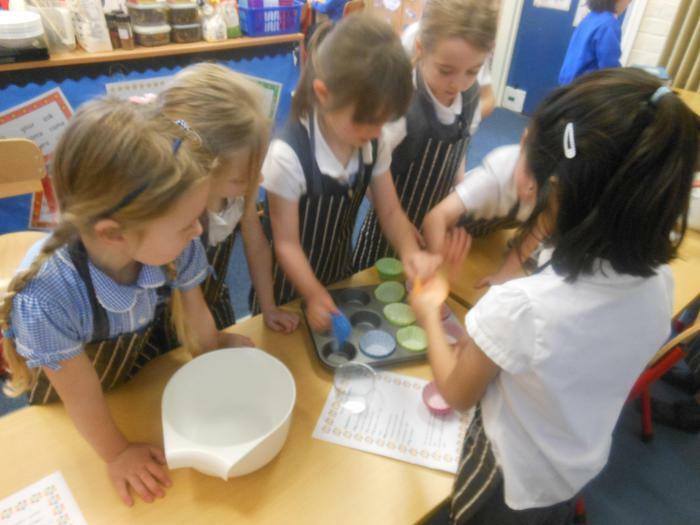 We have been pouring the coloured pasta into the measuring cylinders and creating our own secret ingredients. 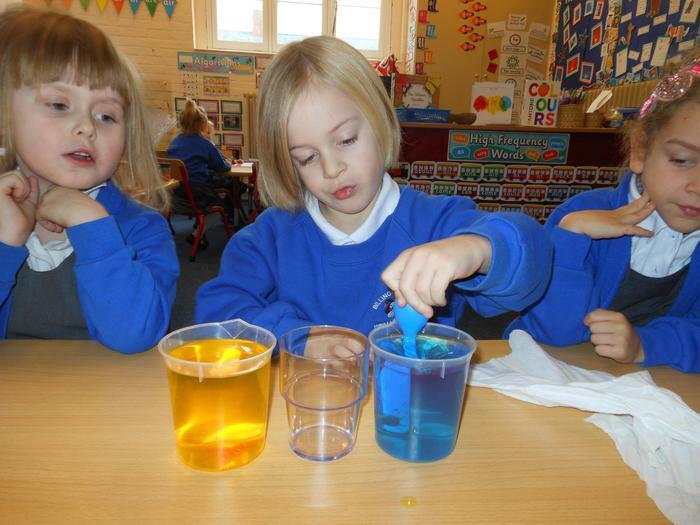 and will find out what happens when we put oil and water together. 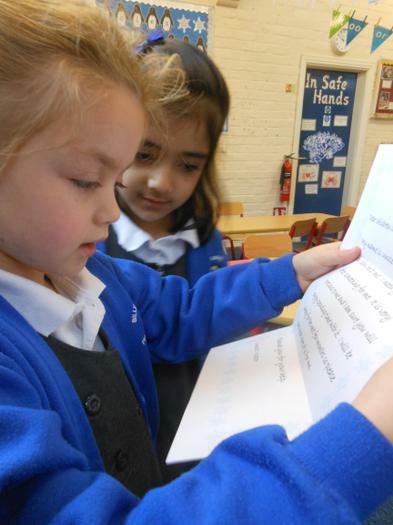 We will question, hypothesise, observe, share and conclude. 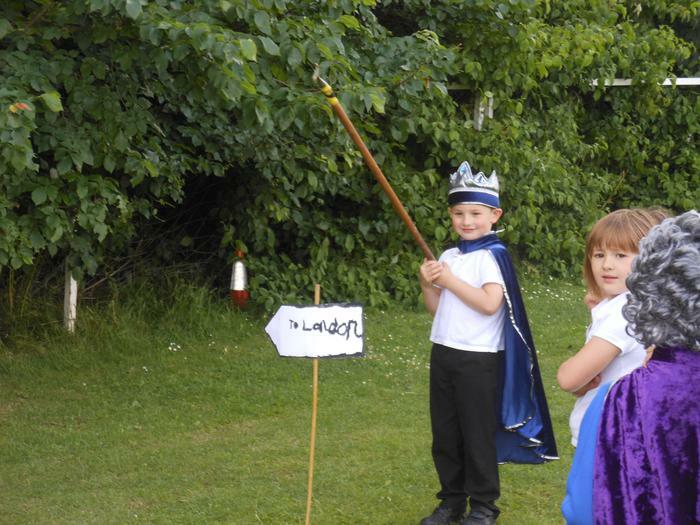 King and Queen of Rainbow Town. 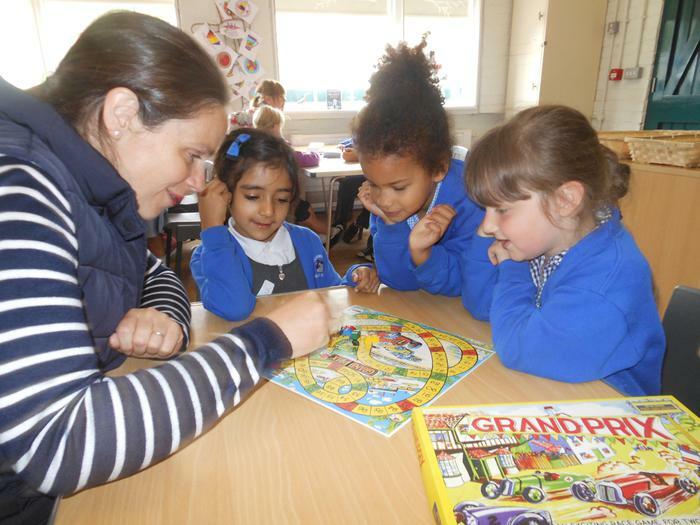 This term we will play and work with our new friends, we will enjoy learning together and try our best. 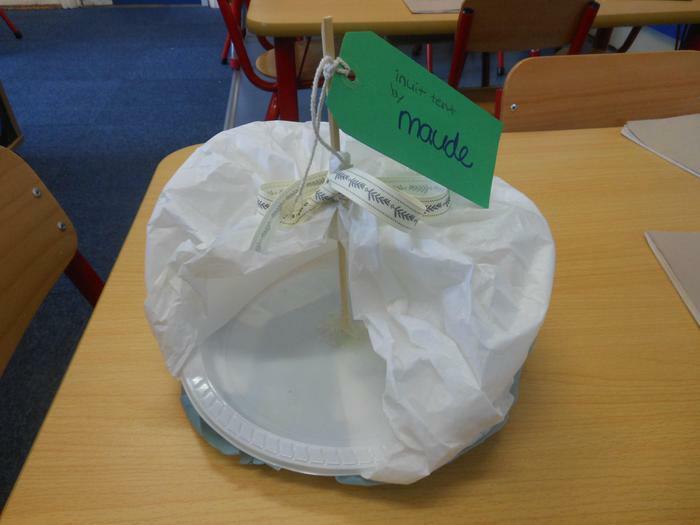 Most importantly we will try to care for each member of our new Water Vole class. 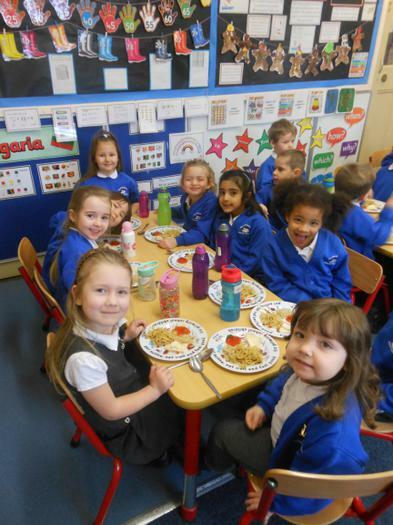 Our Class Teacher is Mrs McCormack. 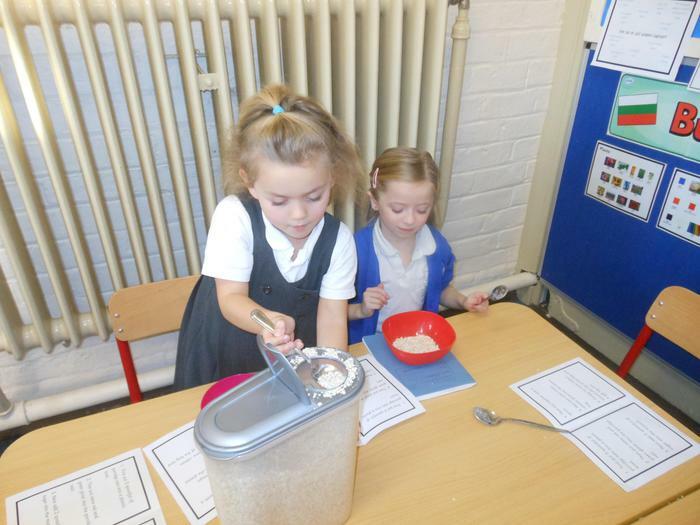 Mrs Manning and Mrs Stamp also work within our class too. 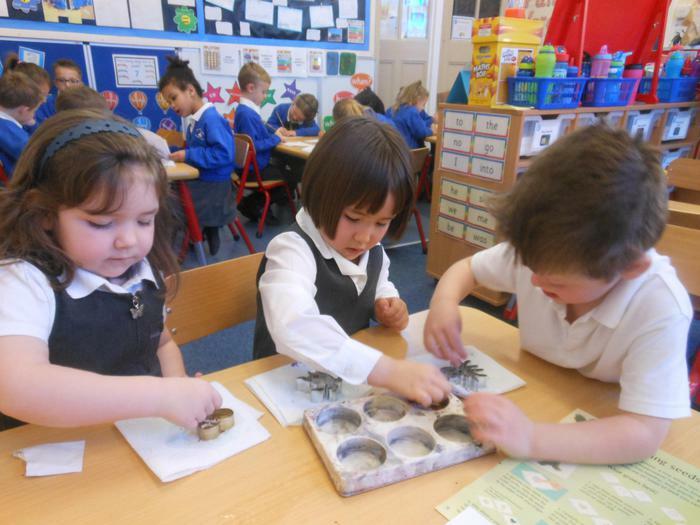 Together the grown ups will support us and help to make our learning fun. 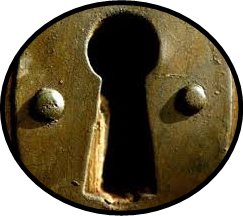 Something very exciting is going to happen next week. 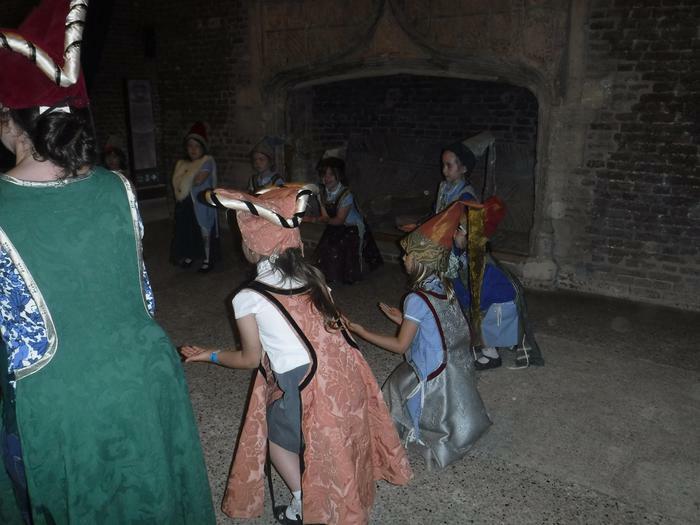 Our beautiful singing can be heard coming from the classroom and the school hall, and we have been busy learning our lines too. 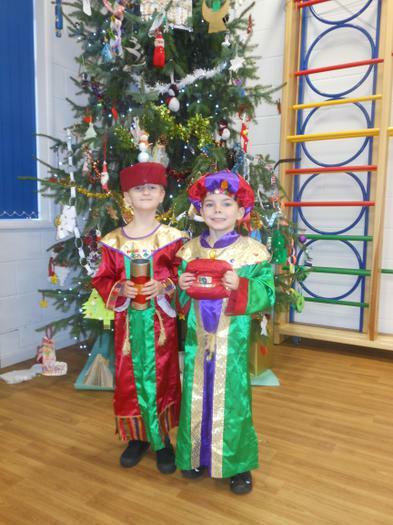 Watch this space next week, when we will share some photos from our afternoon and evening performances as well as some quotes from the children and parents. 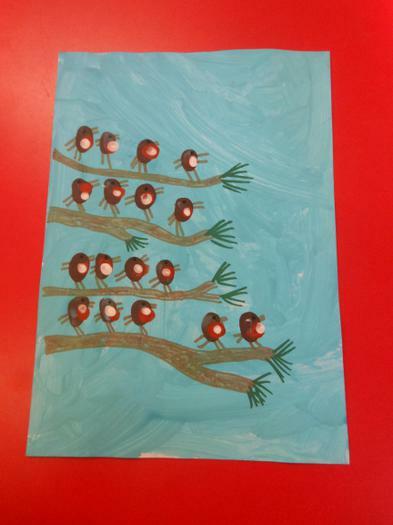 Our Remembrance Day poppy artwork. 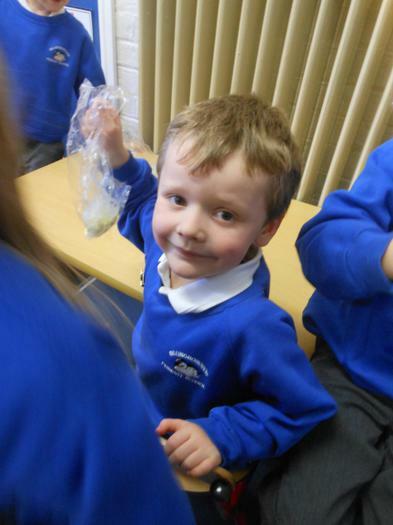 In Science, we grew some cress. 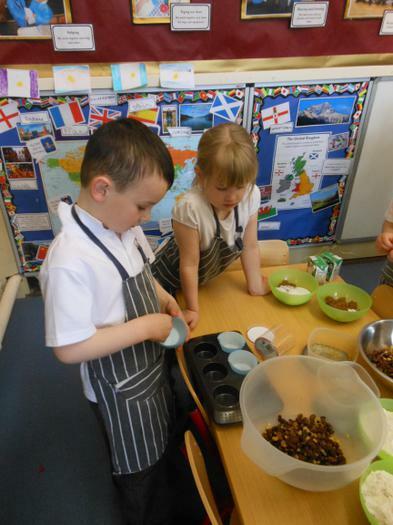 We then gave instructions how to make sandwiches. 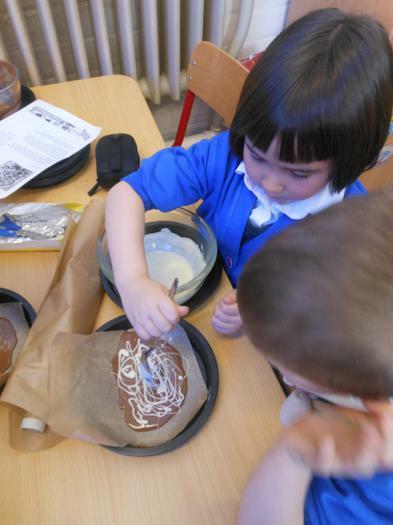 Our instructions had to be very precise. 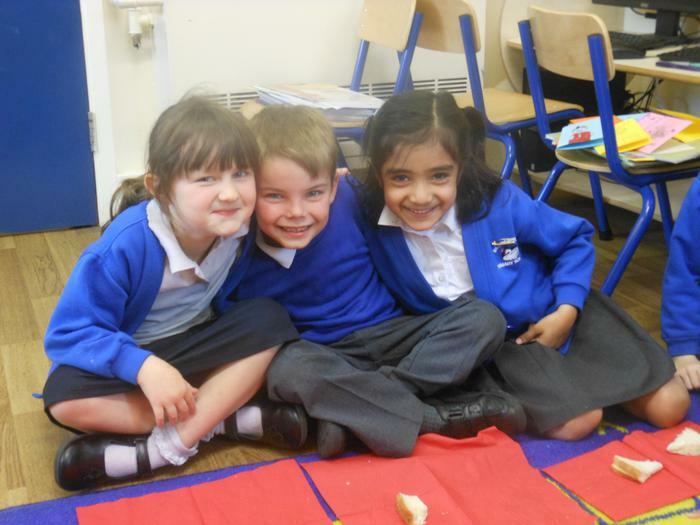 We were all very excited when our new tables and chairs were delivered to school. 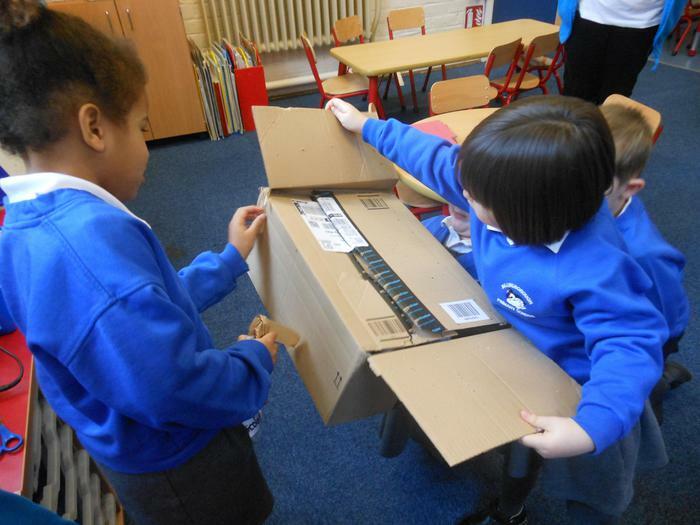 After reorganising our classroom furniture we had lots of fun in the 13 large boxes. 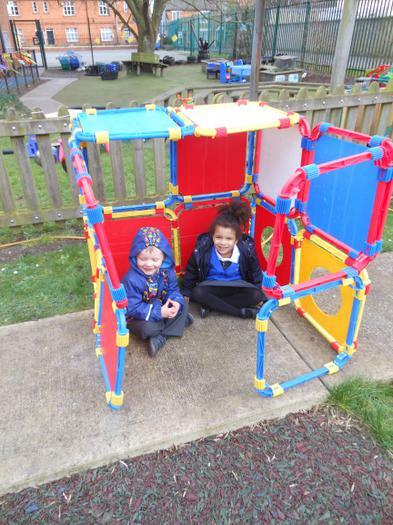 We worked together to take the boxes outside into our trim trail area and then let the fun begin! 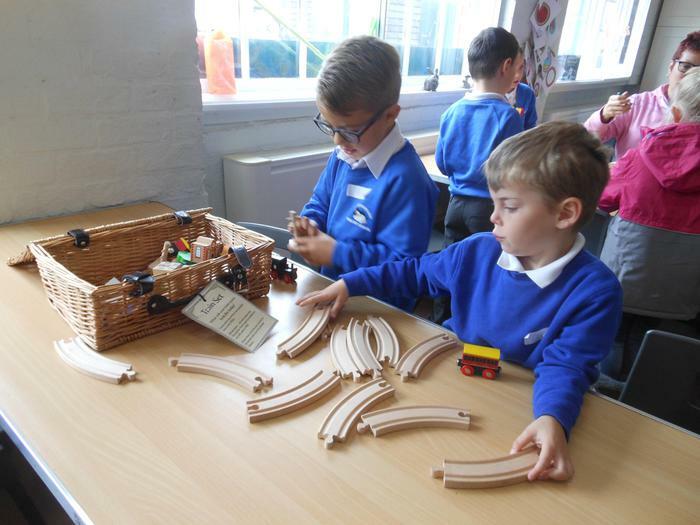 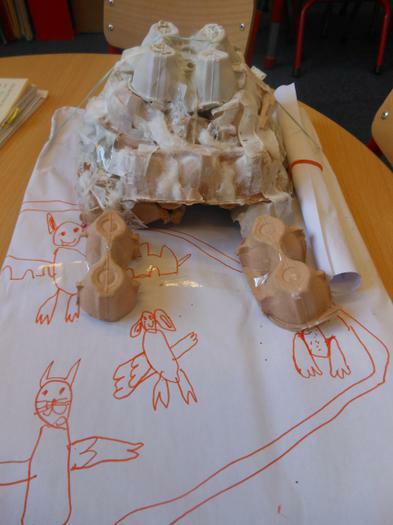 Some of us used the boxes to make carriages and went on an exciting train journey, whilst some of us joined in role playing the story of The Three Little Pigs. 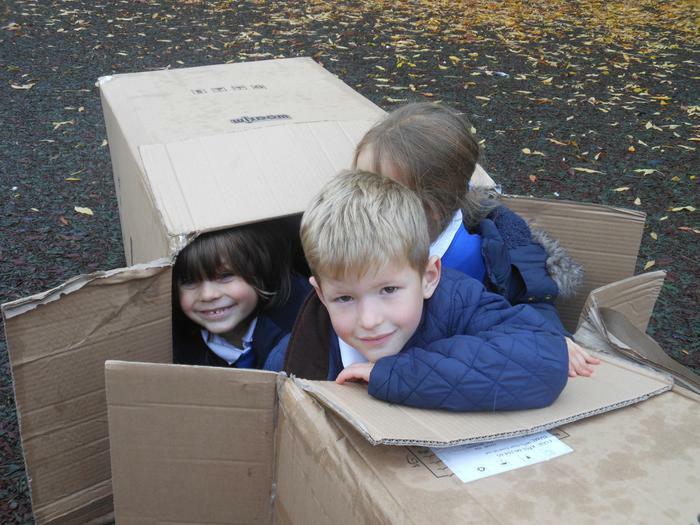 We made one into a Jack in the box, whilst some of us enjoyed laying in the boxes talking to our friends. 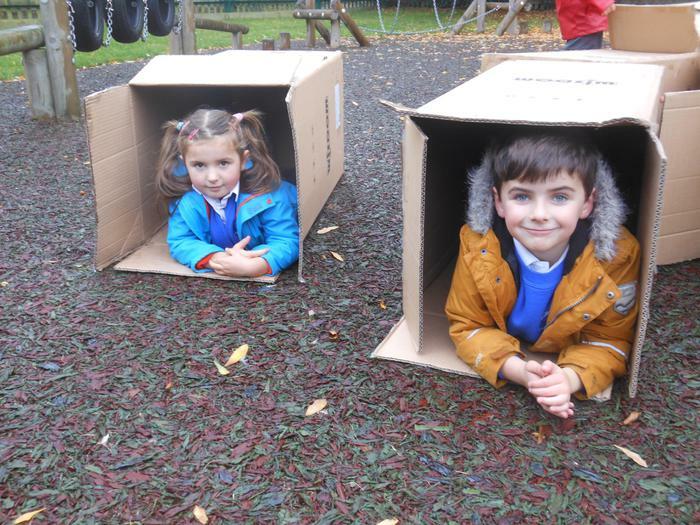 We thoroughly enjoyed the World of Boxes and then the weather changed and it started to rain. 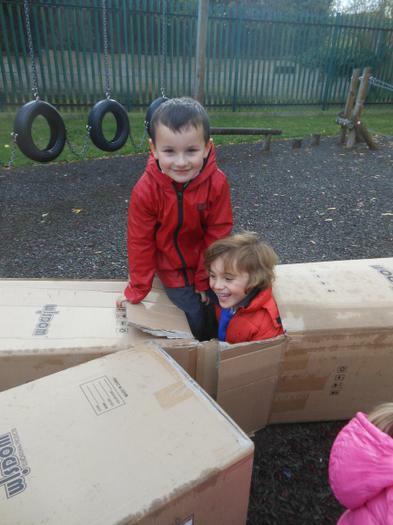 The rain was good fun for a little while until our boxes became quite soggy but we still had smiles on our faces. 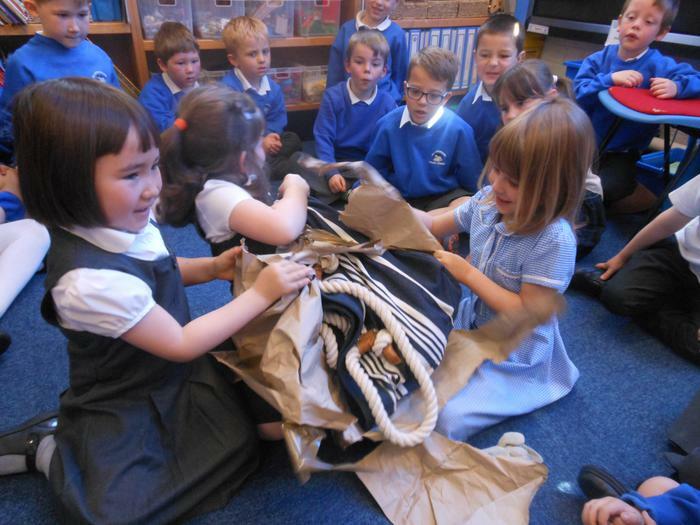 Mrs Khan showed us some beautiful special clothes. 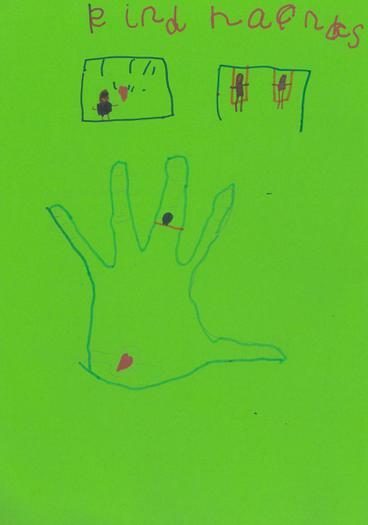 There was a mosque on the large prayer mat. 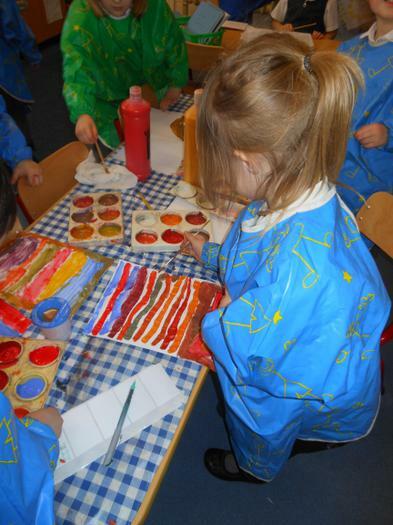 The special clothes were brightly coloured. 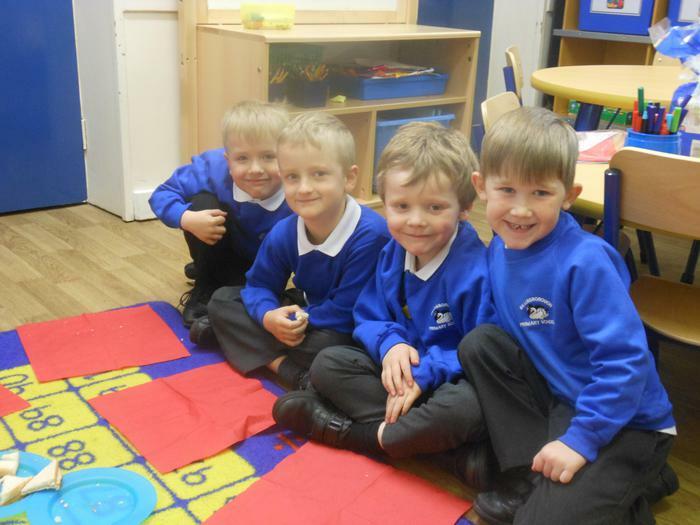 The prayer mat was very soft to touch. 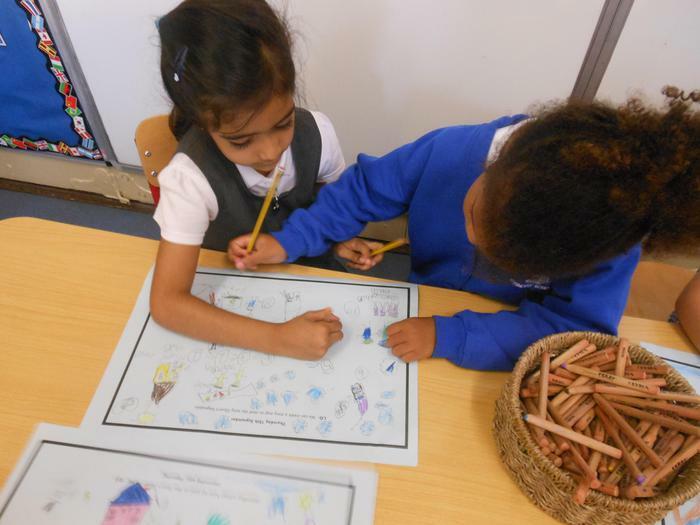 We designed our own prayer mats. 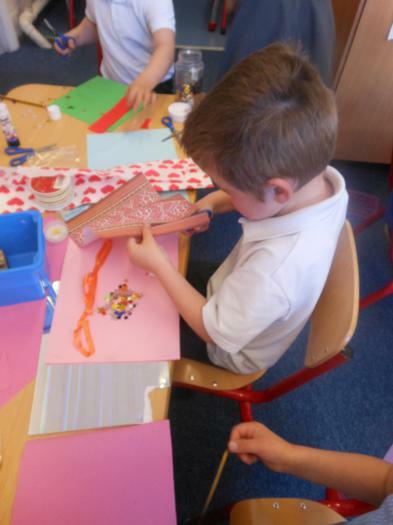 We created our own Mehndi patterns. 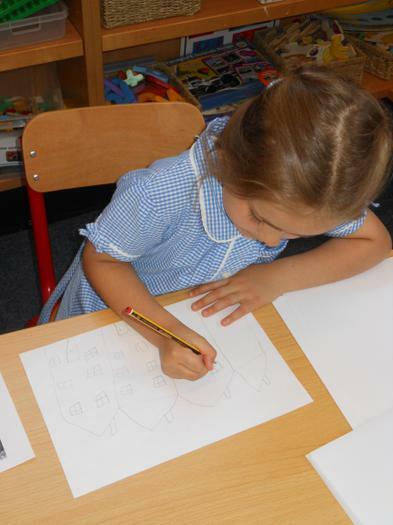 Then, we traced over the pattern using pen. 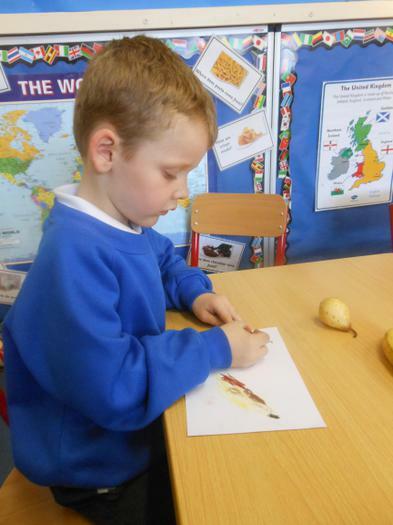 We enjoyed reading Oliver's Vegetables and learning about plants. 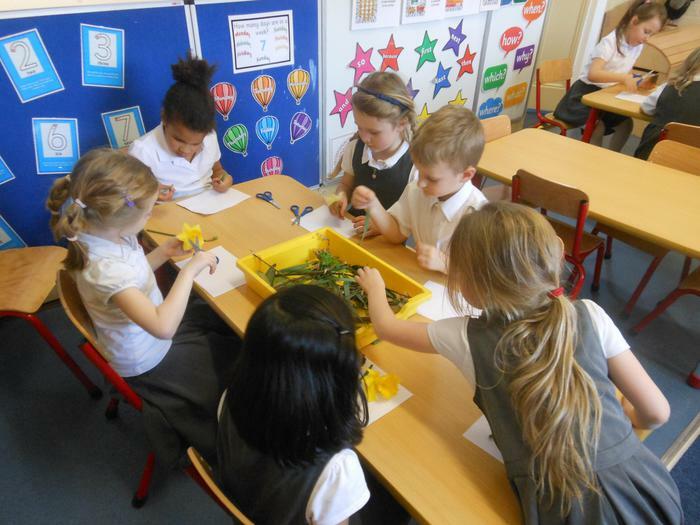 We labelled parts of a plant using a word bank. 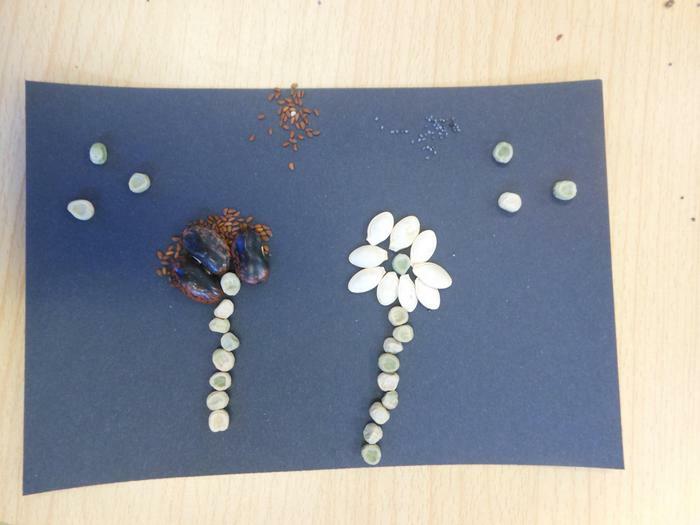 Then we made flowers using different materials. 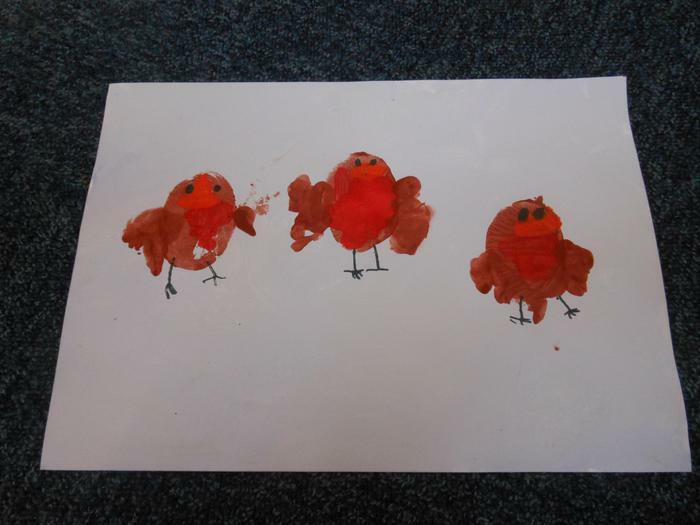 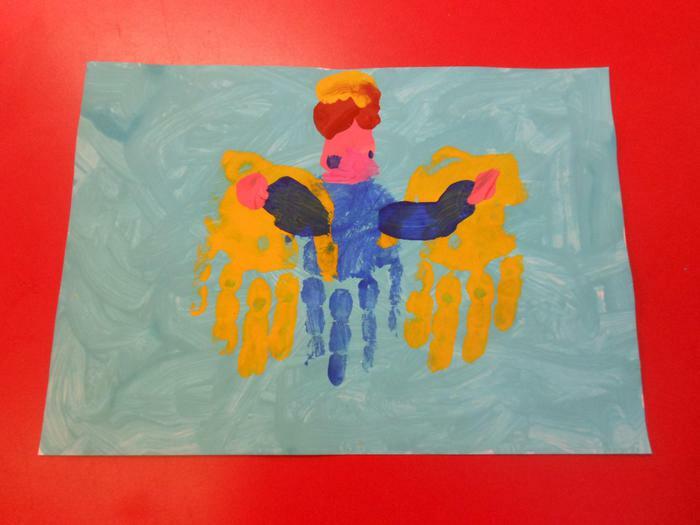 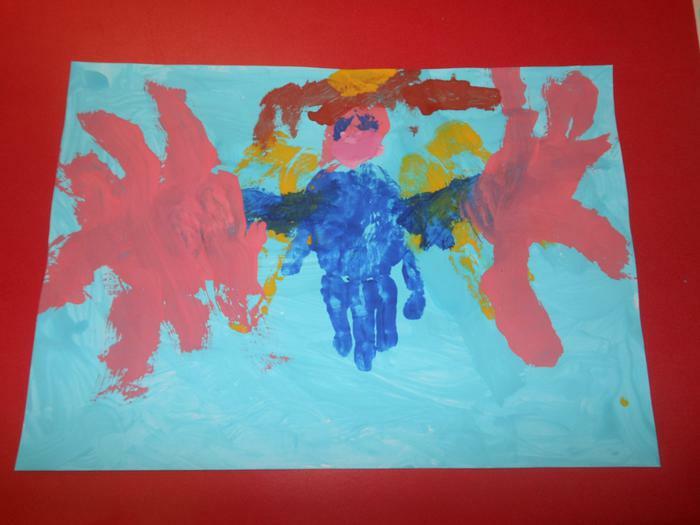 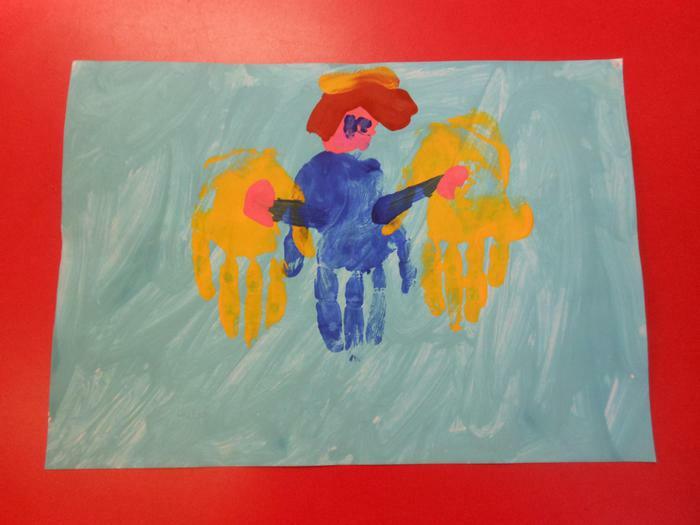 Over the last week, we have been busy using our hands and fingers to create fingerprinted robins and handprinted angels. 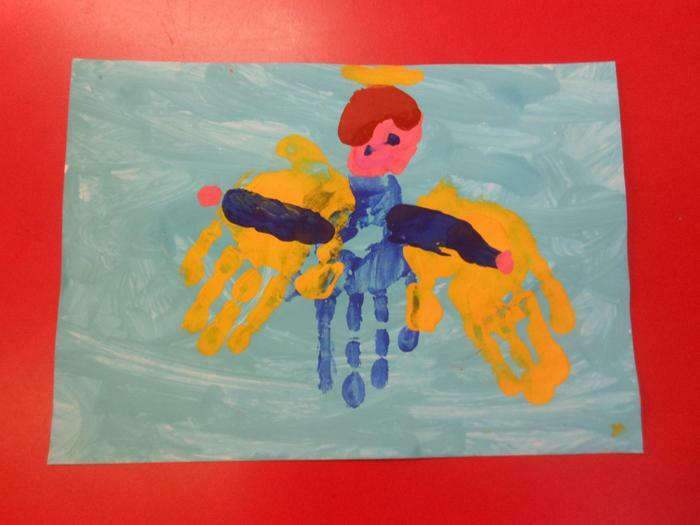 Our designs are so beautiful and individual, hopefully our grown ups will now choose to have our artwork made into Christmas cards, wrapping paper, gift tags and thank you cards. 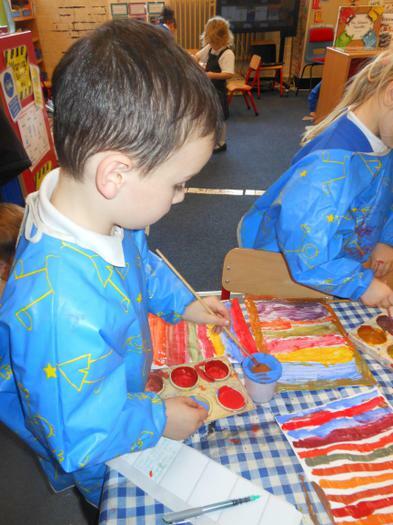 We are very excited and looking forward to seeing our masterpieces in early December and we will also have raised money for our school too. 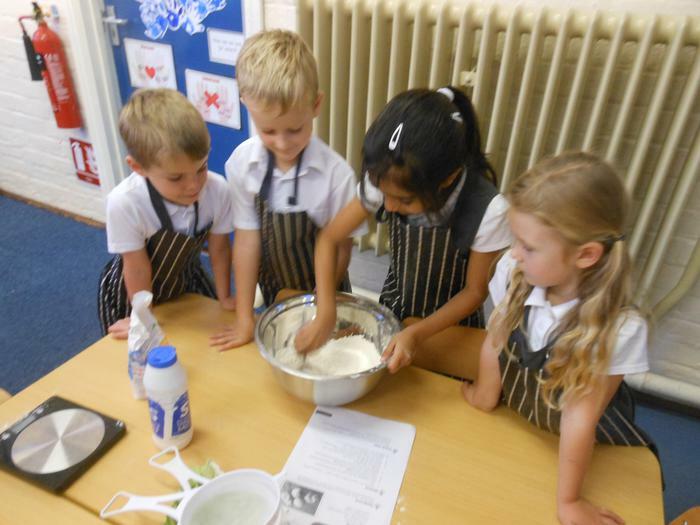 We've had a very busy and successful start to the new term and hope to share our learning and experiences with you as the weeks go by. 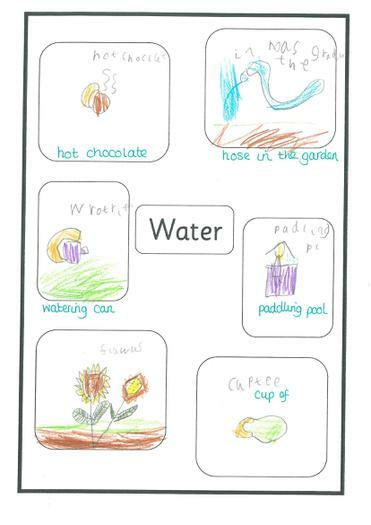 We have been learning about different types of garden and wild flowers. 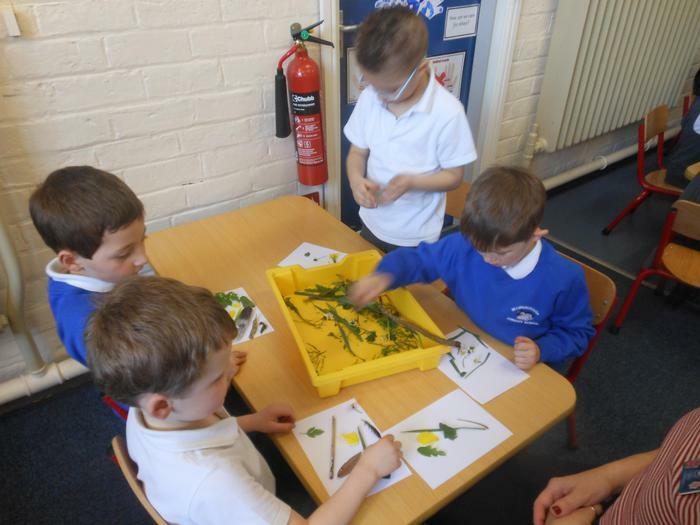 We now know the reasons why we shouldn't pick wild flowers too. 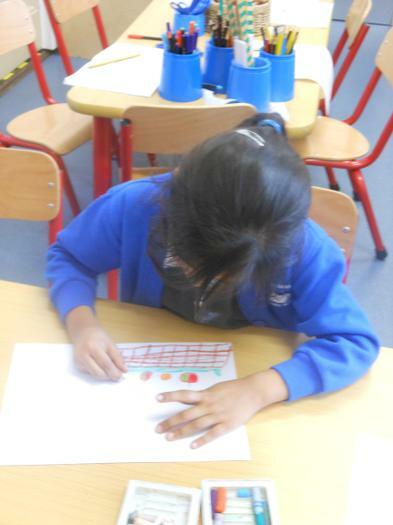 We have written labels, descriptive are enjoying learning larger numbers. 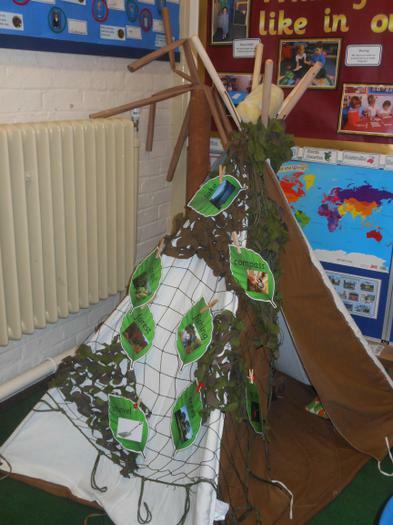 In the corner of our classroom is our evolving Wigwam Base Camp. 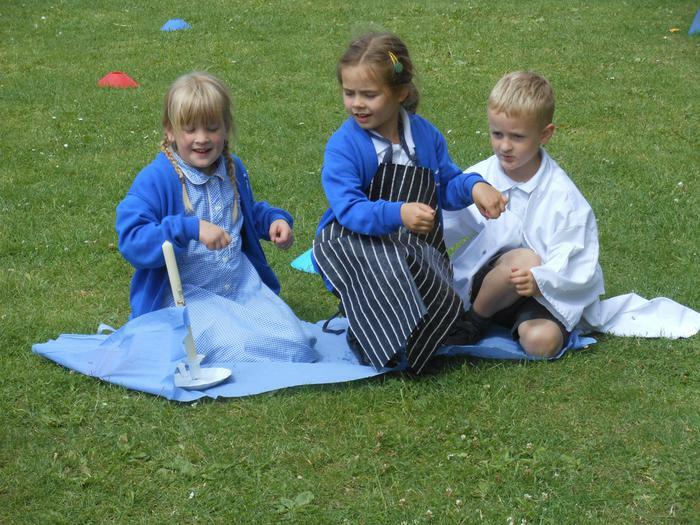 We are enjoying our camping role play experience cooking on our 'log fire' and hope to make our Spaghetti Hoop Stew next week. 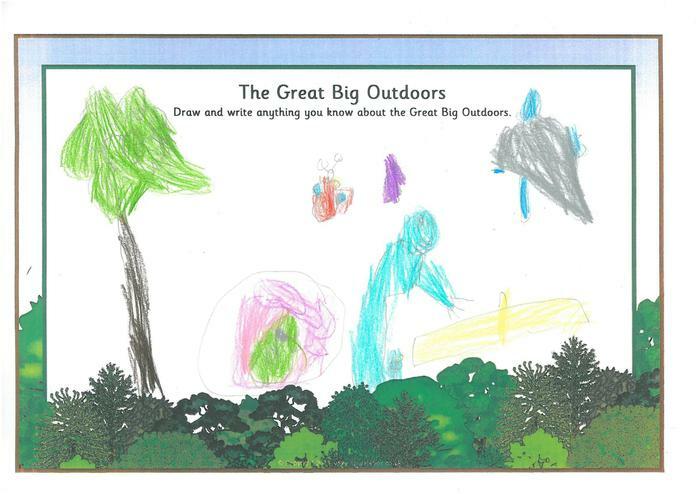 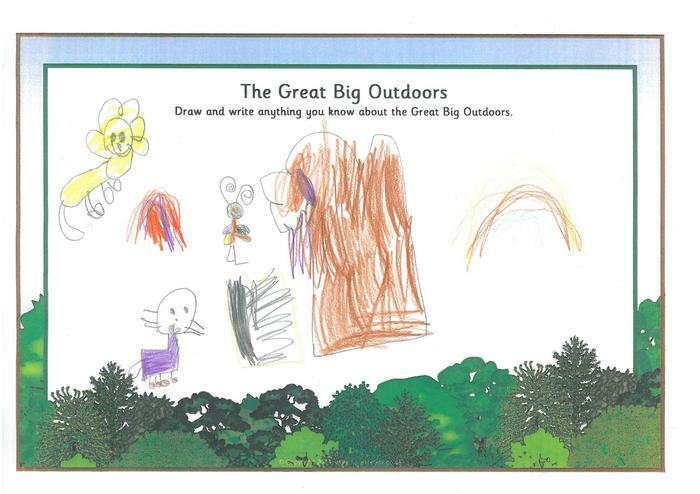 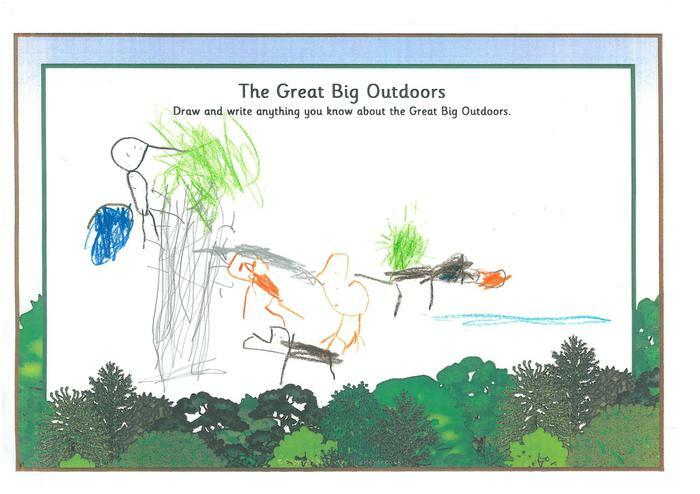 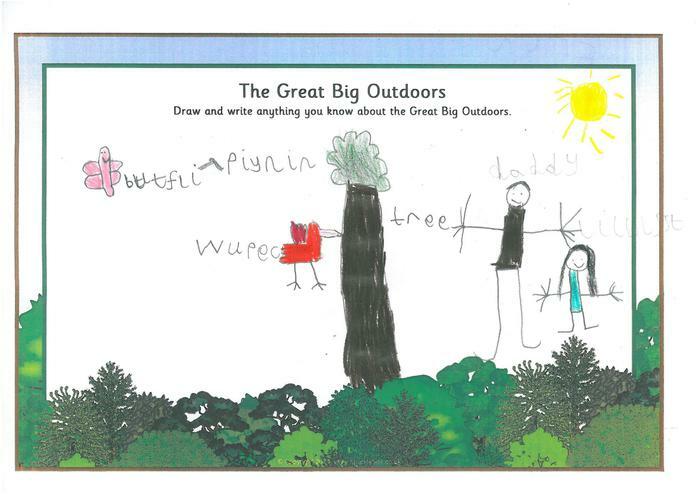 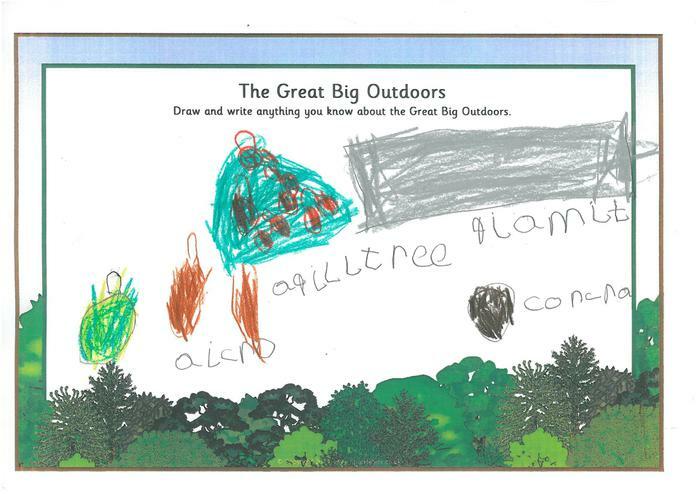 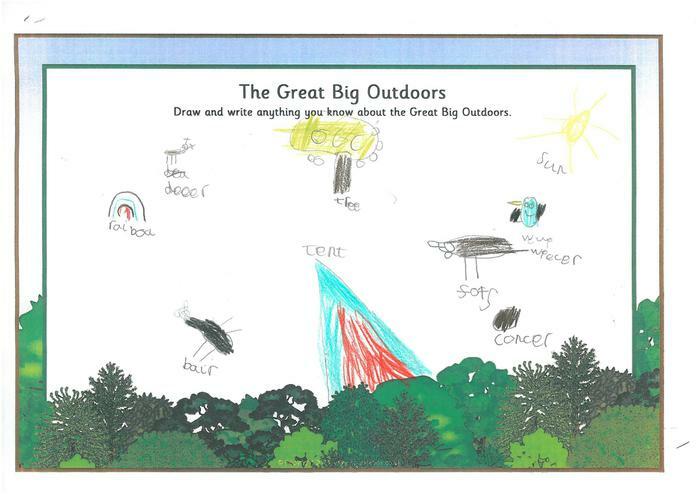 What might we find in the Great Big Outdoors? 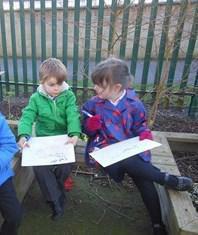 We have been sharing our thoughts and ideas and we then drew our ideas. 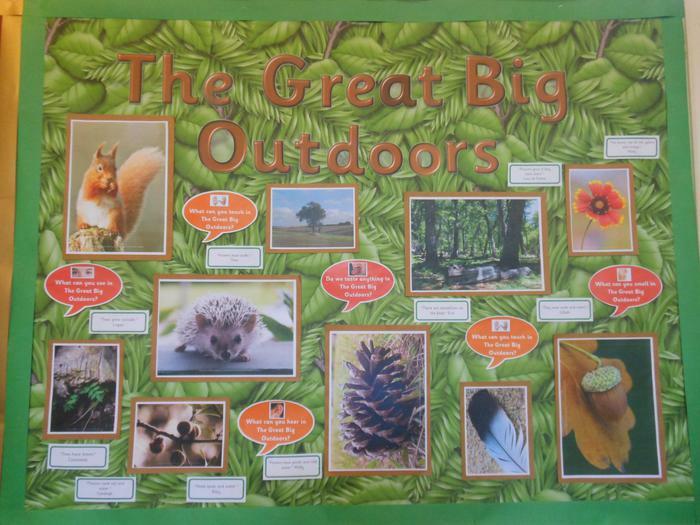 We will be growing seeds, developing our garden area and learning about trees, garden and wild flowers. 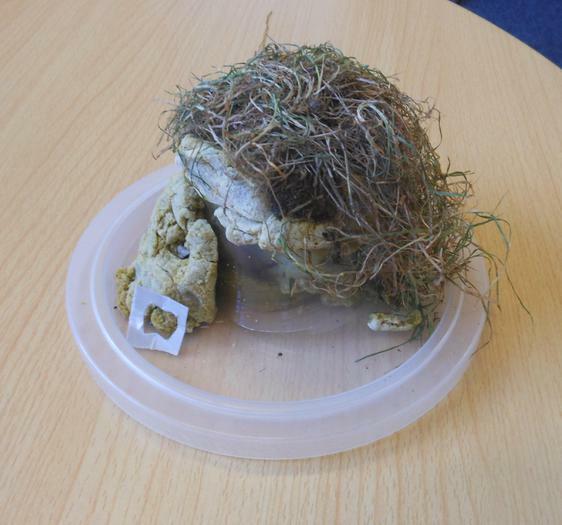 Ever wondered what happens to a plant if it is put in a dark cupboard? 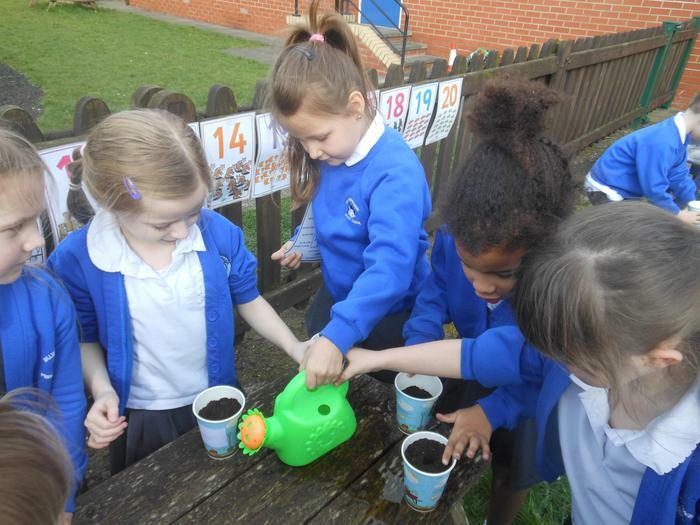 Or if the plant is not regularly watered? 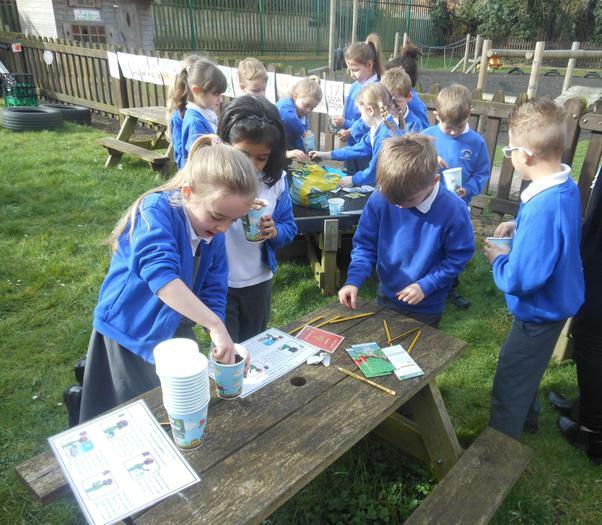 We will be finding out about our local environment and then 'travel' around the 7 continents finding out about different places around the world. 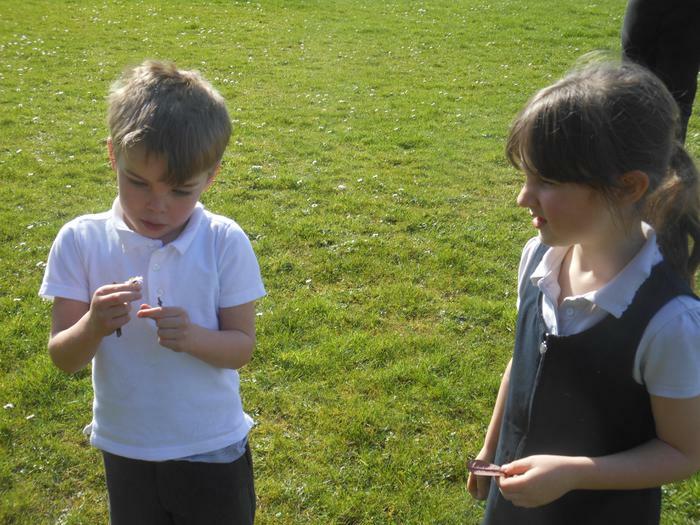 as we explore objects found in The Great Big Outdoors.